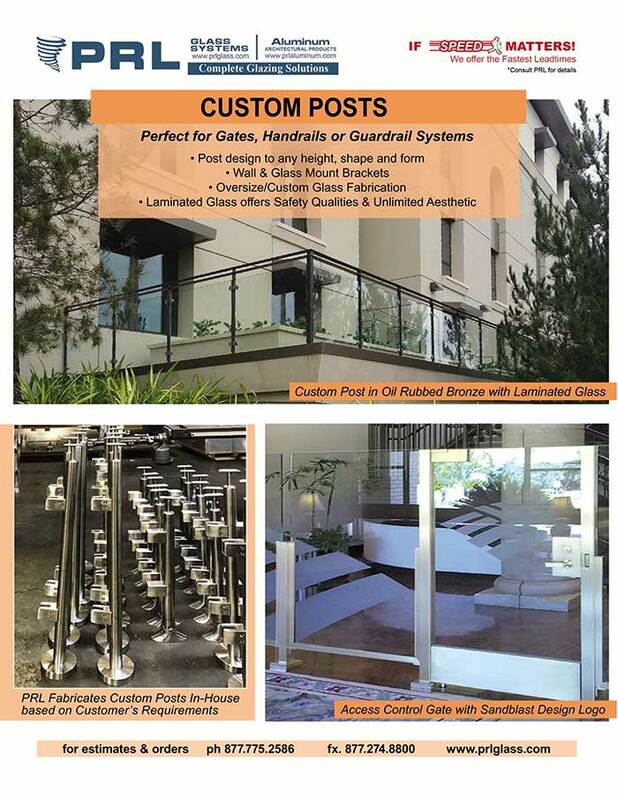 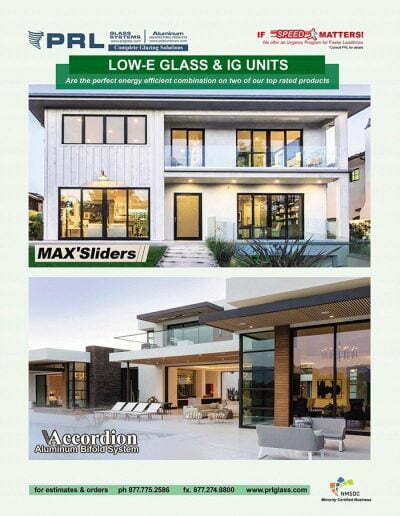 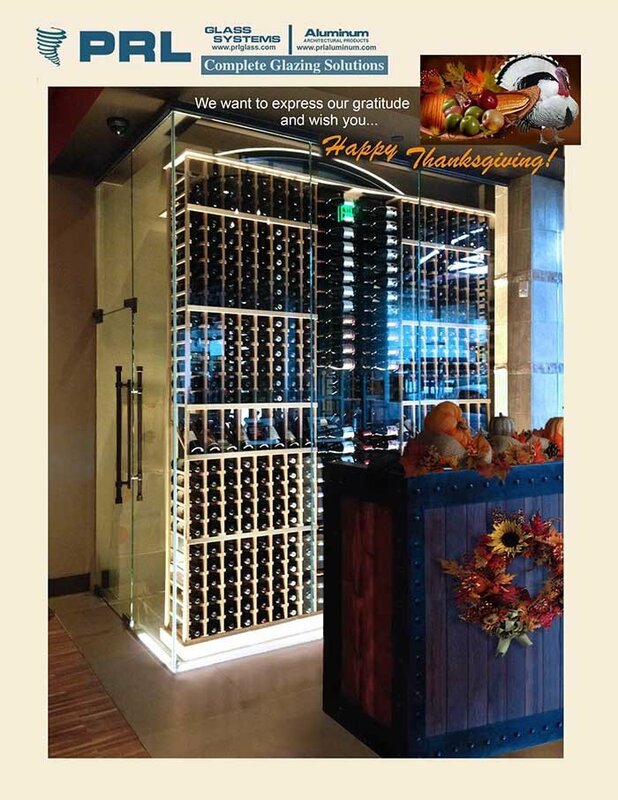 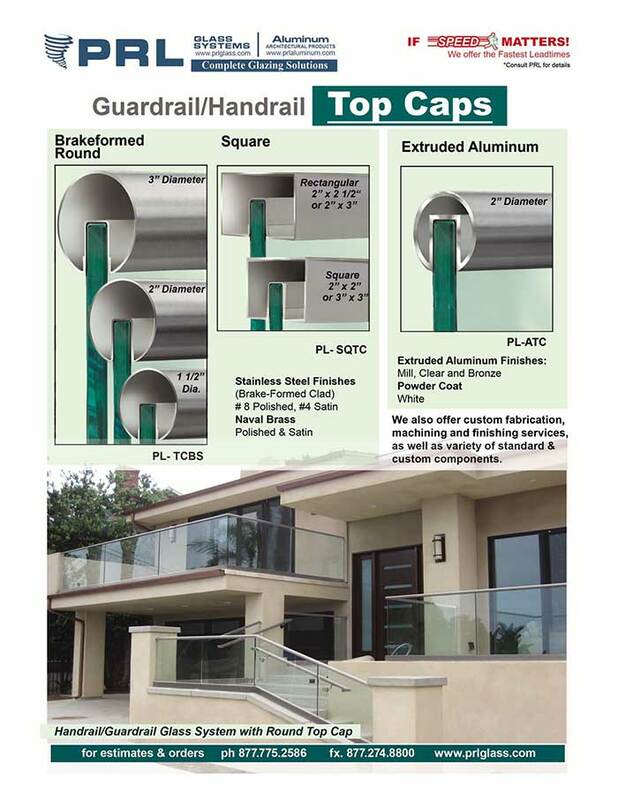 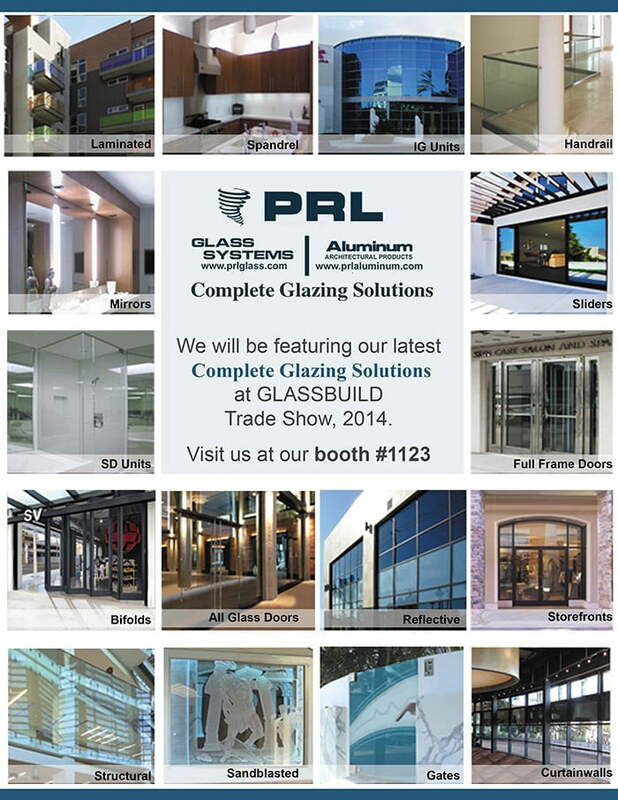 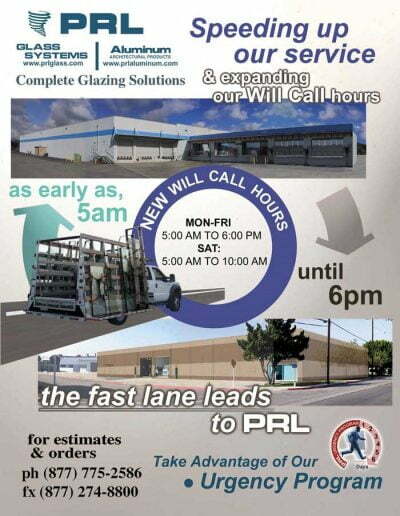 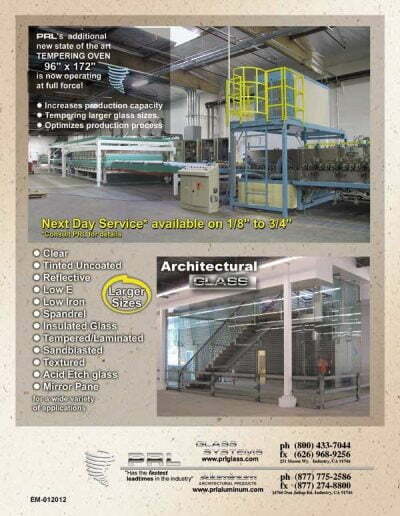 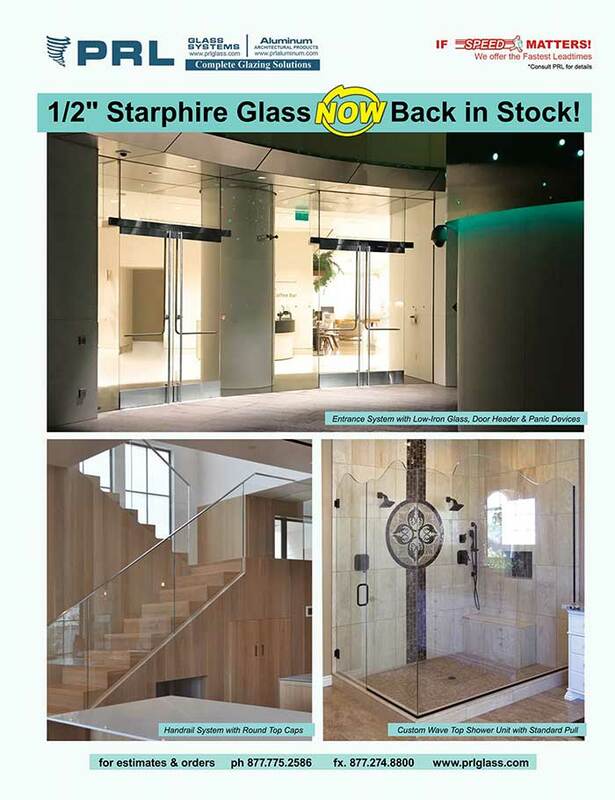 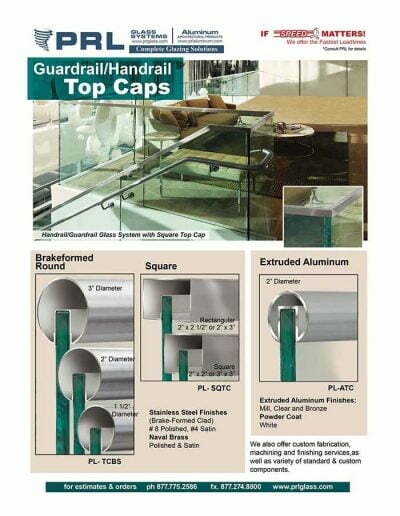 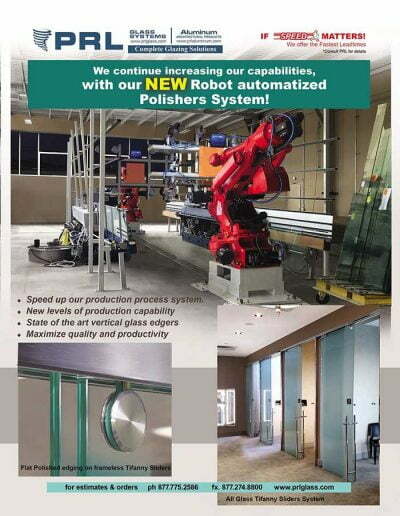 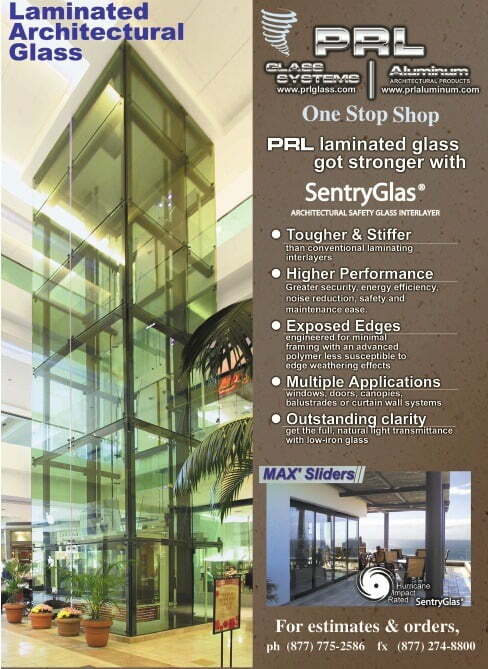 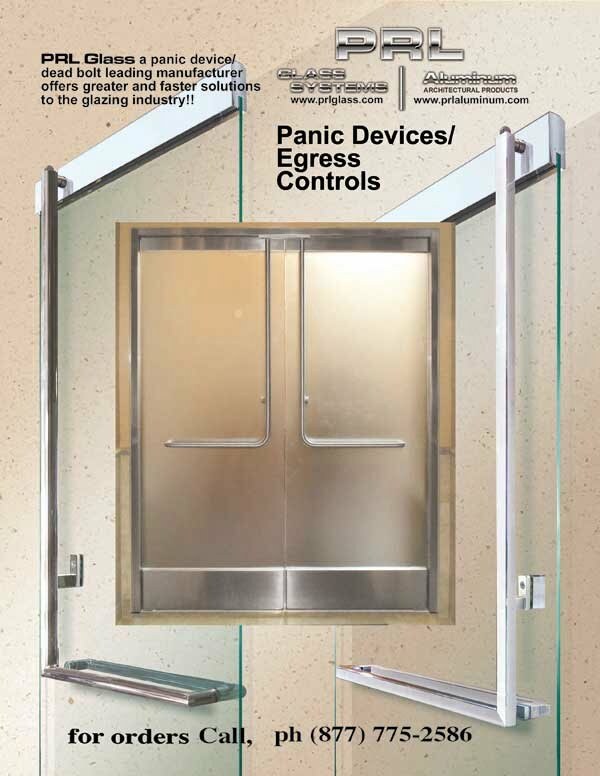 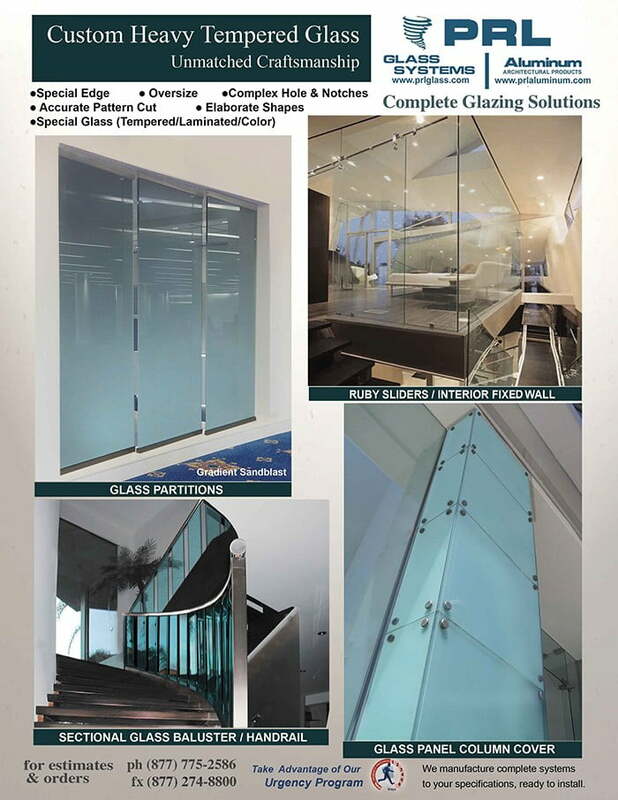 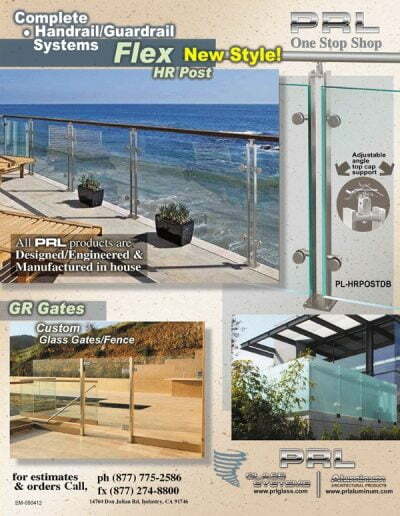 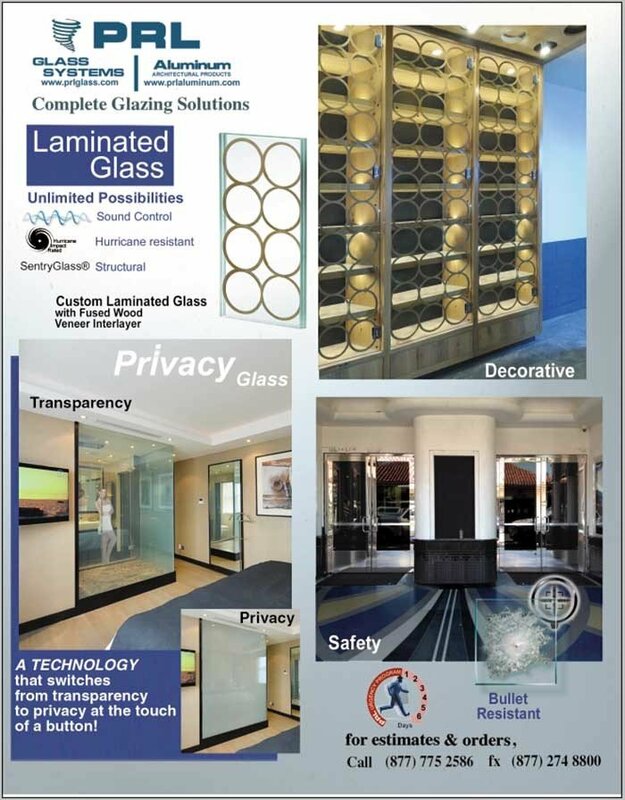 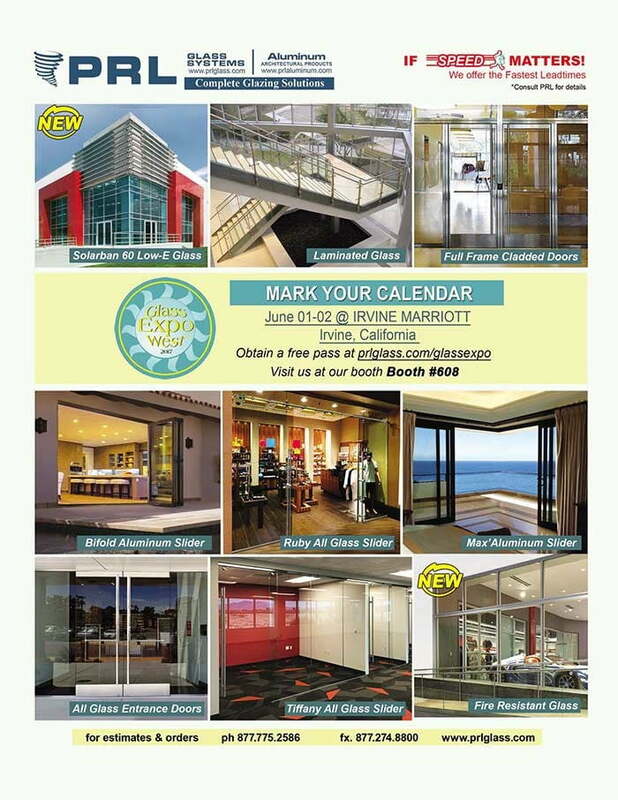 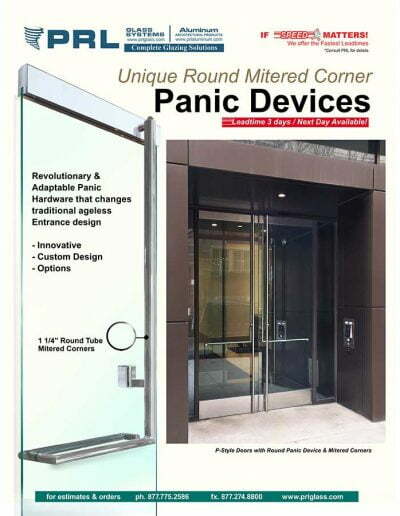 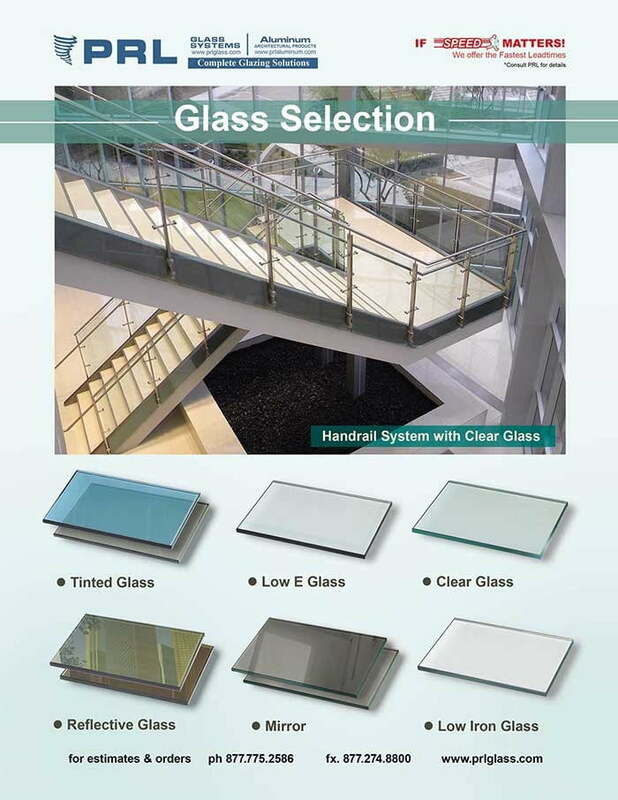 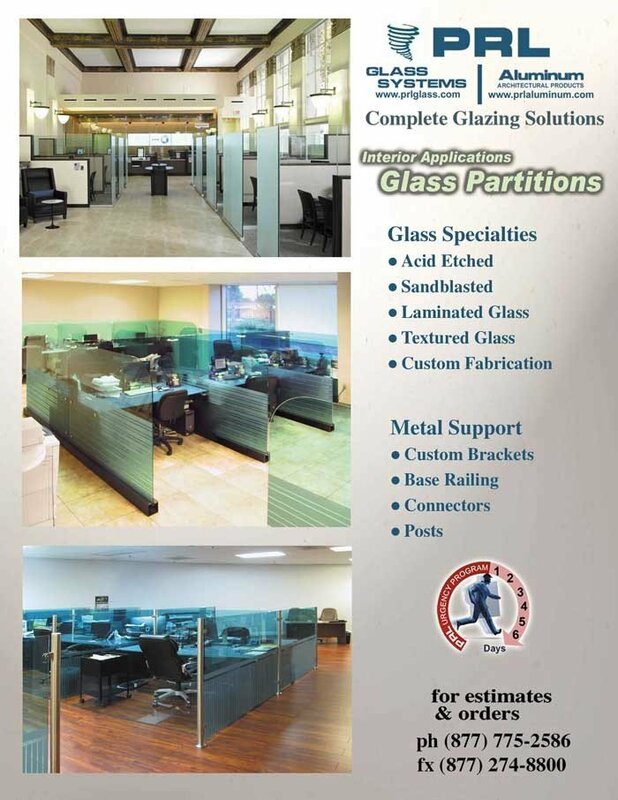 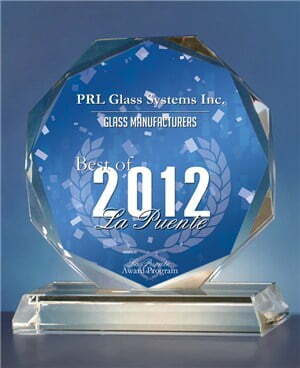 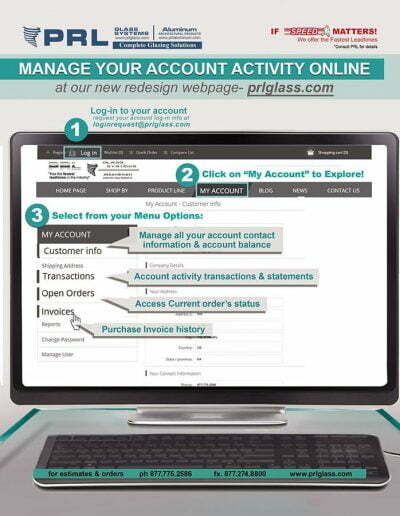 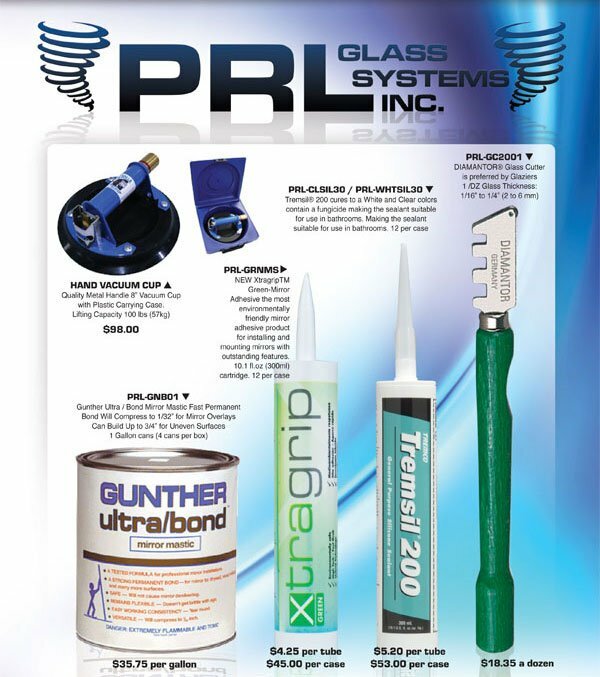 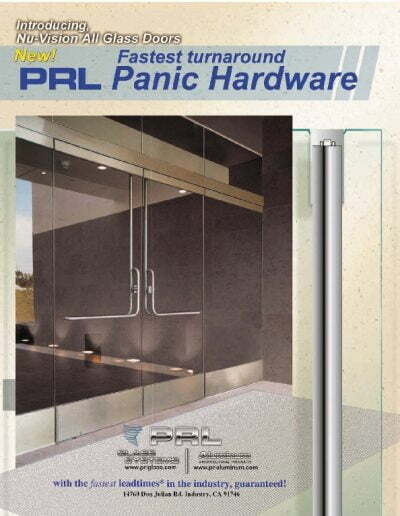 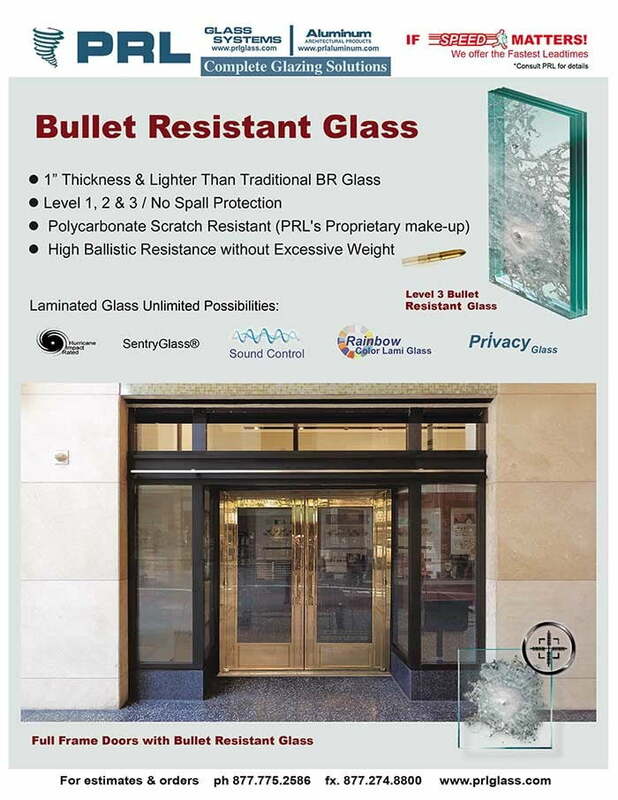 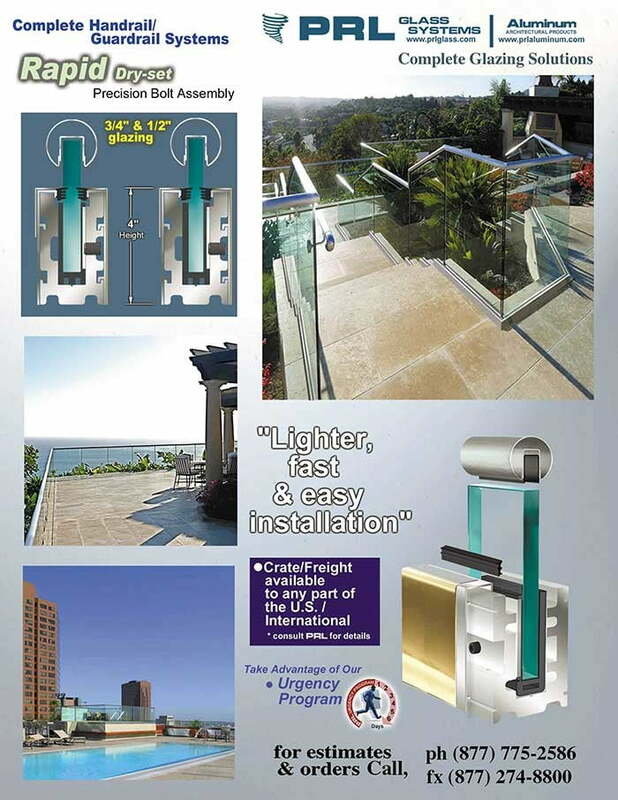 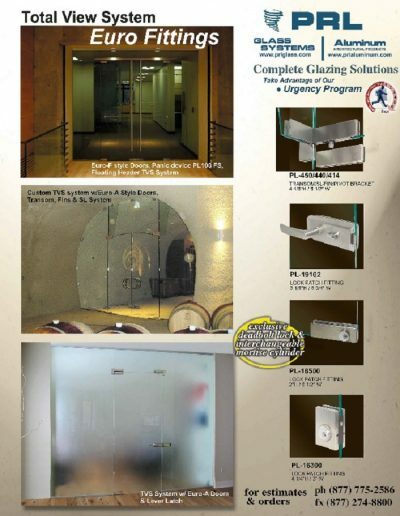 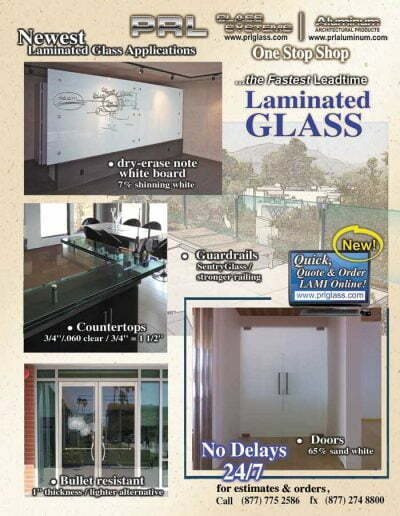 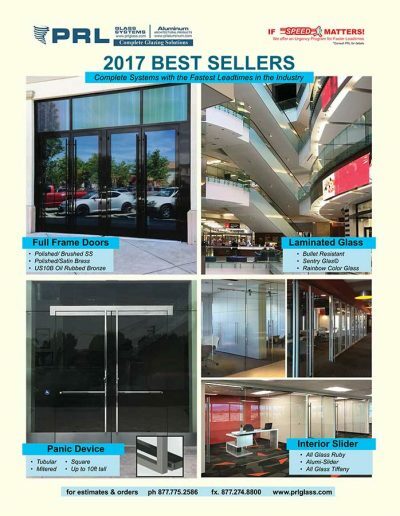 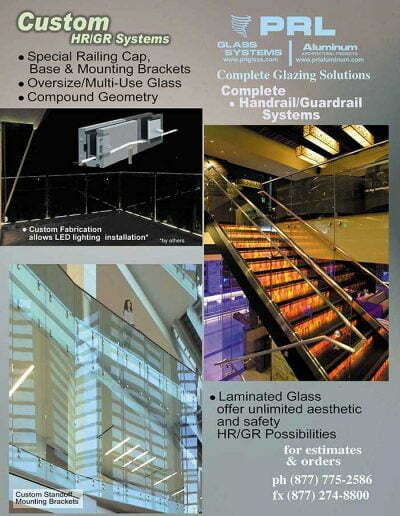 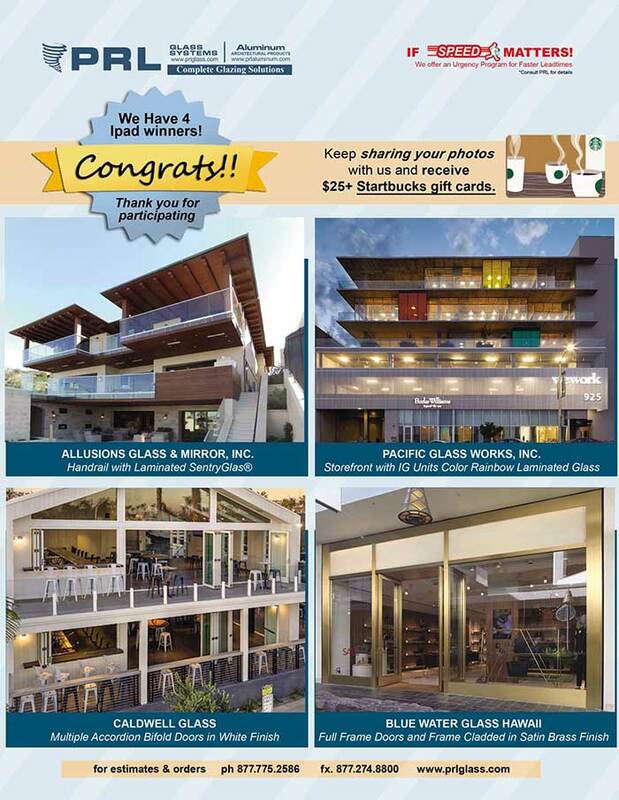 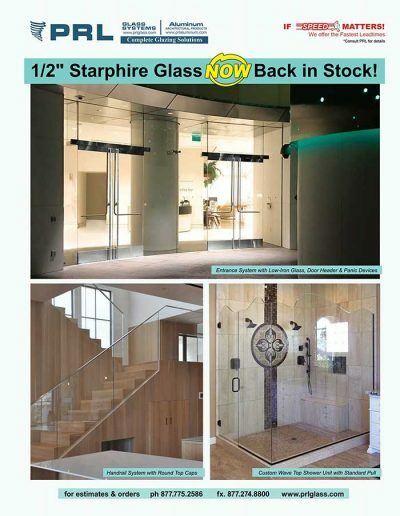 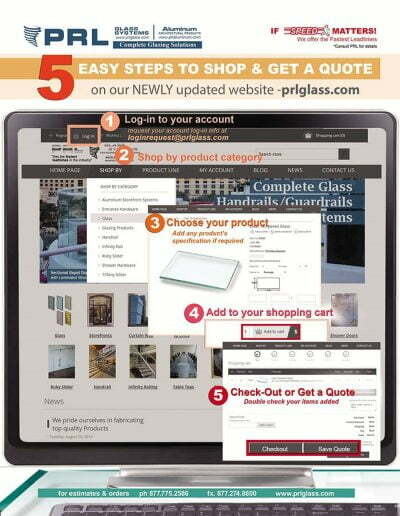 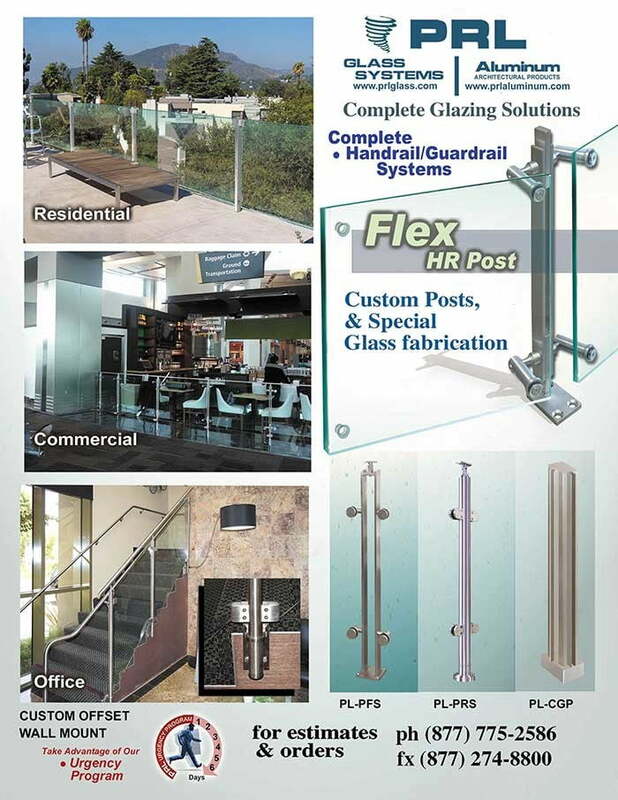 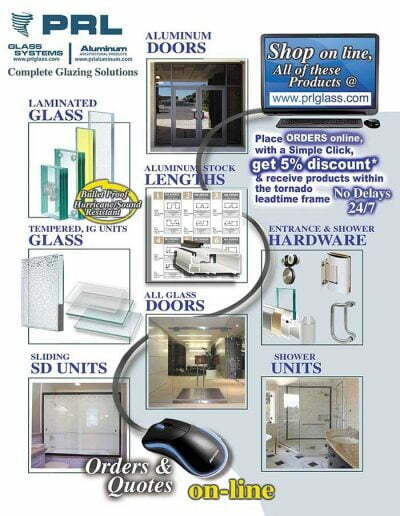 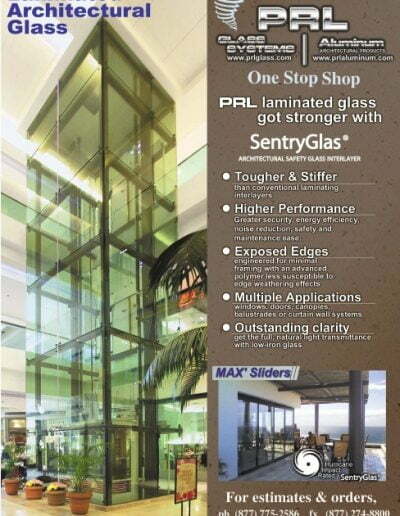 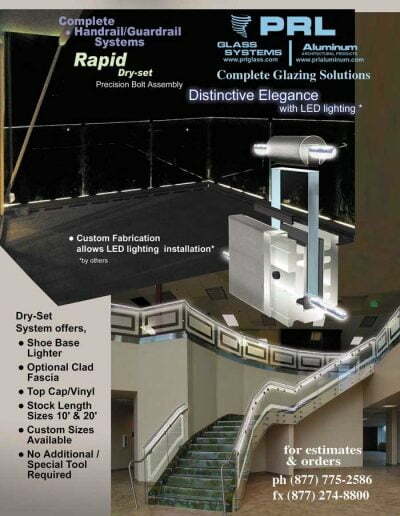 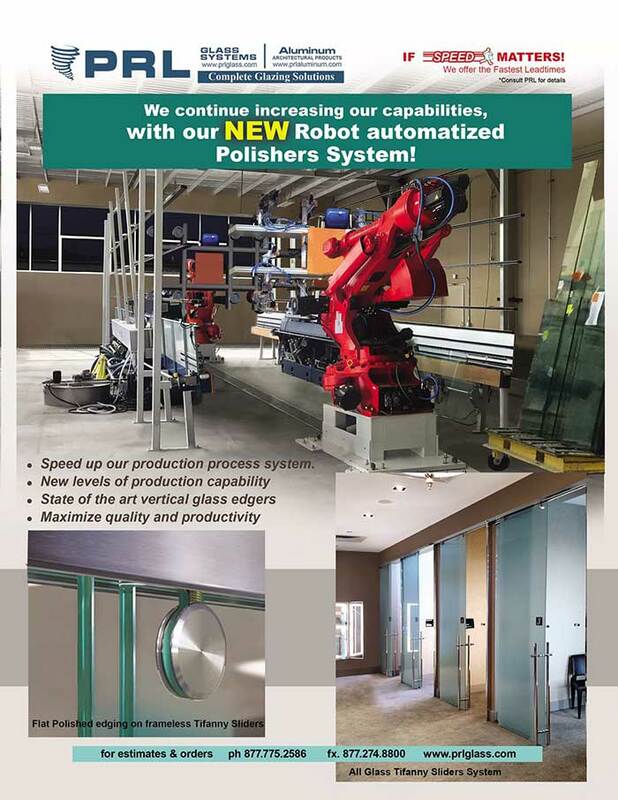 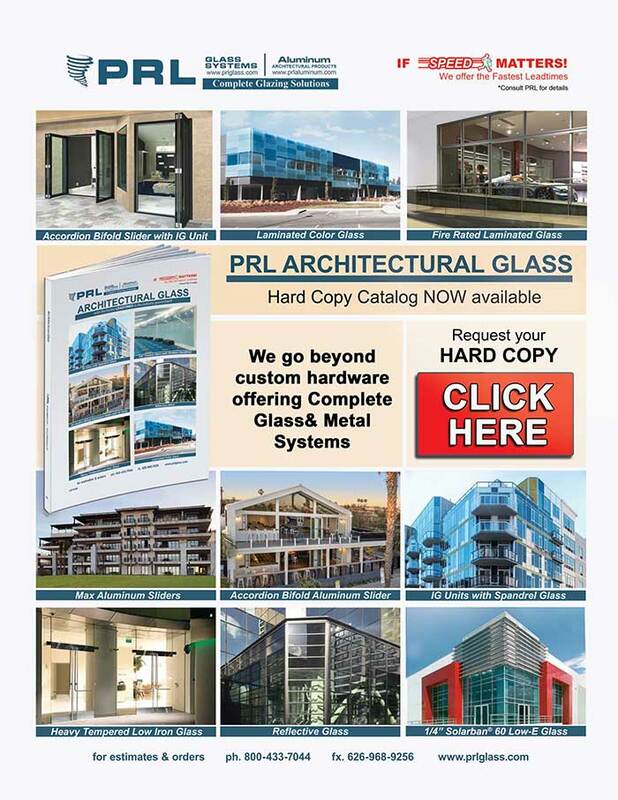 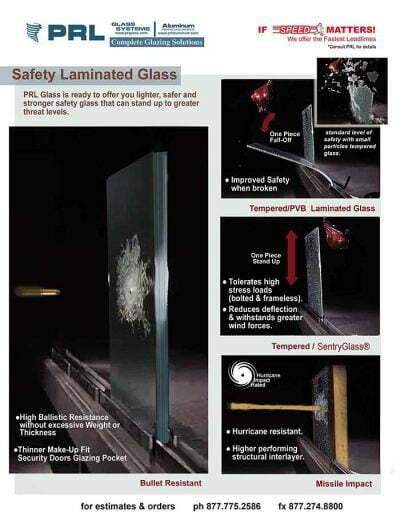 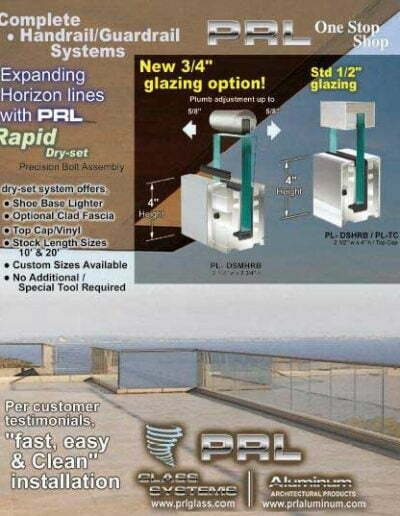 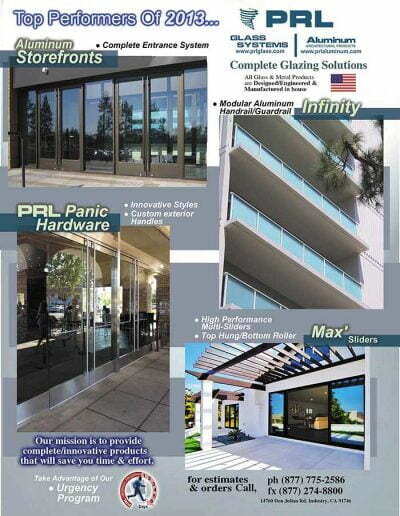 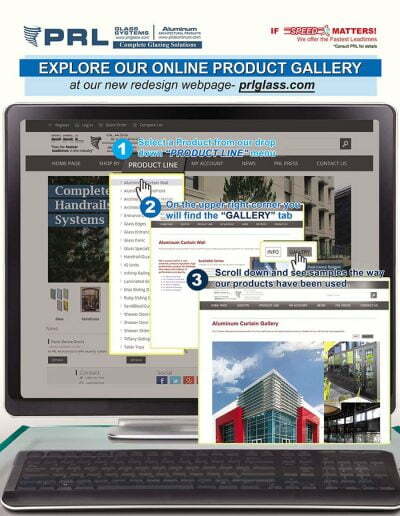 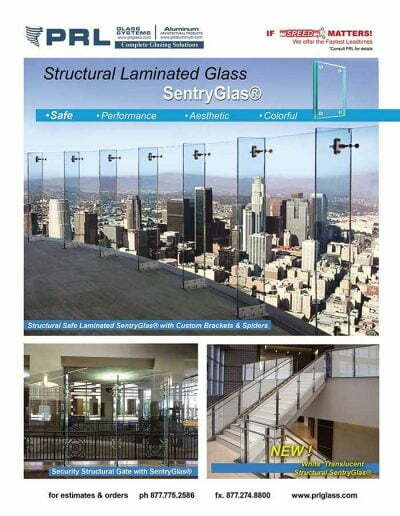 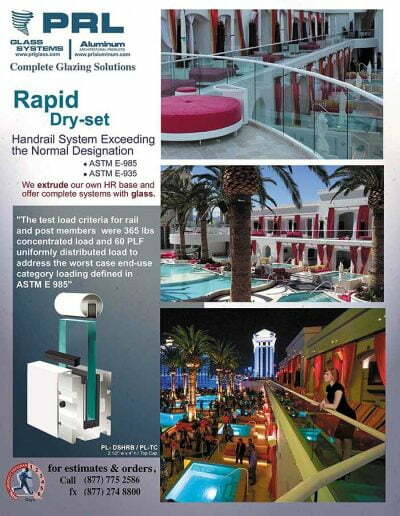 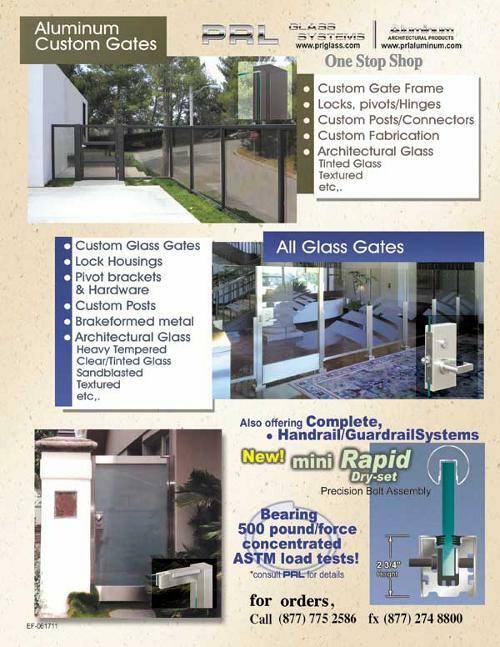 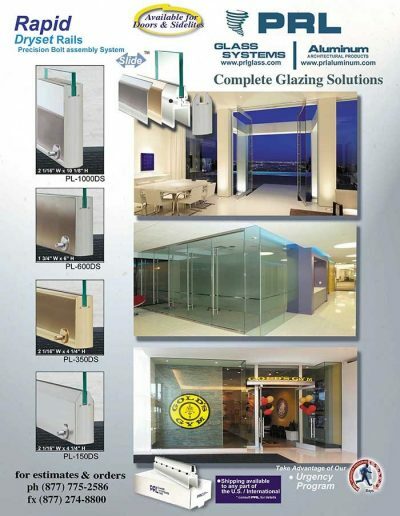 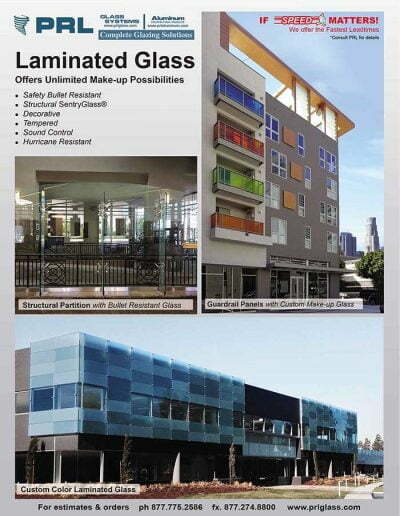 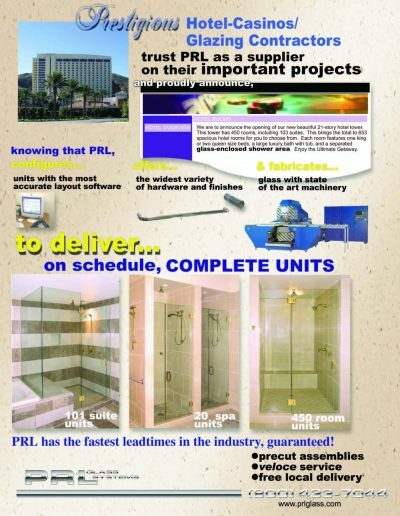 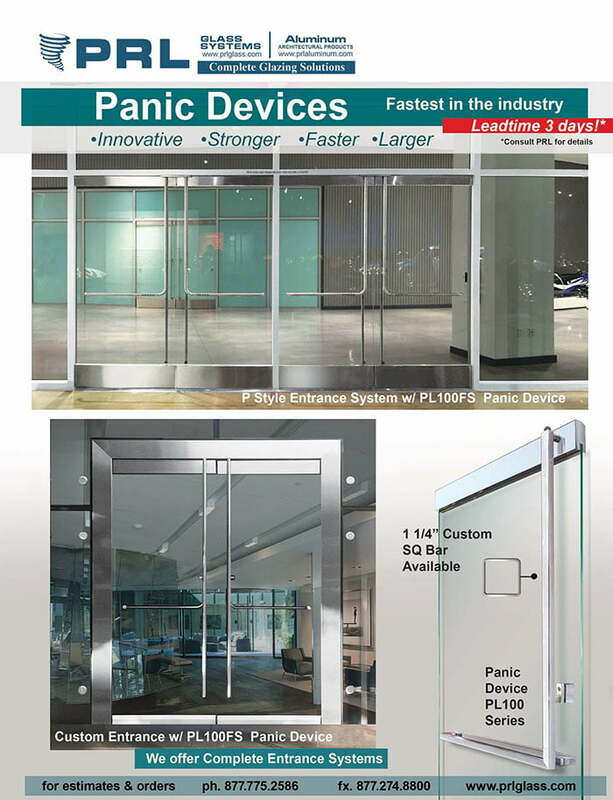 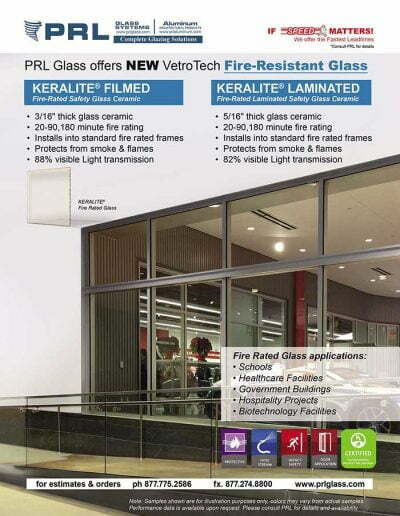 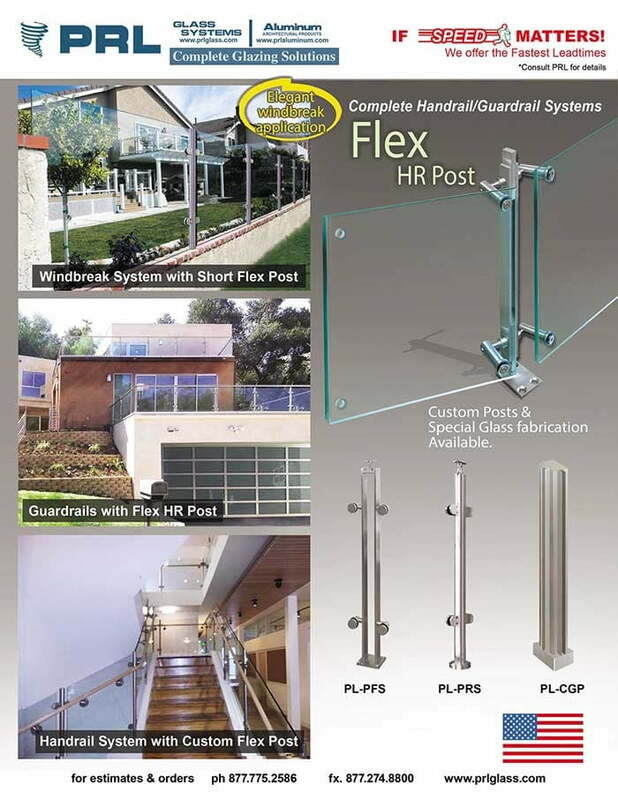 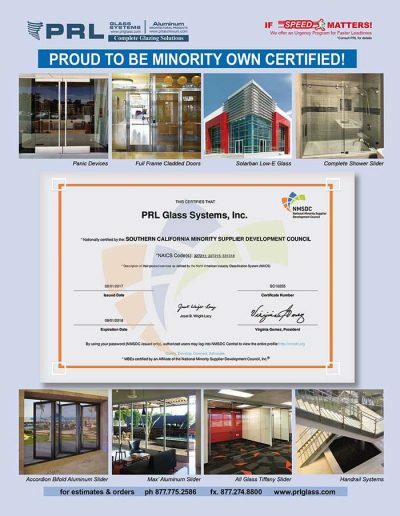 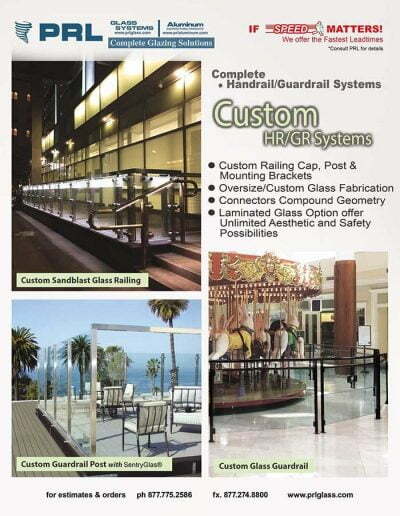 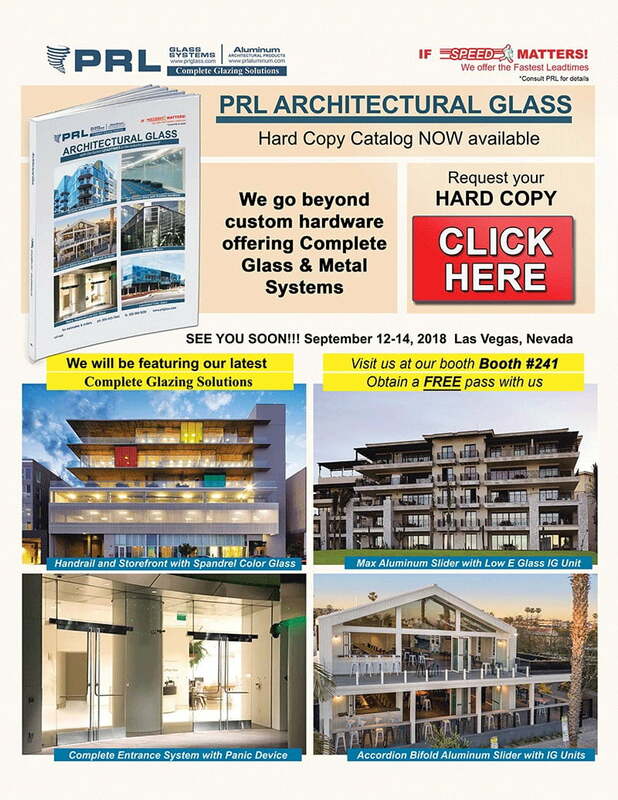 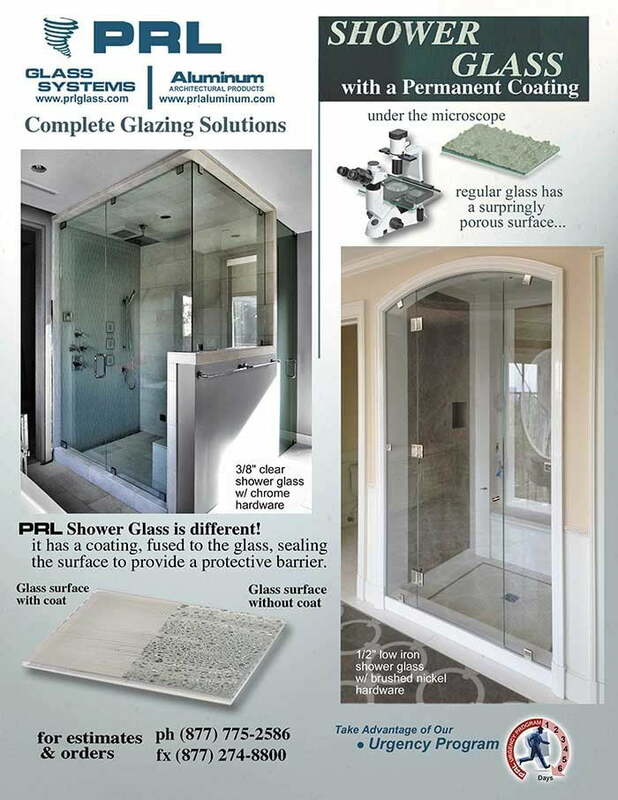 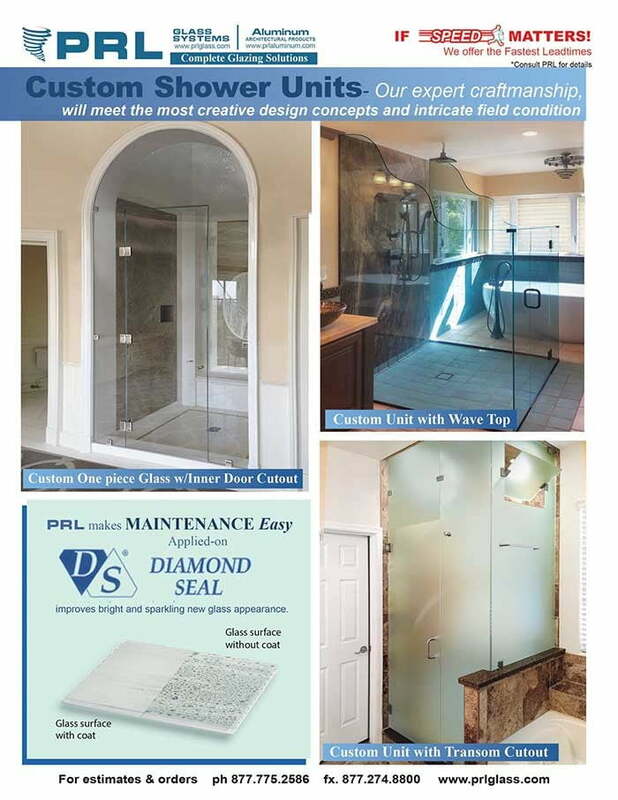 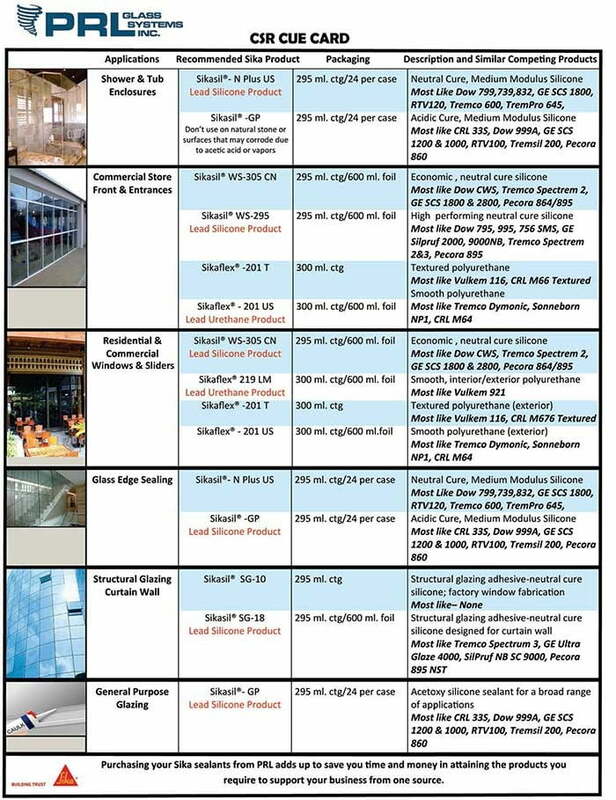 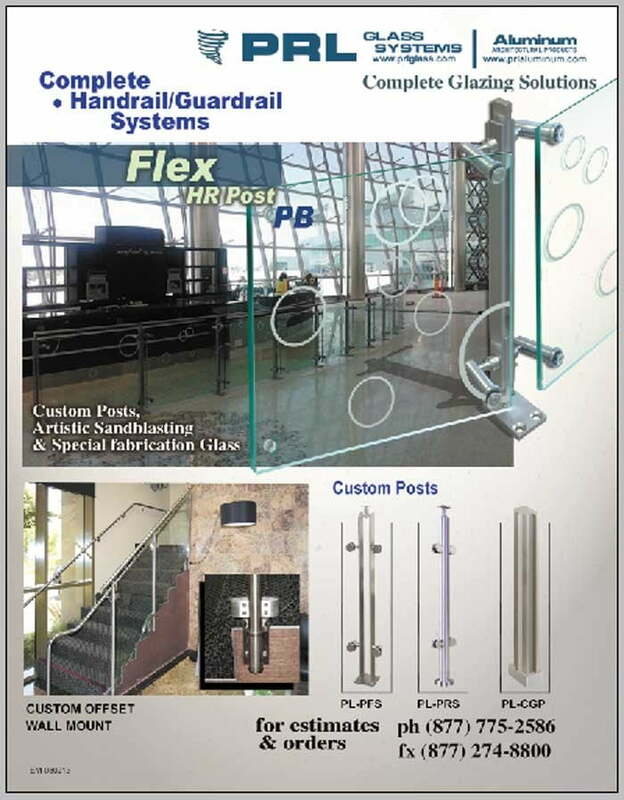 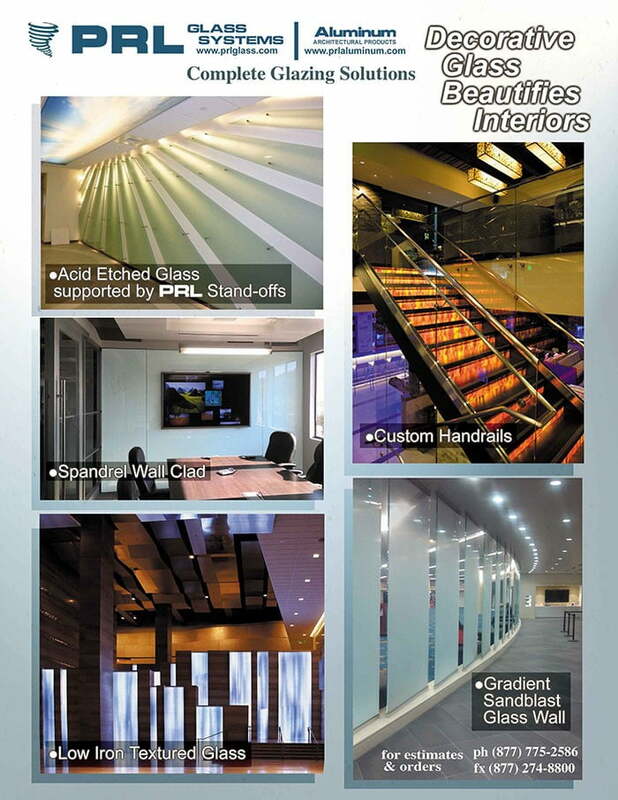 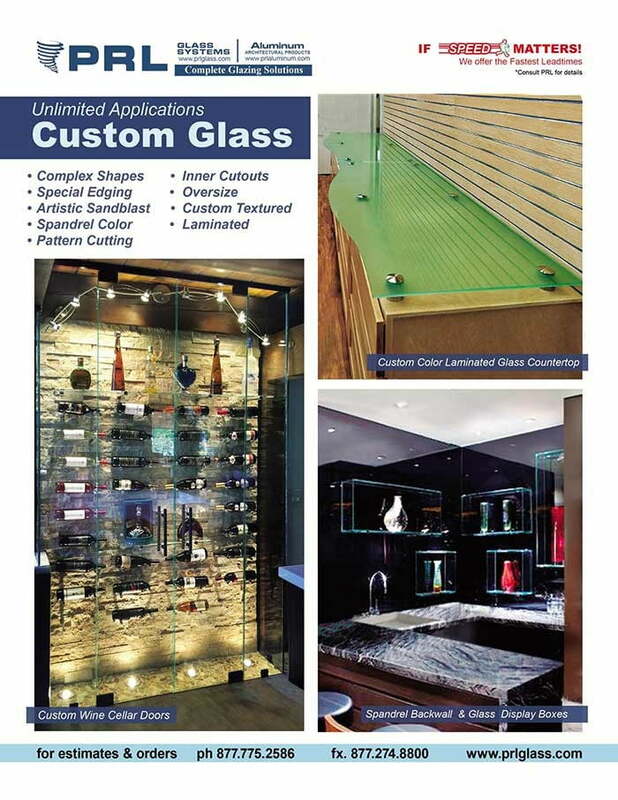 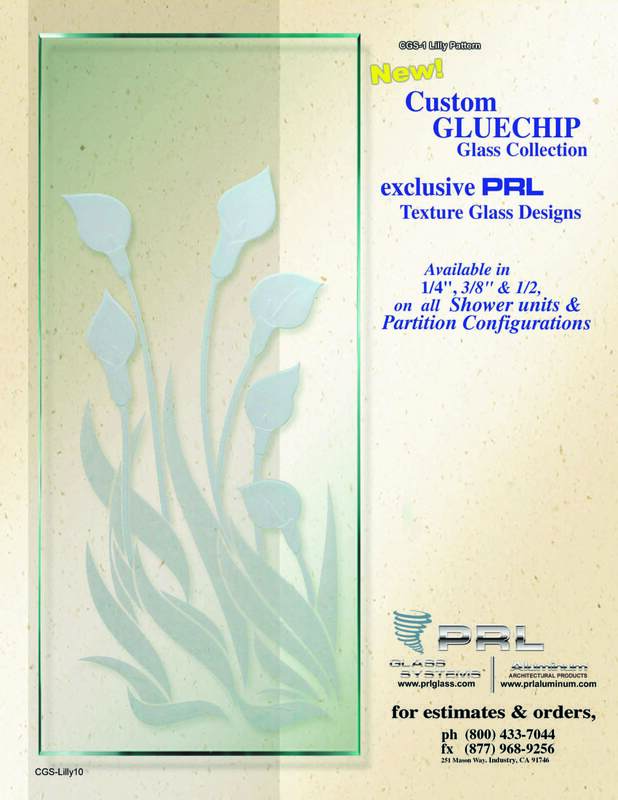 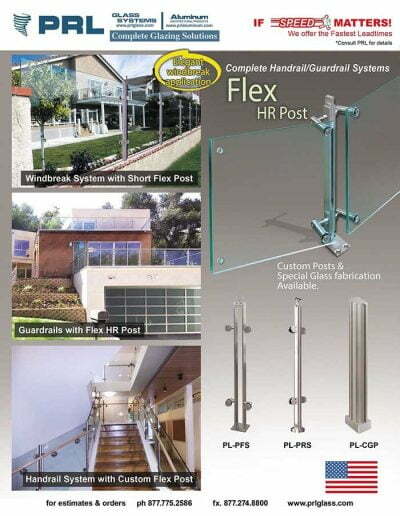 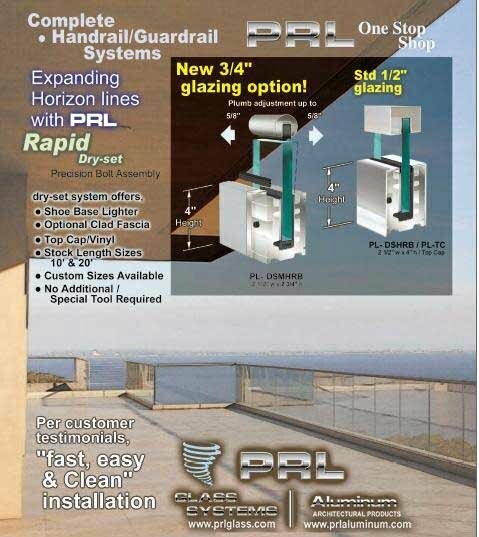 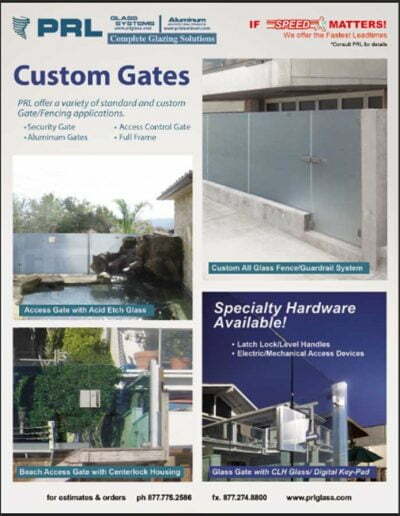 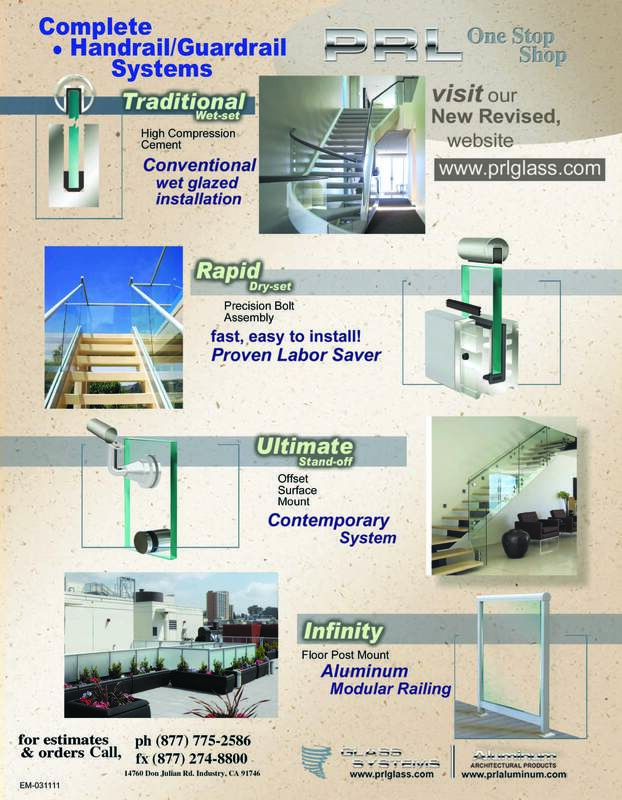 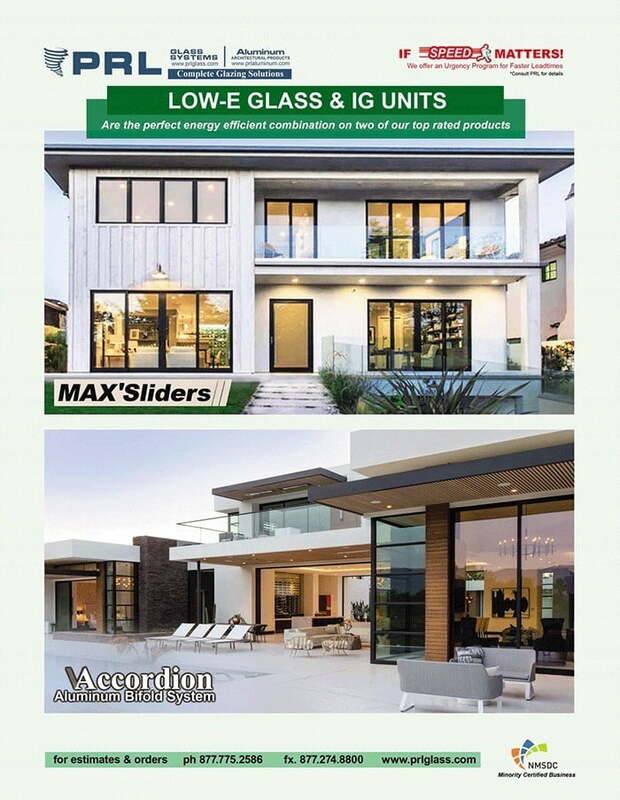 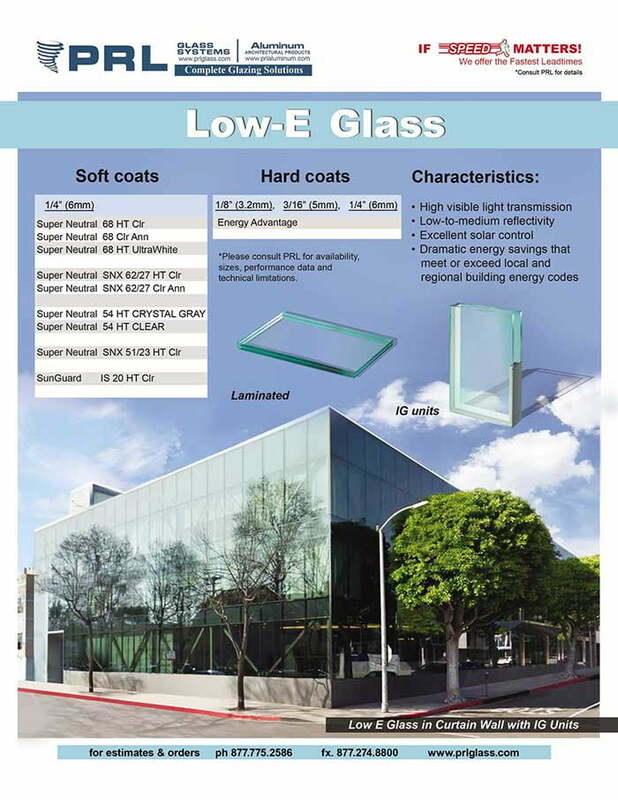 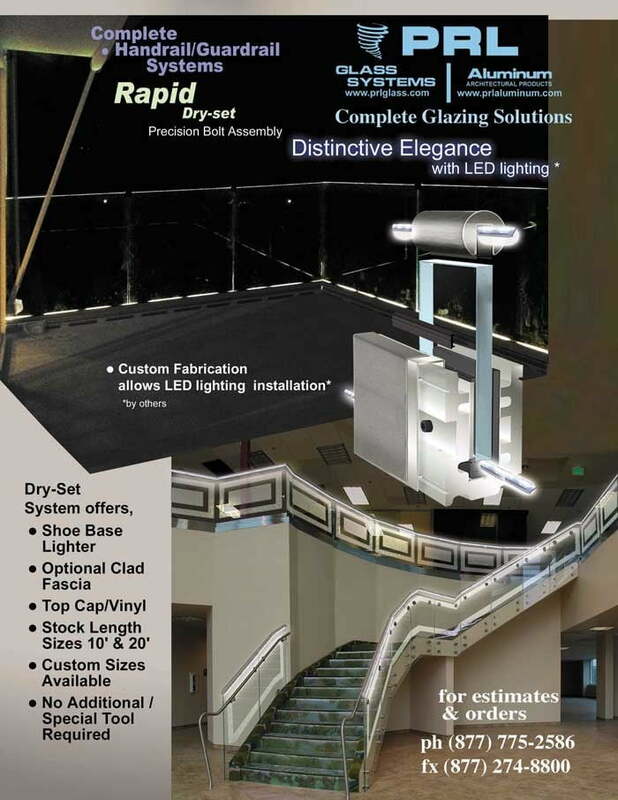 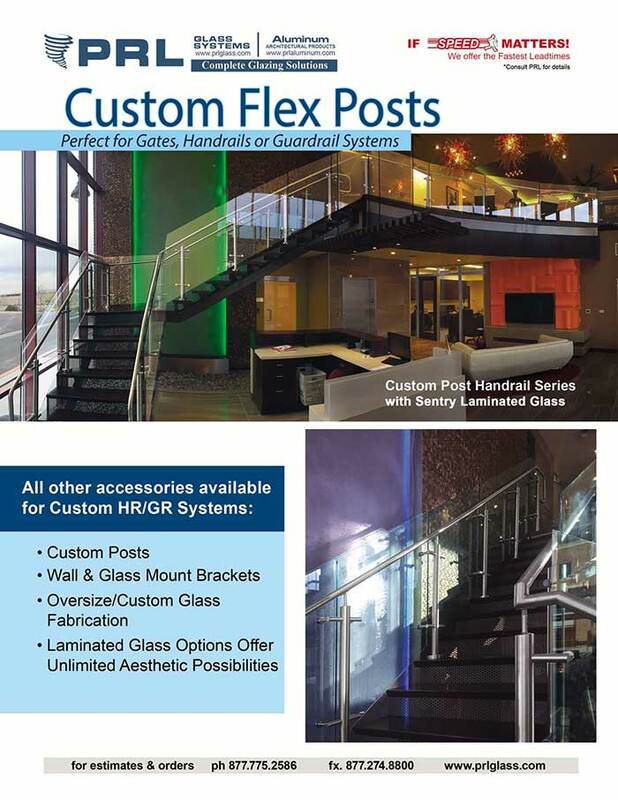 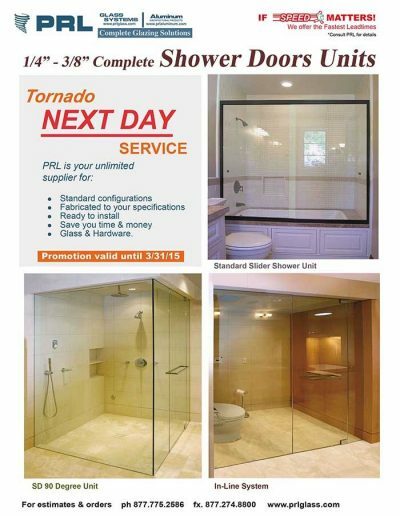 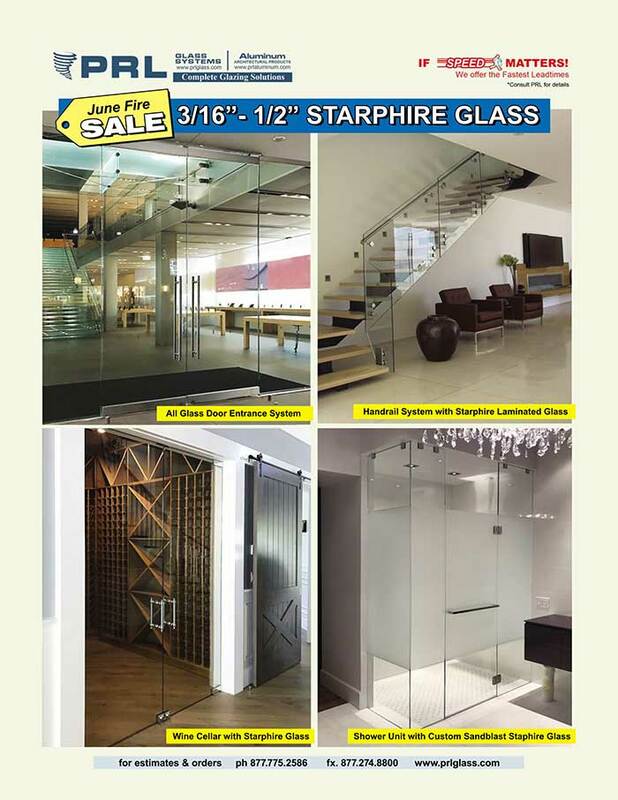 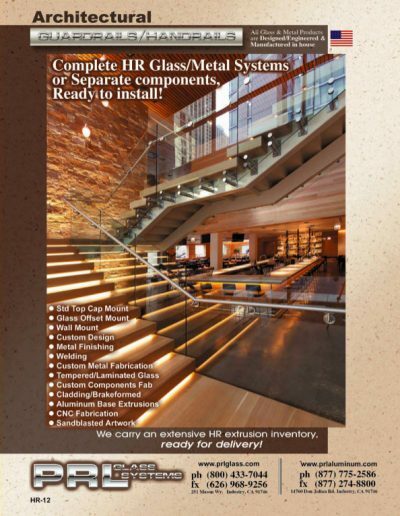 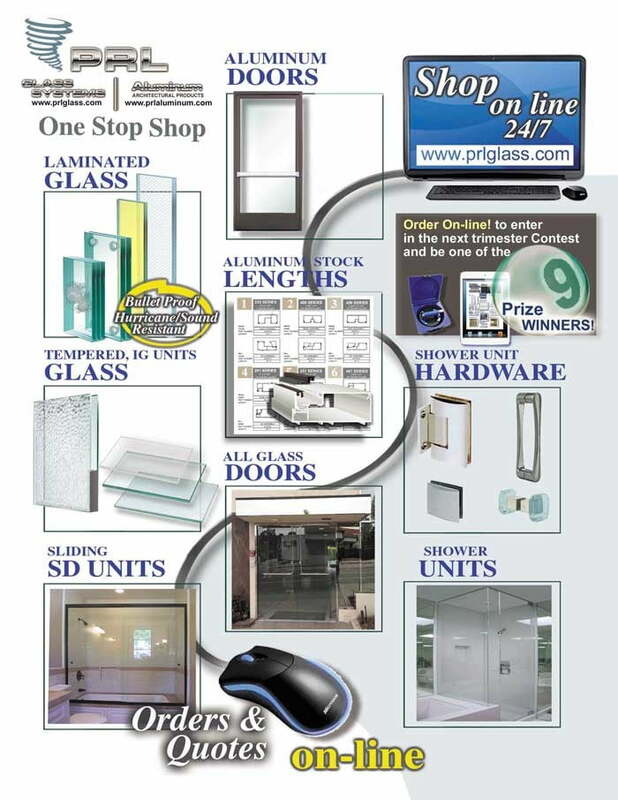 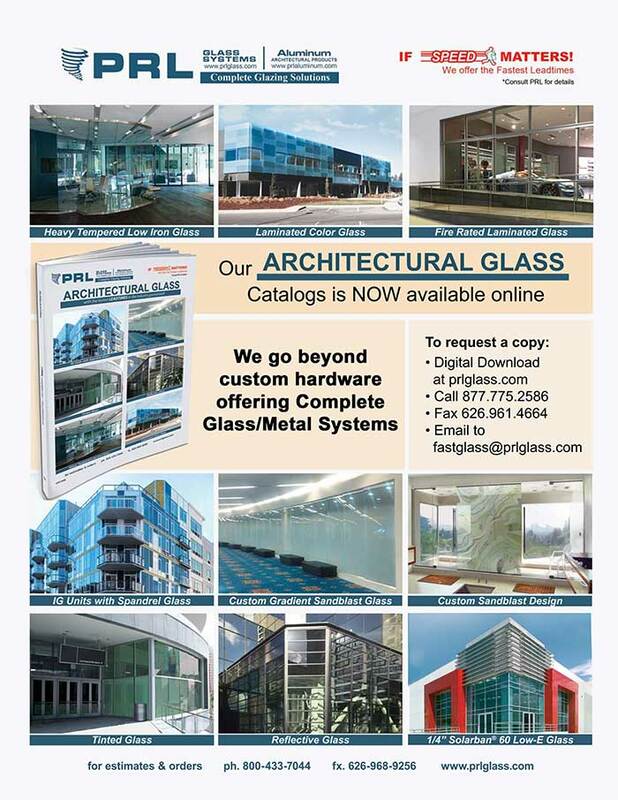 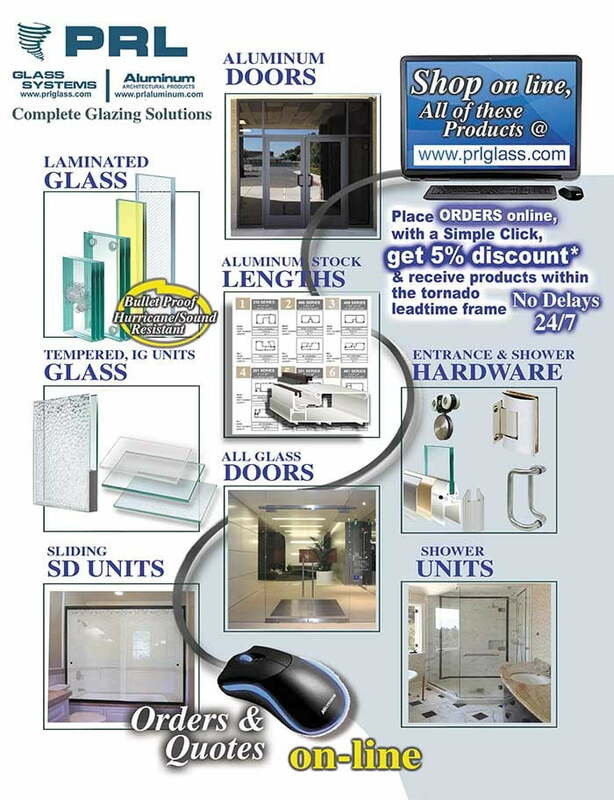 PRL Glass Systems is the leading architectural glass and metal fabricator in Southern California offering a large variety of annealed and tempered glass to meet the industry’s needs. 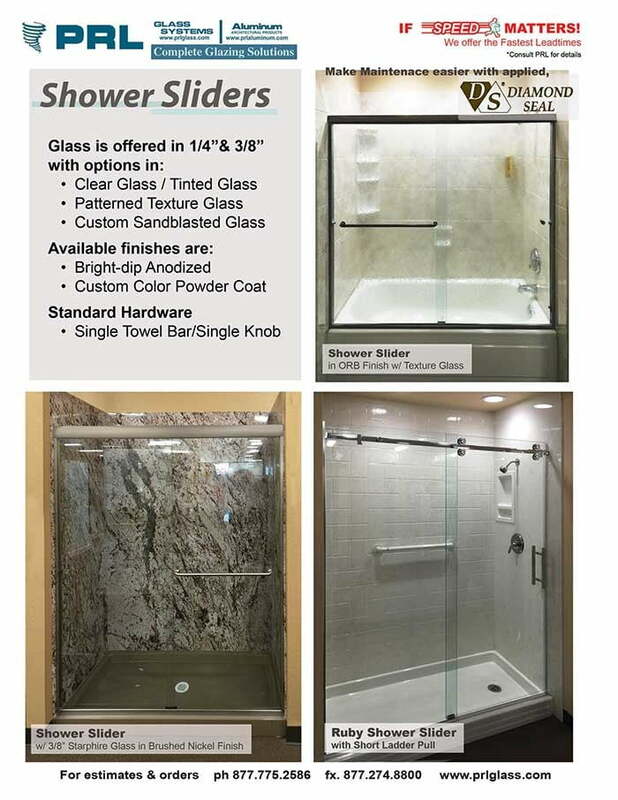 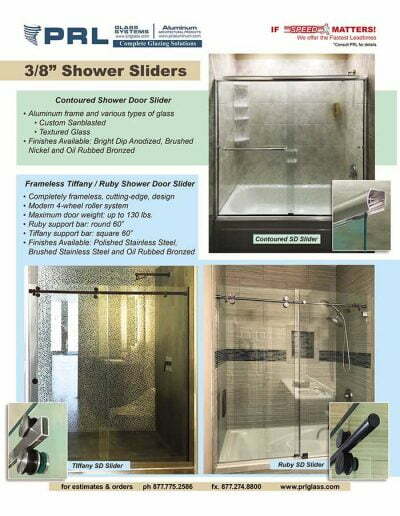 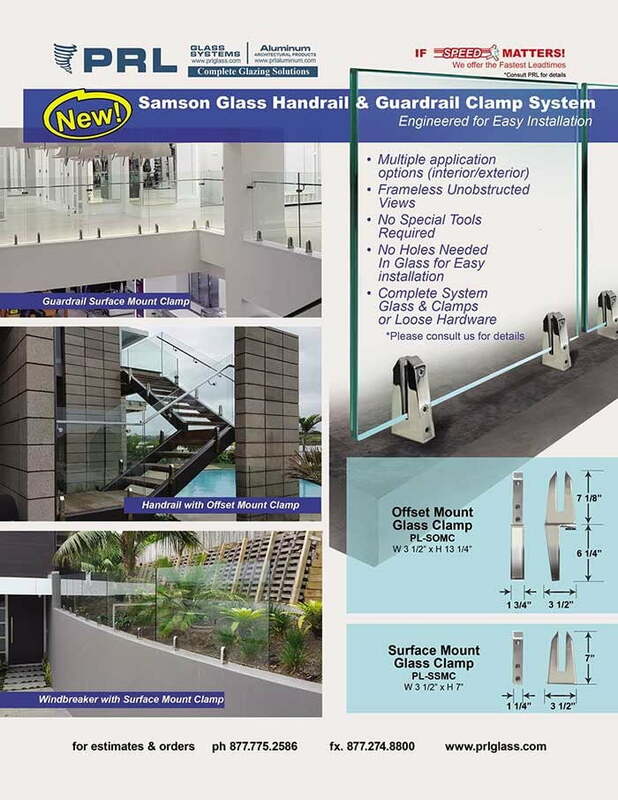 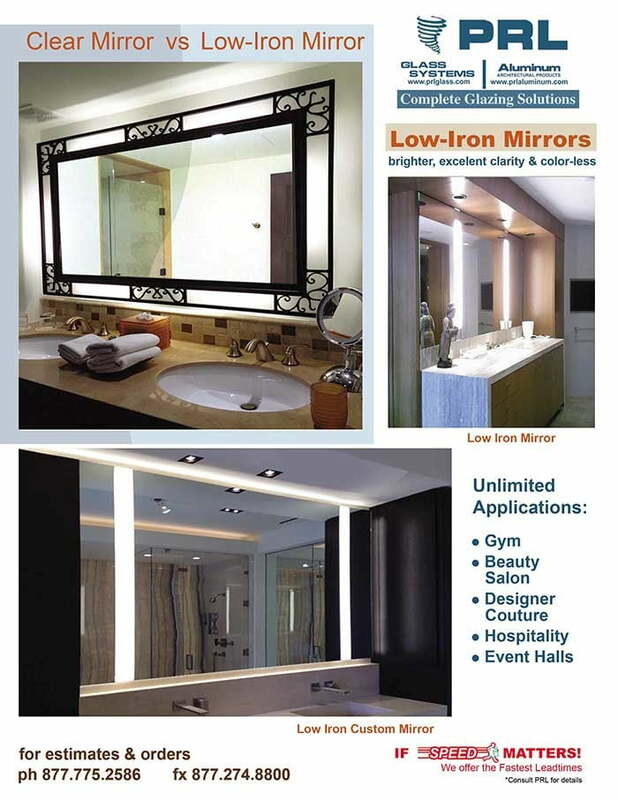 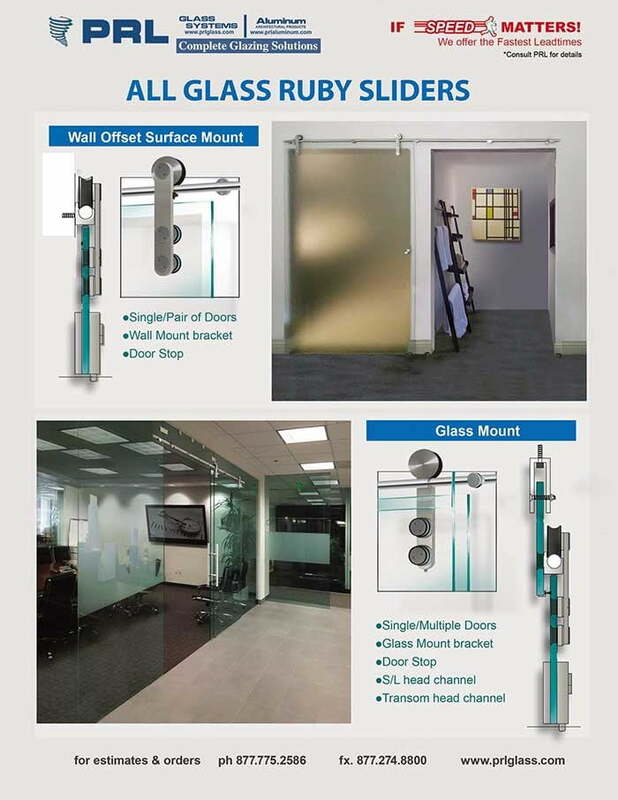 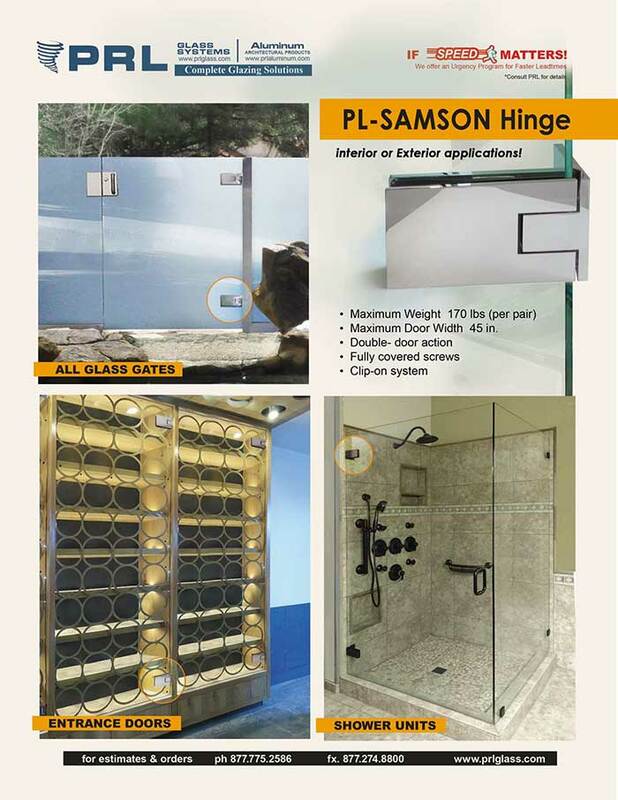 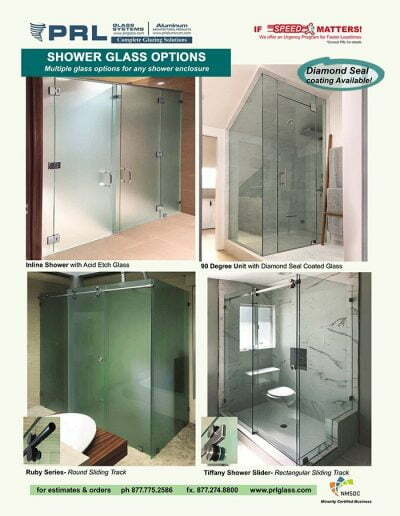 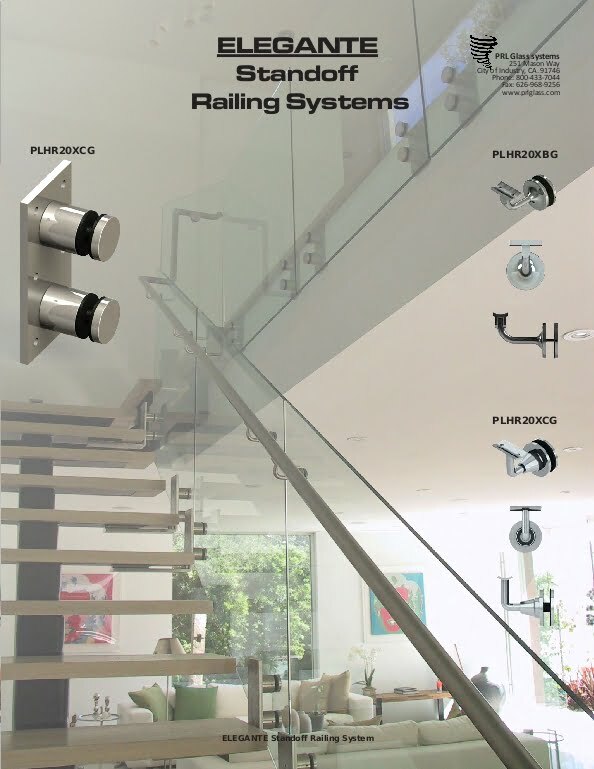 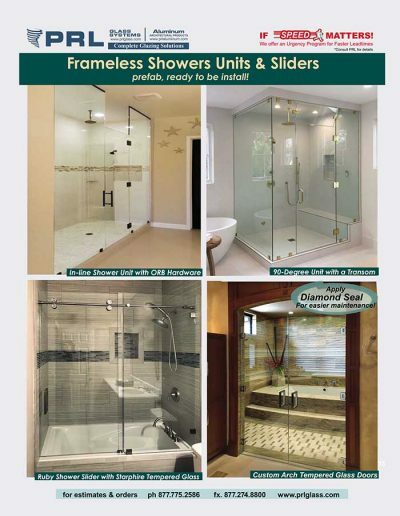 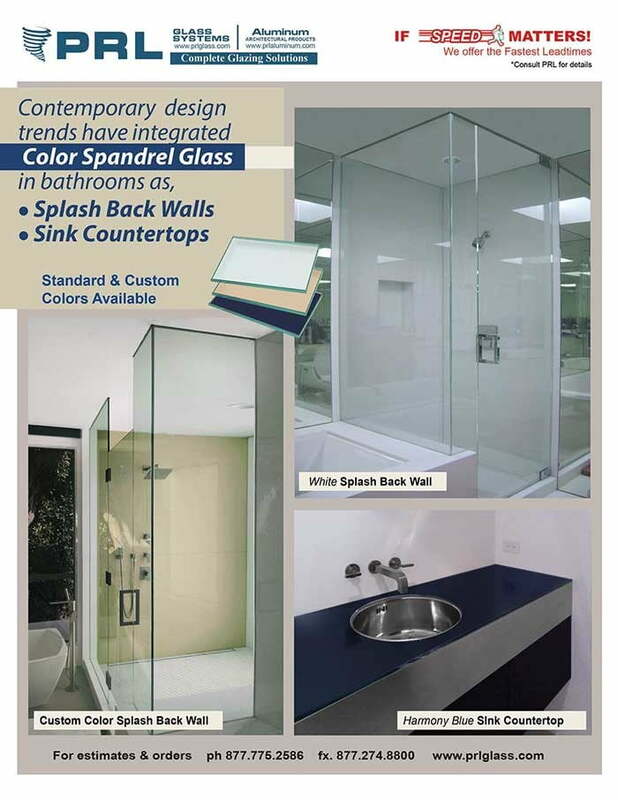 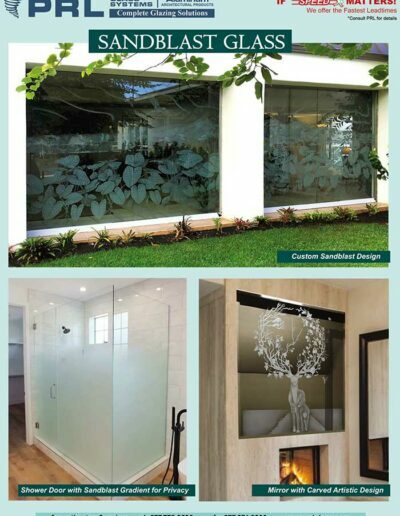 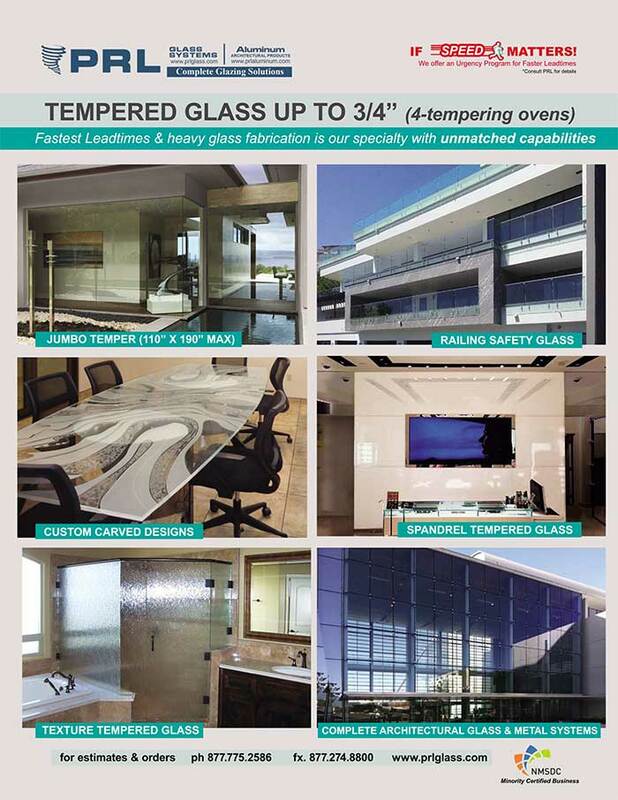 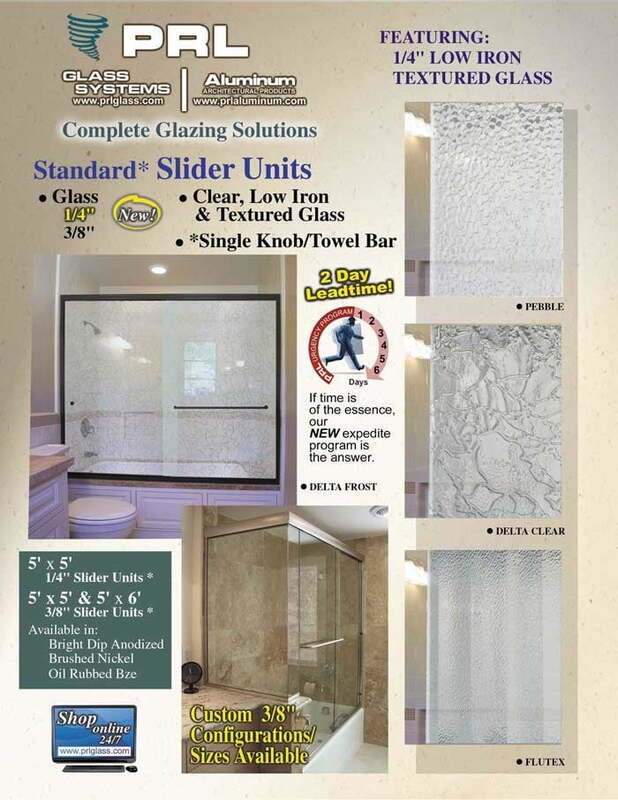 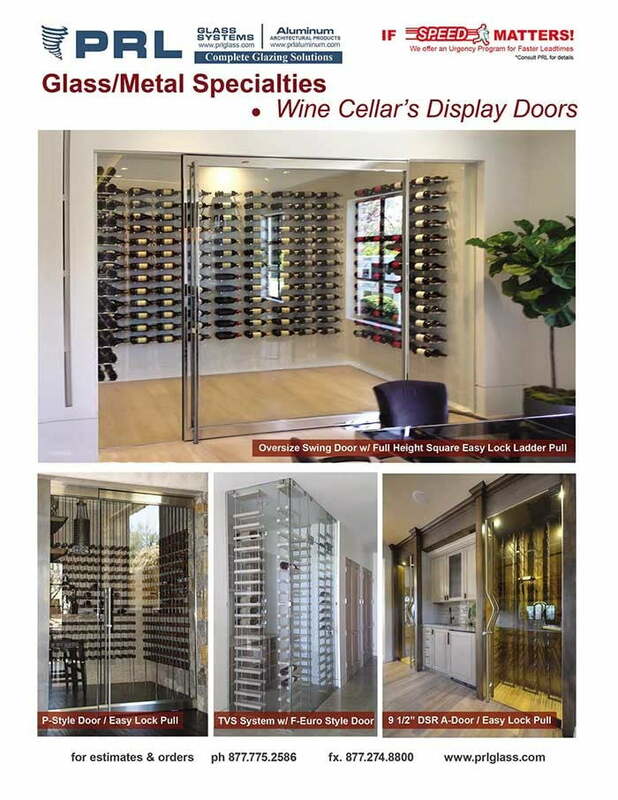 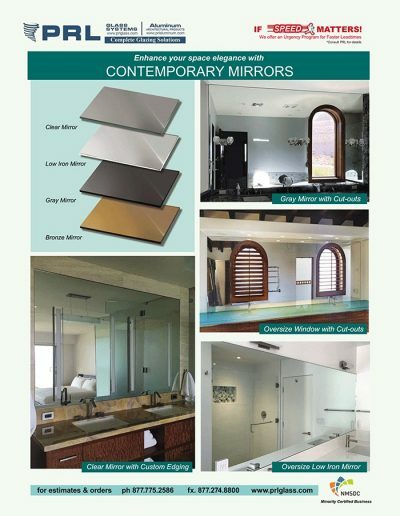 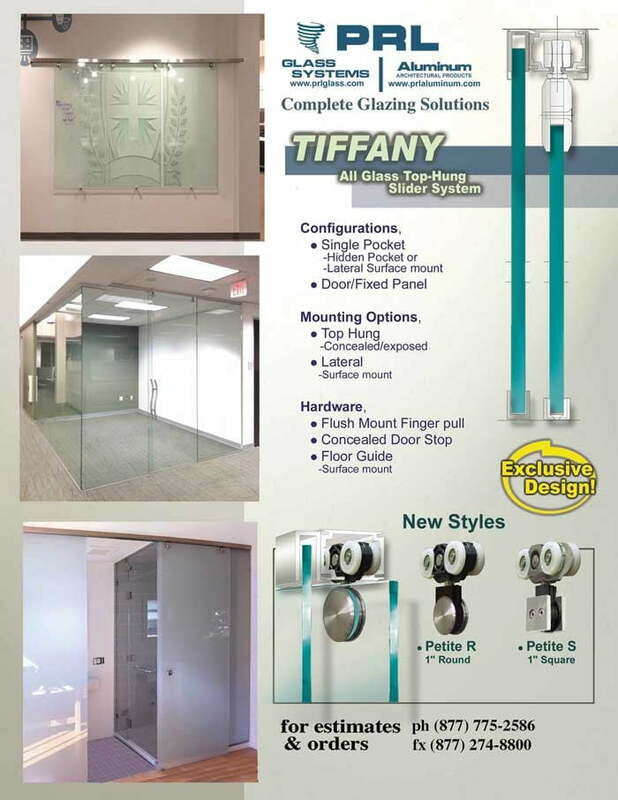 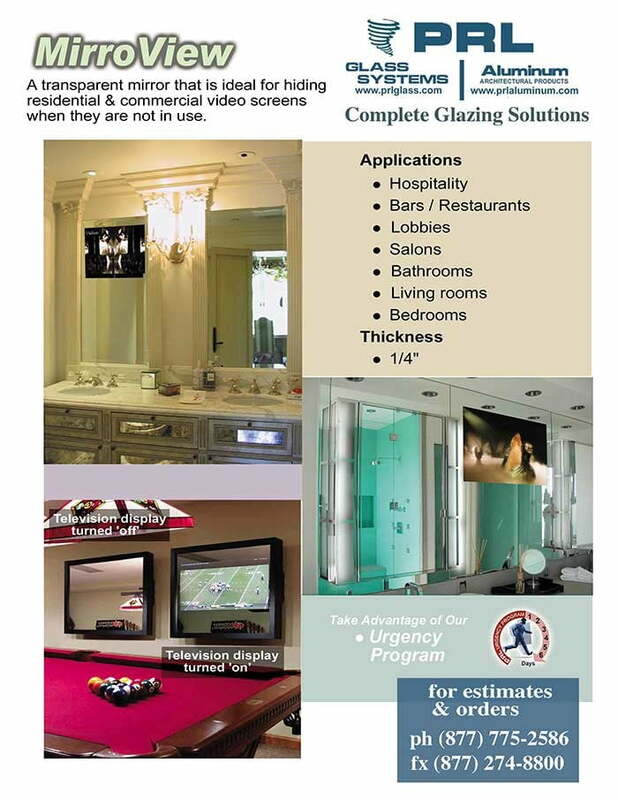 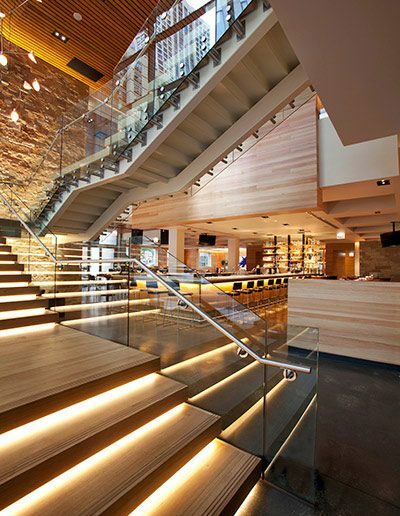 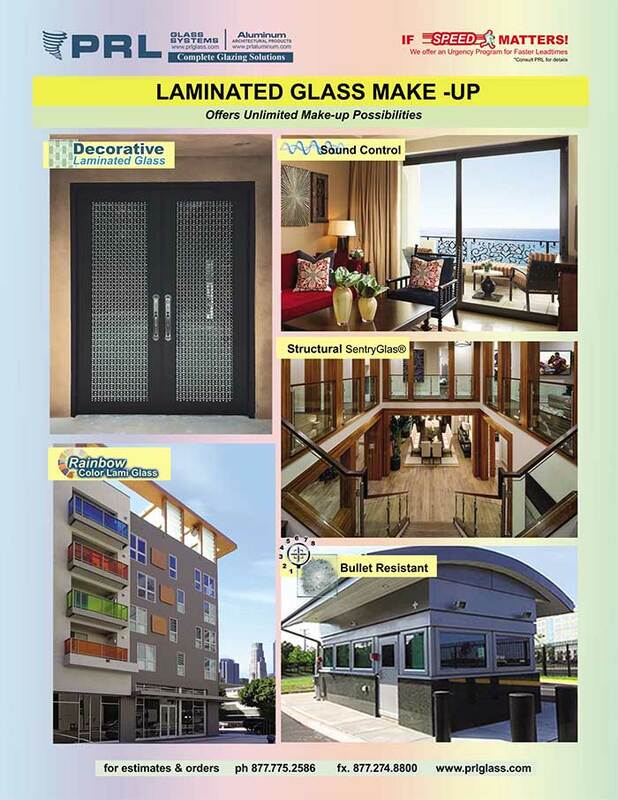 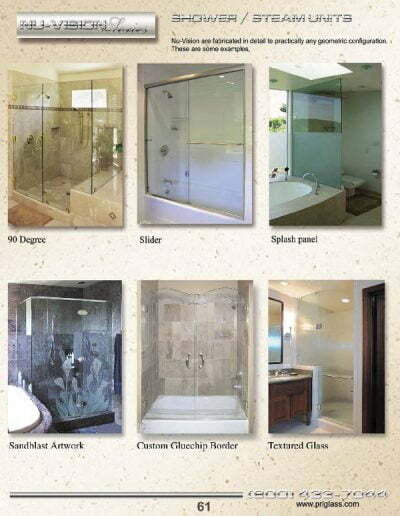 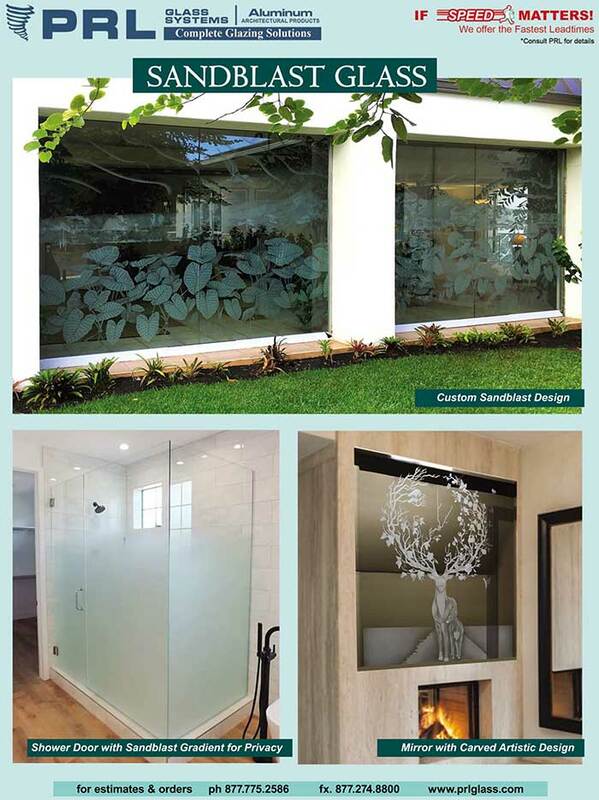 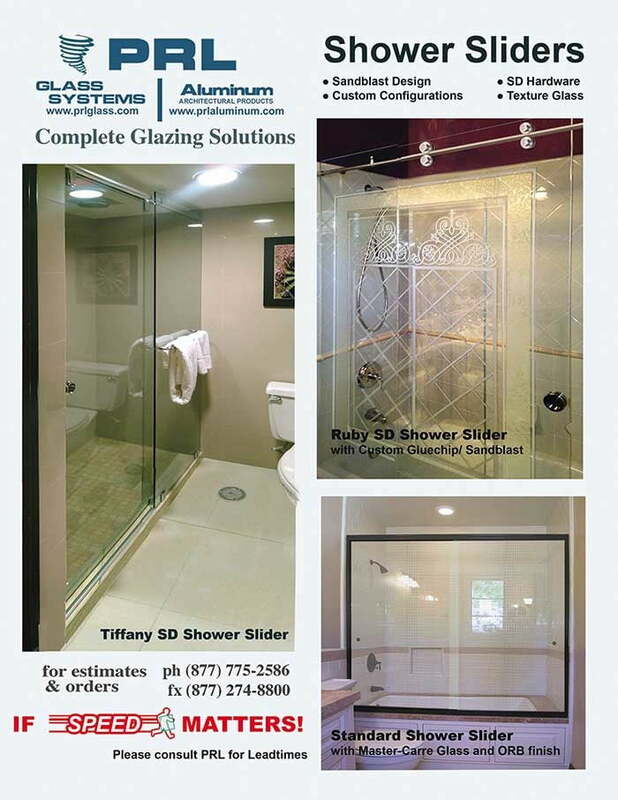 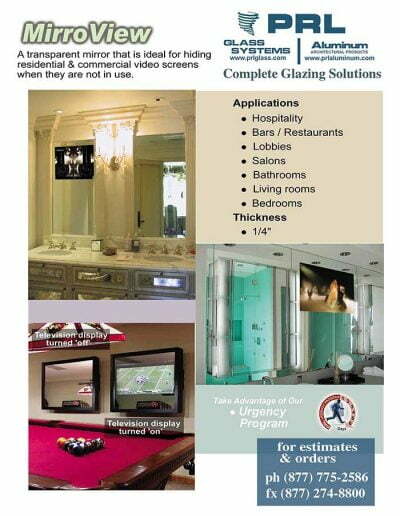 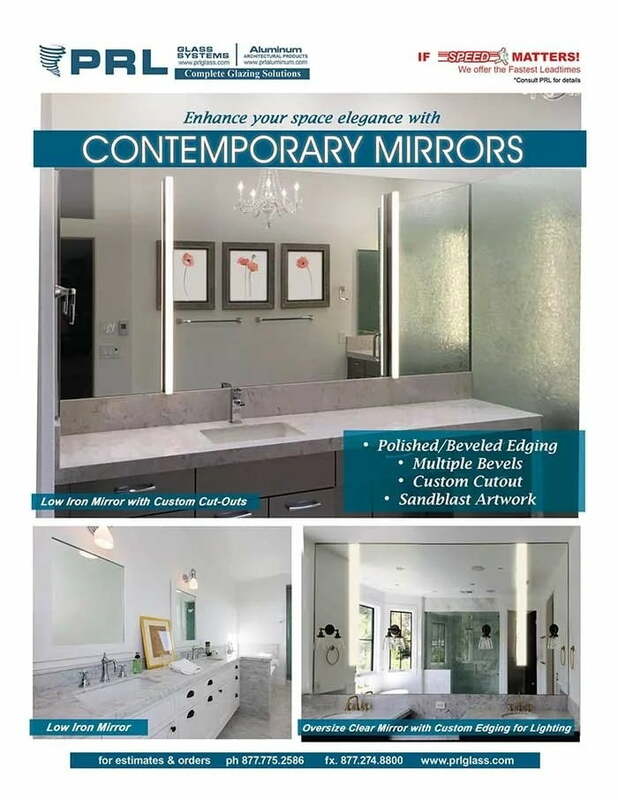 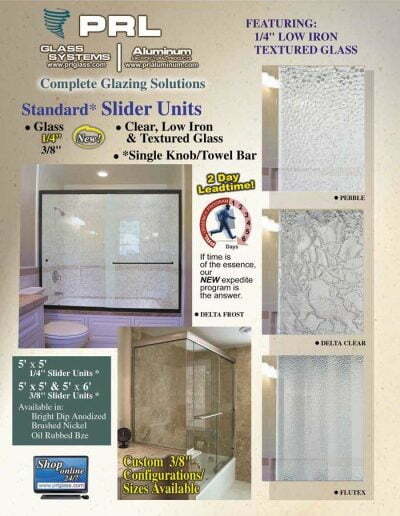 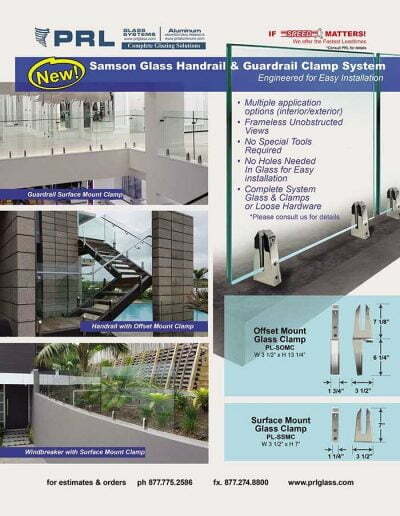 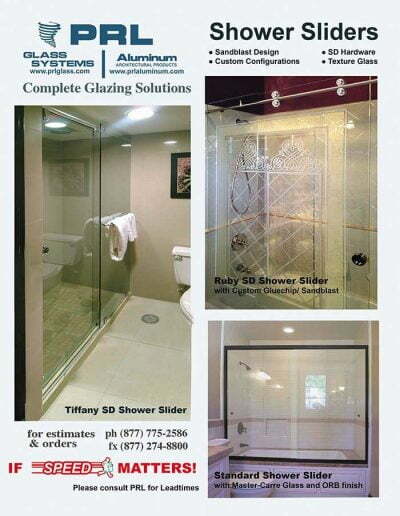 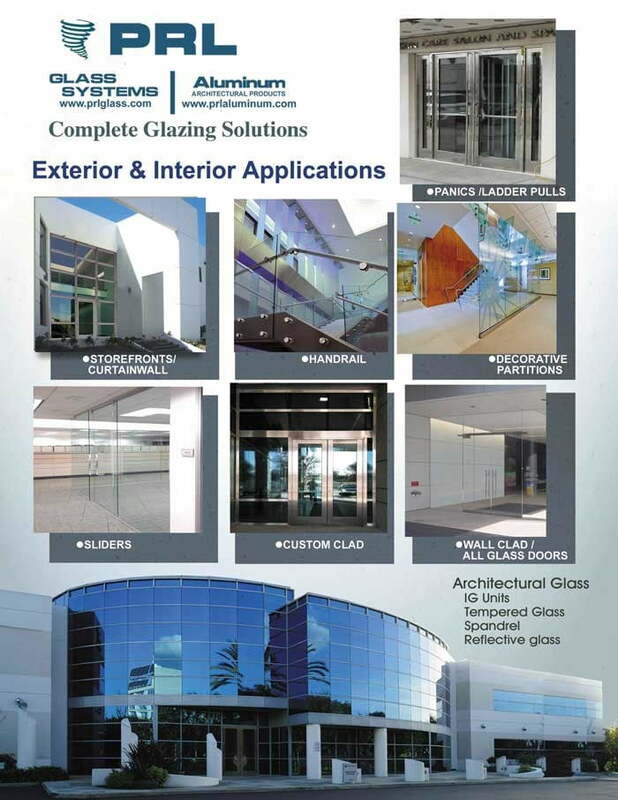 We supply architectural glass and metal products for residential and commercial use with a rapid turn-around that is unmatched in our industry. 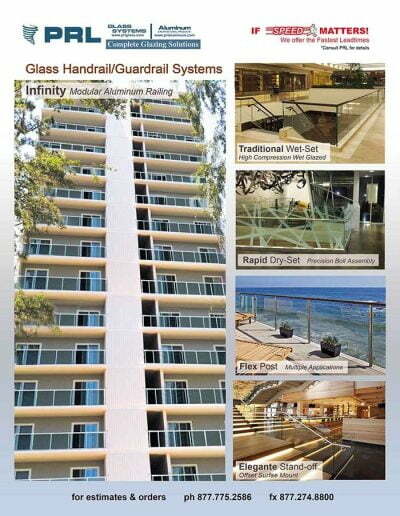 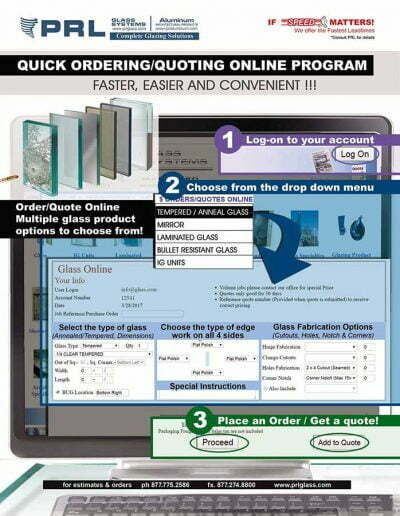 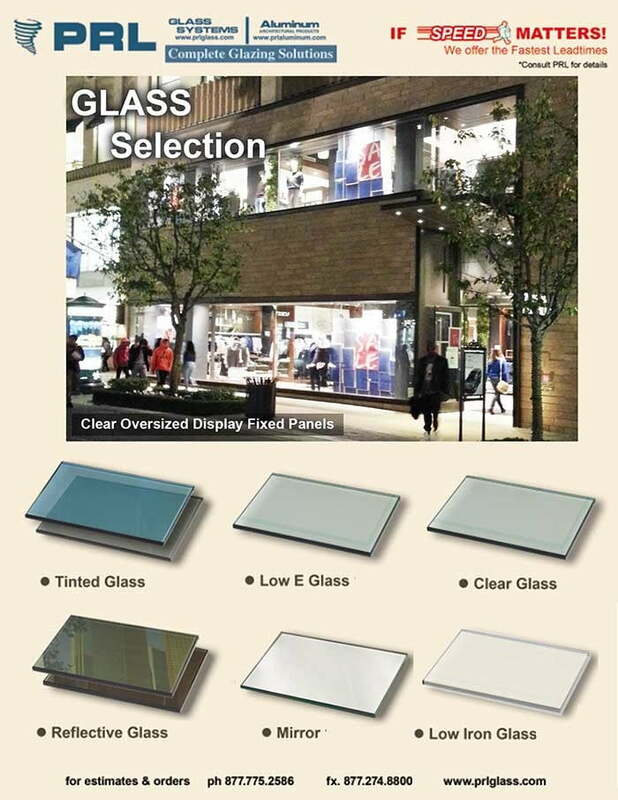 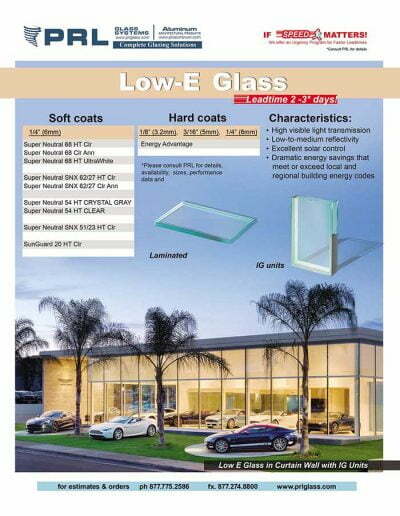 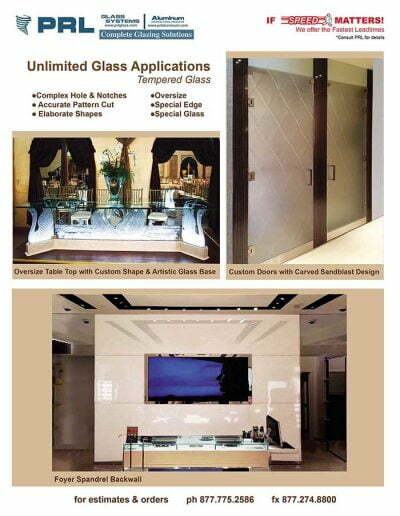 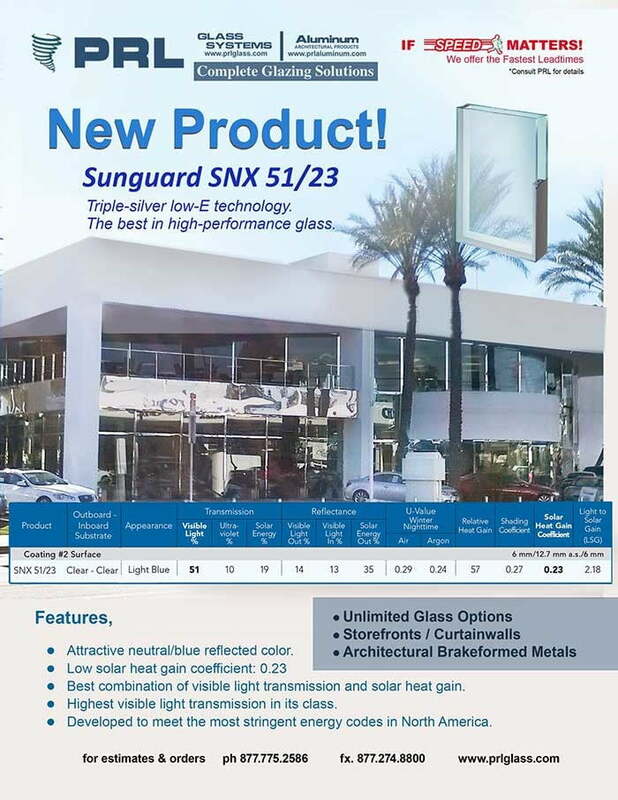 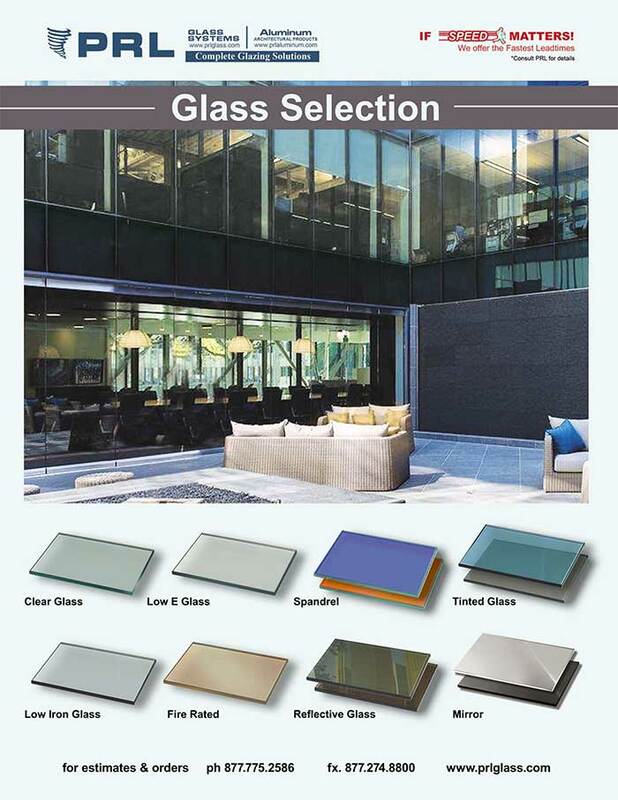 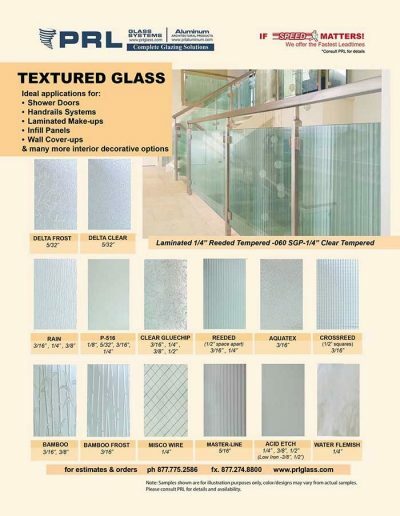 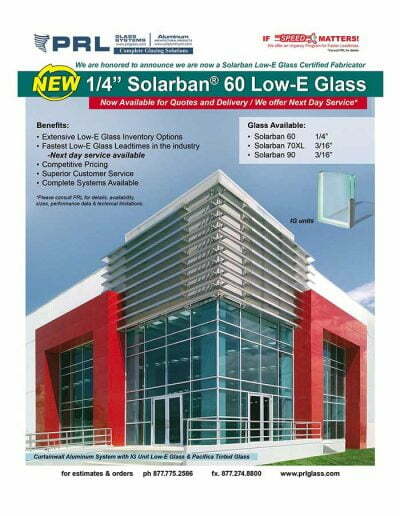 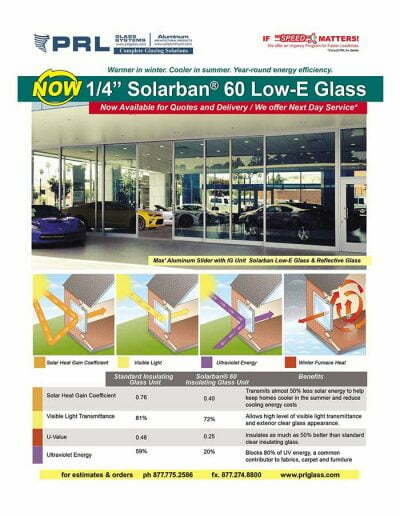 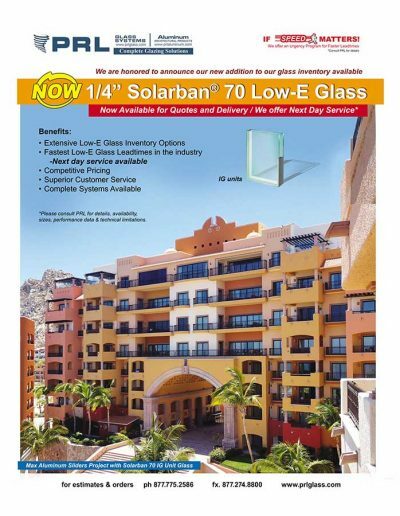 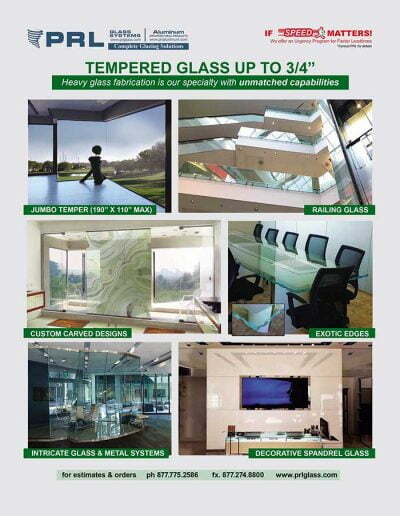 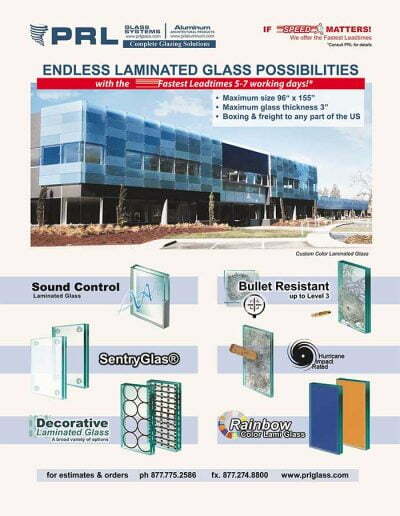 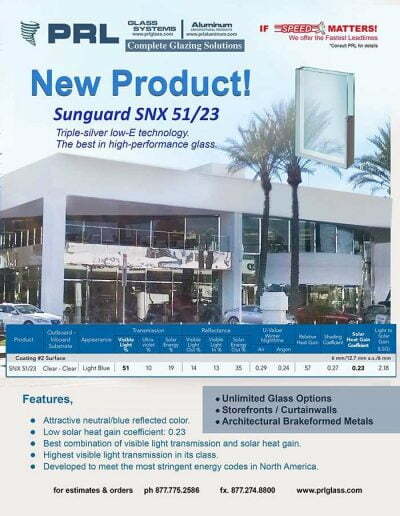 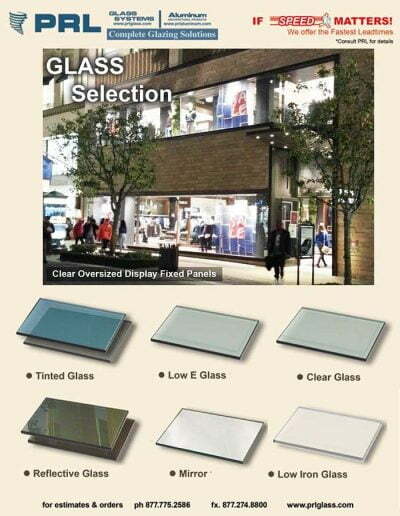 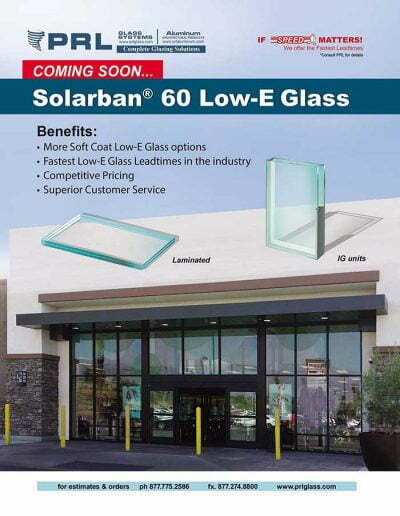 Is an ordinary float glass with a metallic coating applied to reduce solar heat. 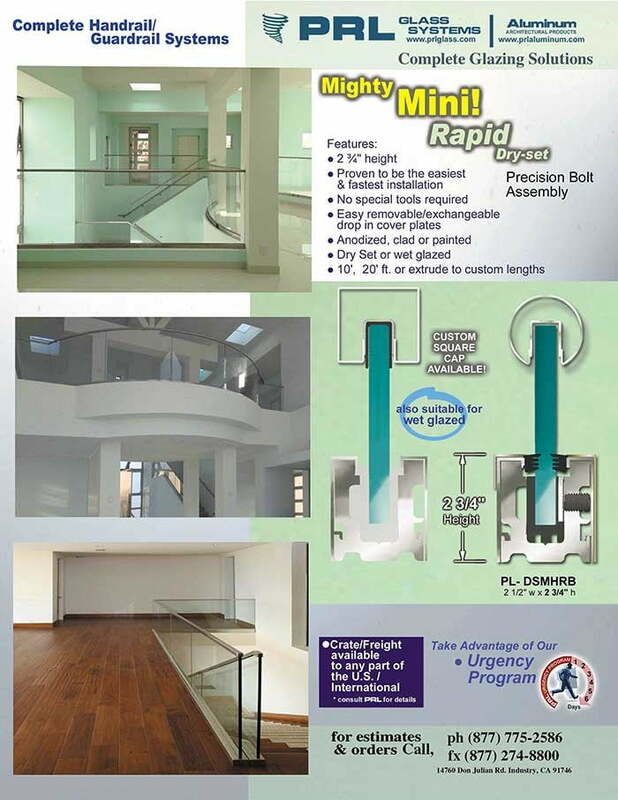 This special metallic coating also produces a mirror effect, preventing a subject from seeing through the glass from the coated side. 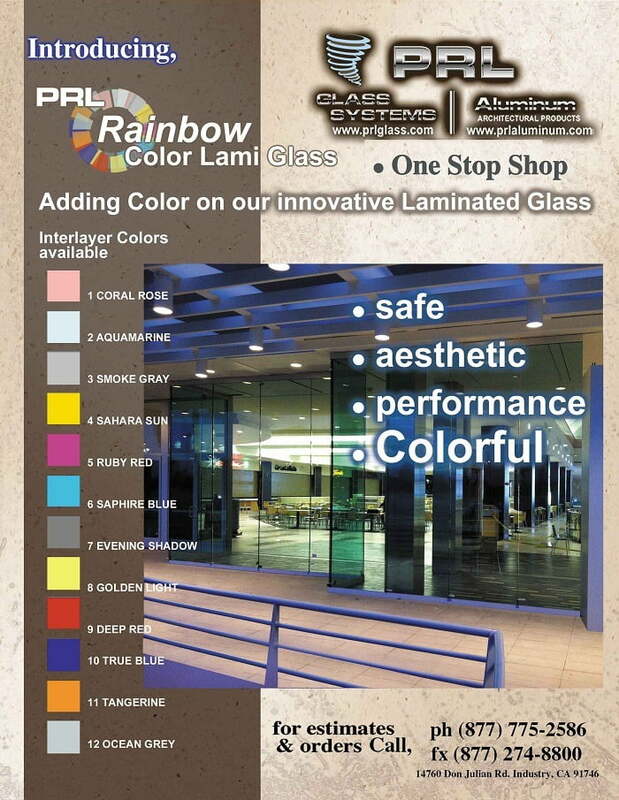 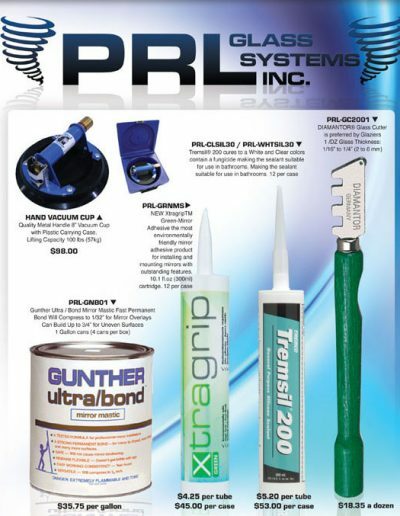 PRL offers a variety of different types of color coatings that fit well in the most innovative of architectural design concepts. 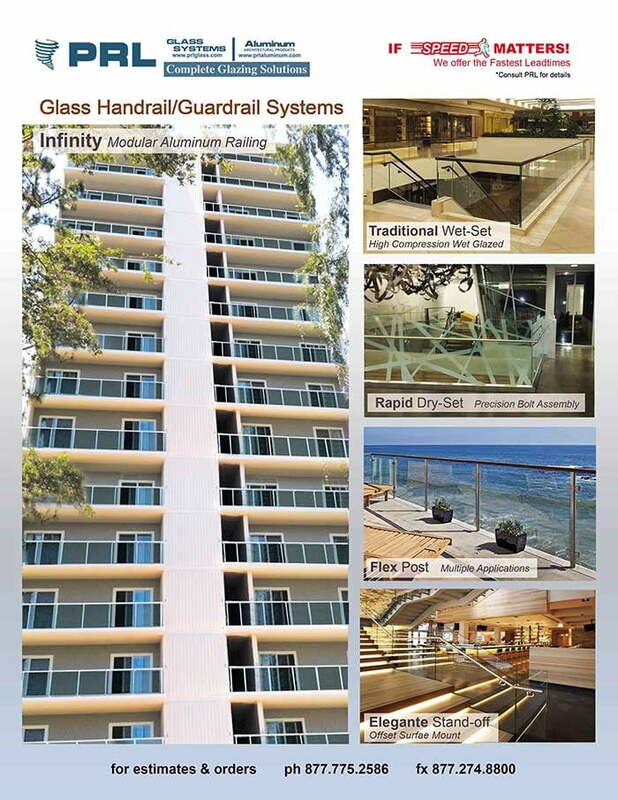 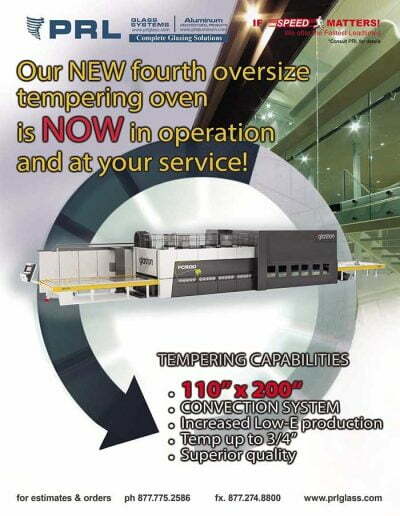 This unique performance in IG units can be combined strategically with a building’s architectural design to maximize investment efficiency and to lower the operating costs of air-conditioning units. 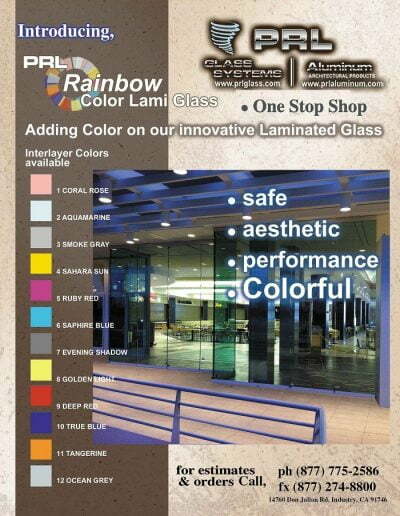 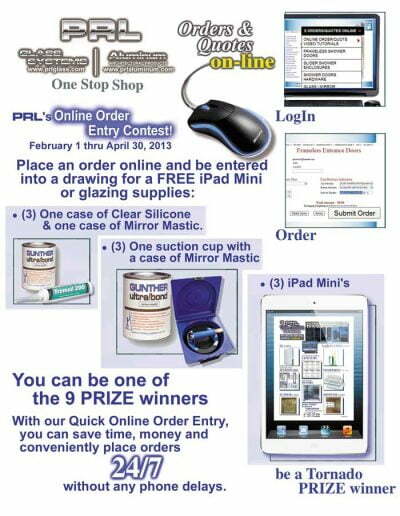 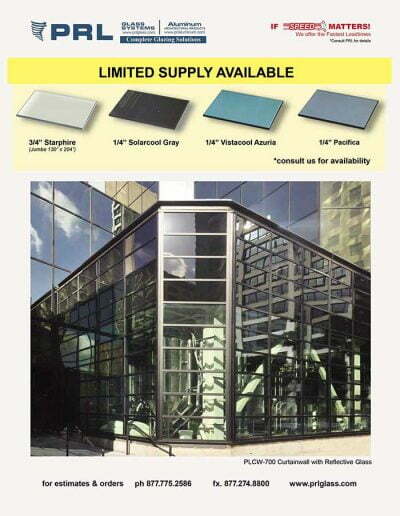 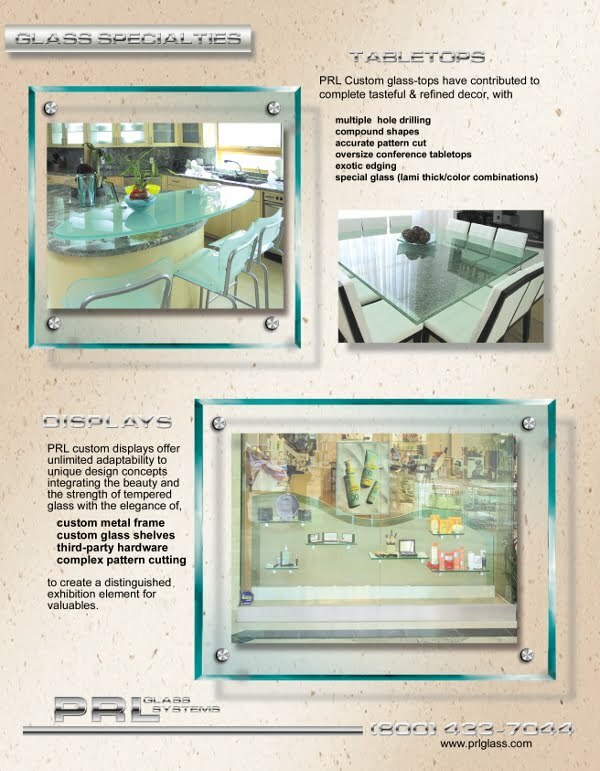 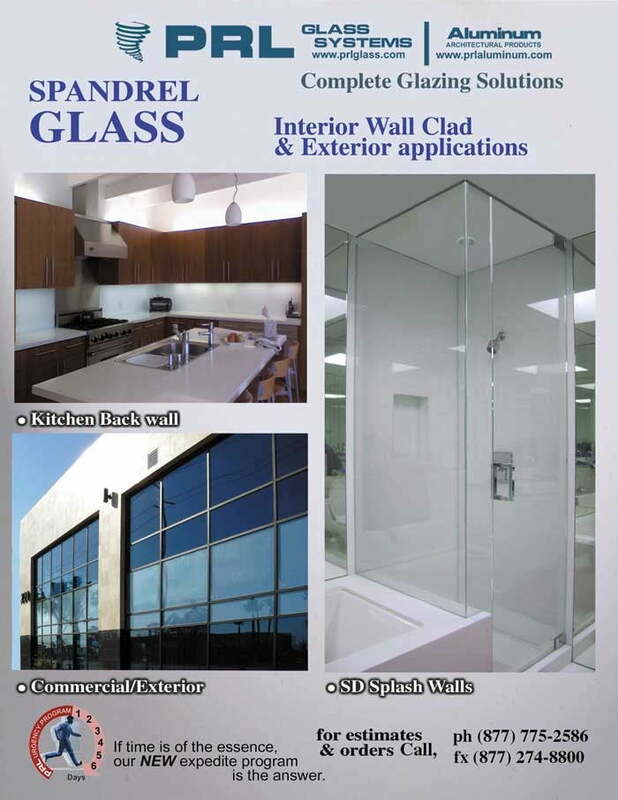 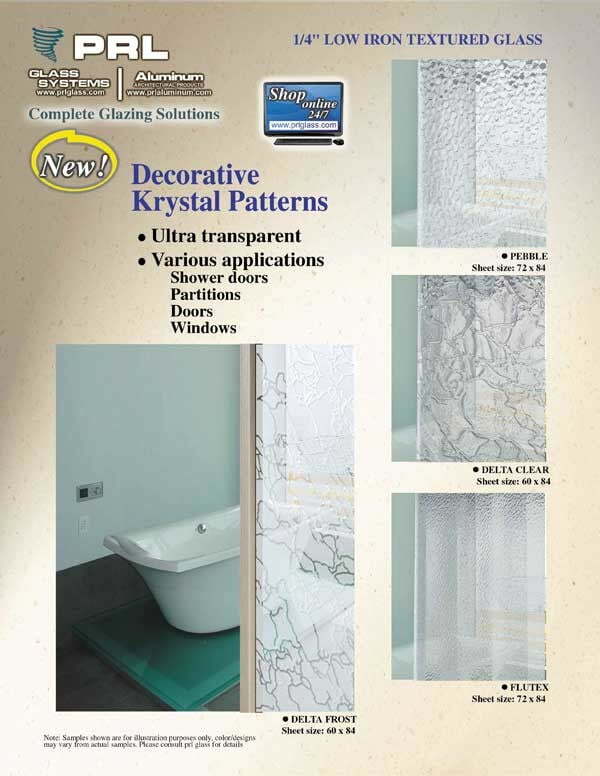 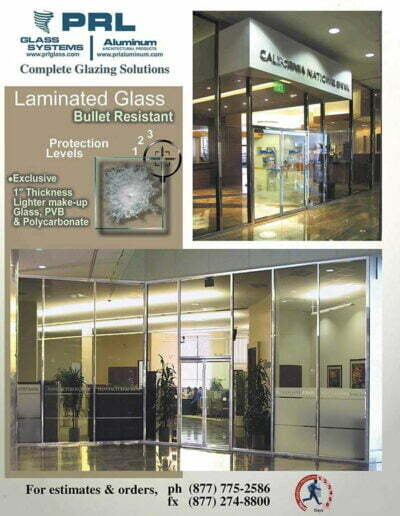 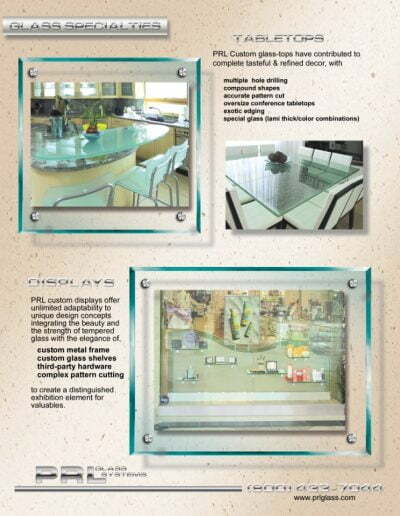 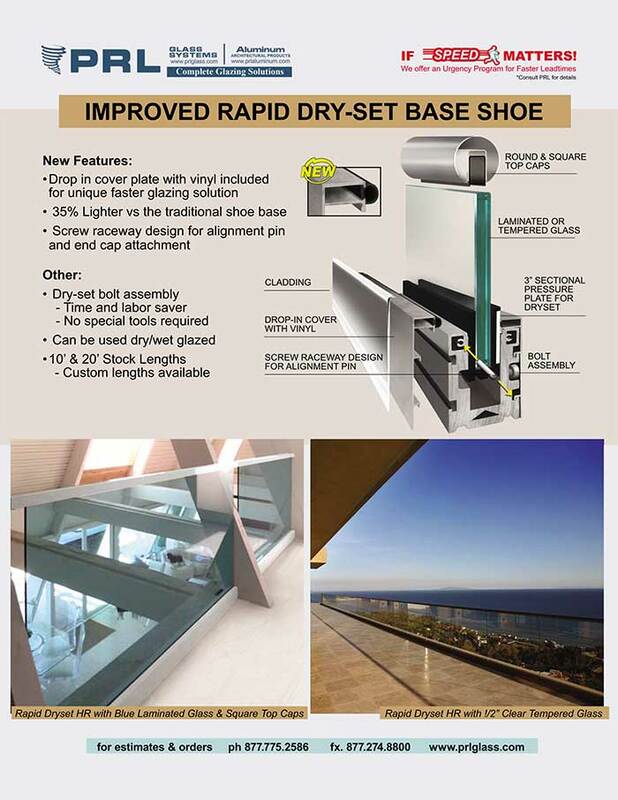 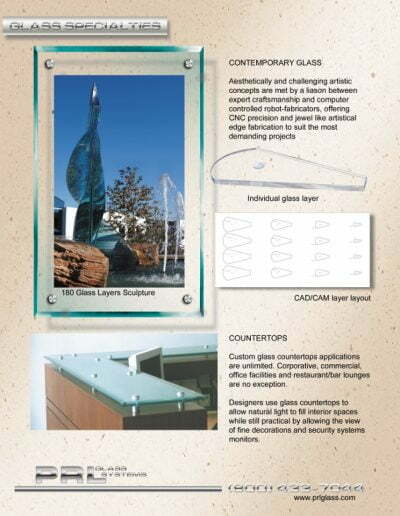 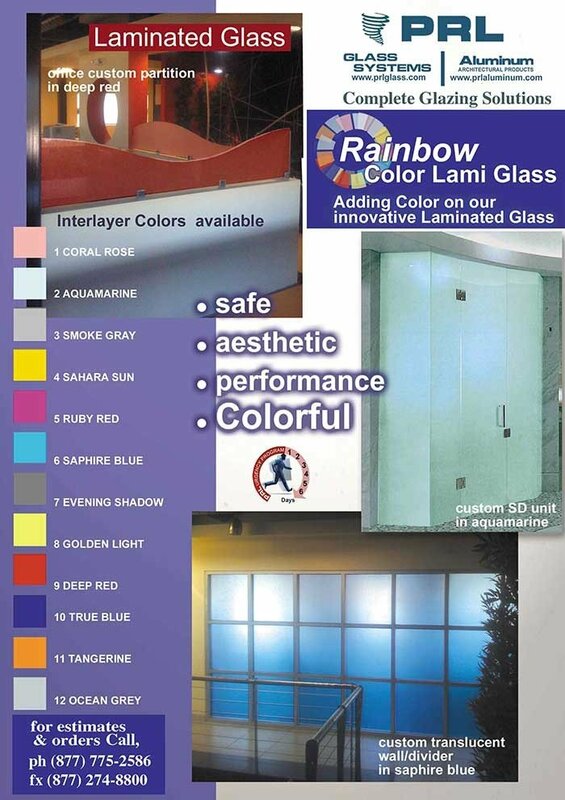 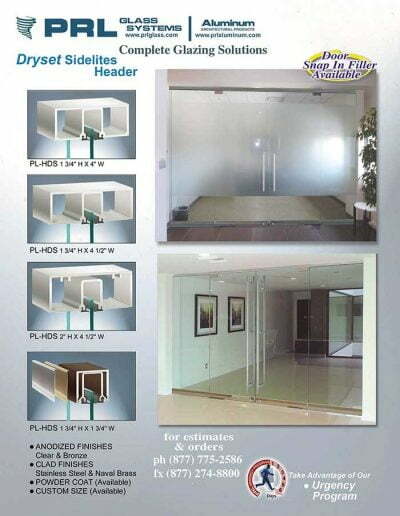 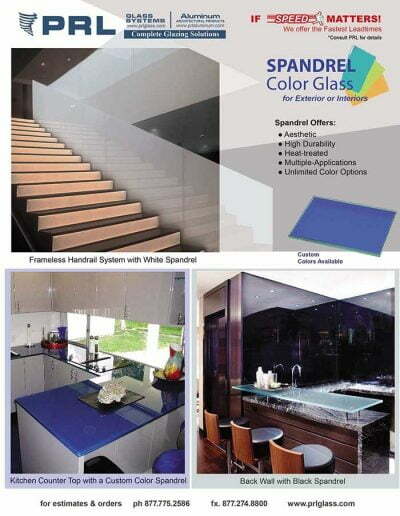 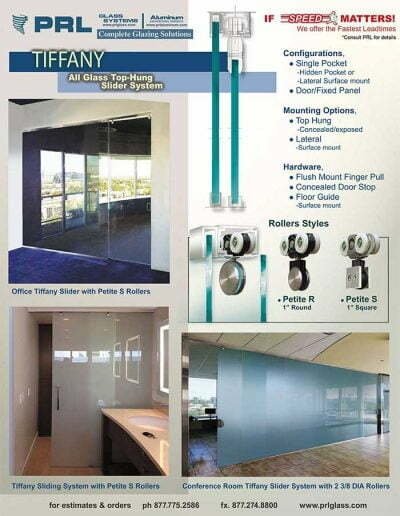 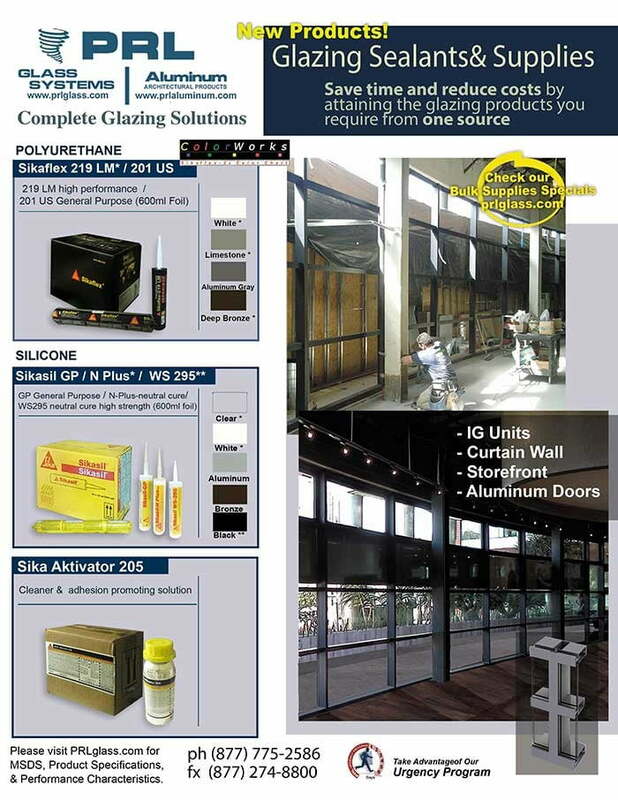 This product can be glazed with the reflective coating positioned on either the first or second surface. The glass has improved performance and higher exterior visible reflectivity when installed with the coating on the first surface. 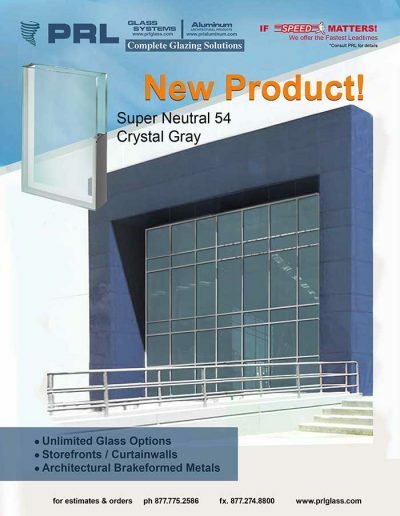 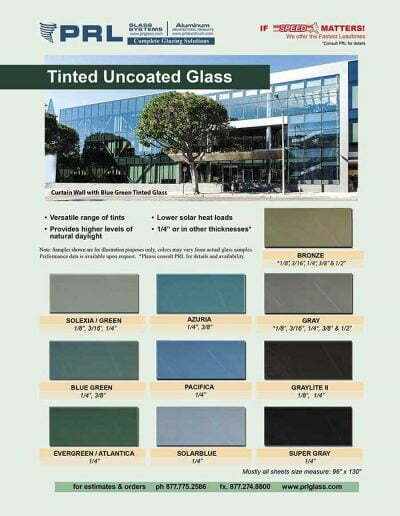 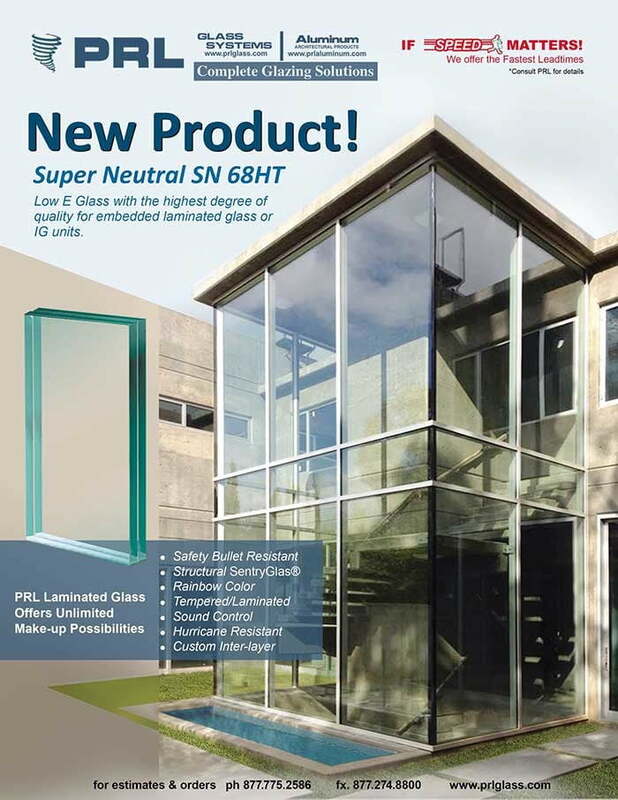 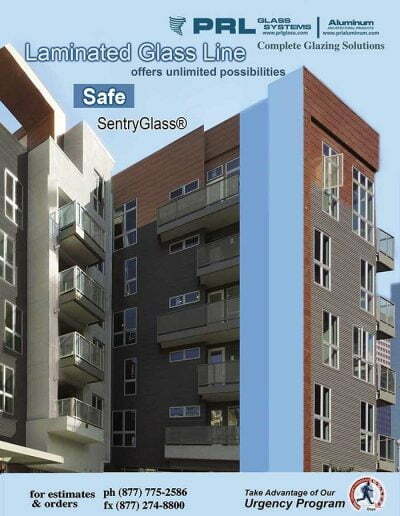 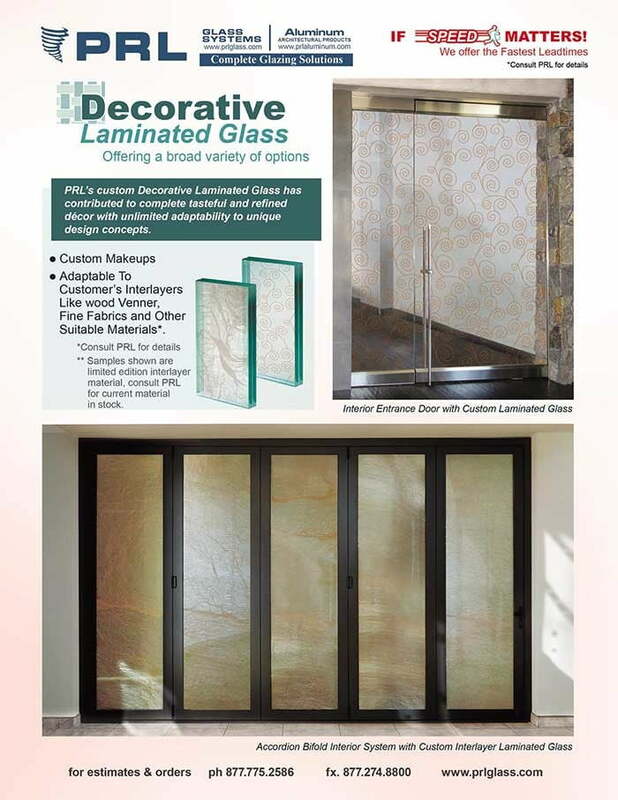 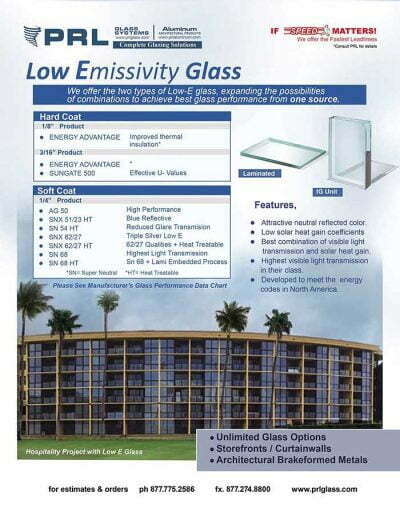 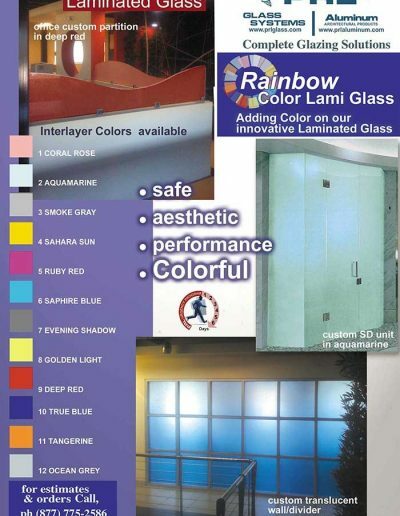 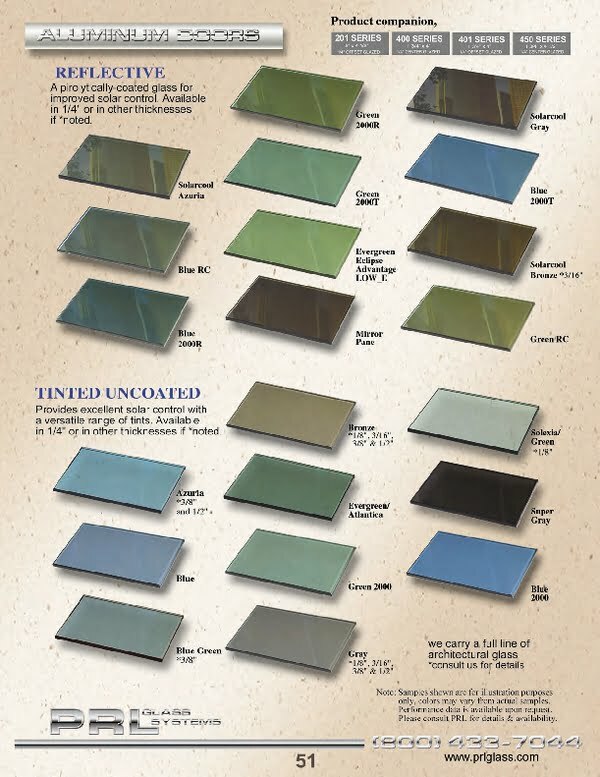 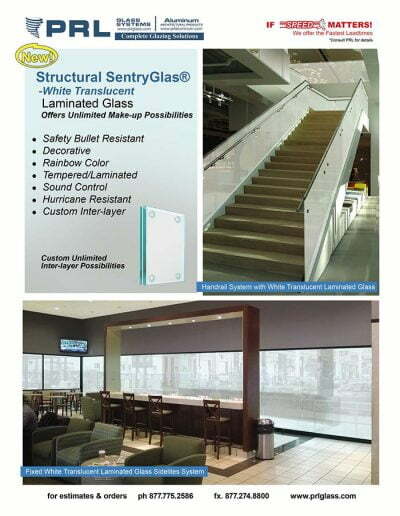 When installed with the coating on the second surface, the glass has lower exterior visible reflectivity while maintaining the substrate glass color. 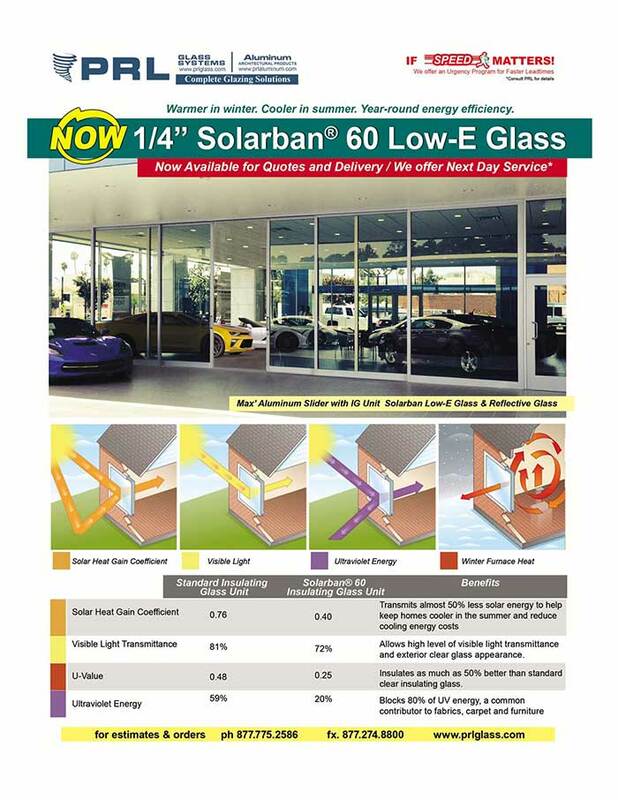 Tinted architectural glass provides significant improvements in solar performance with the colors being deeper; however natural views from the interior are maintained with low exterior reflectance. 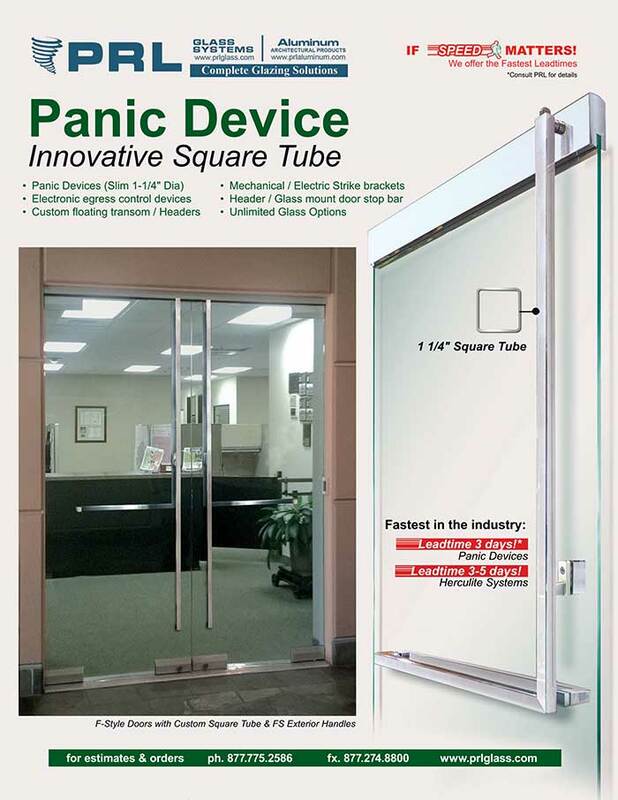 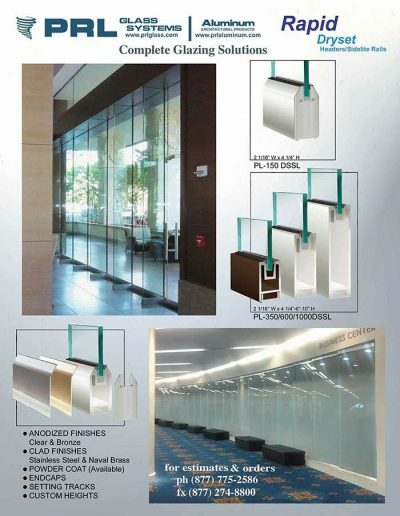 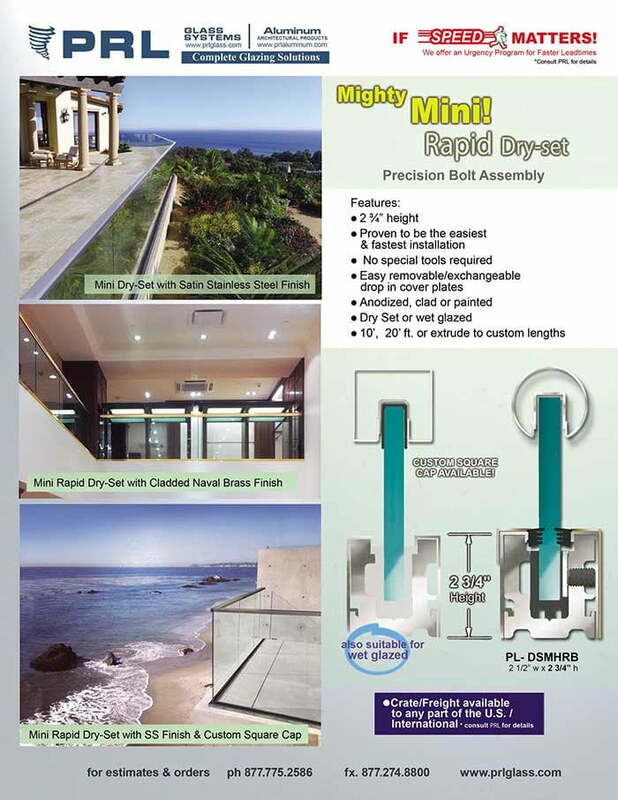 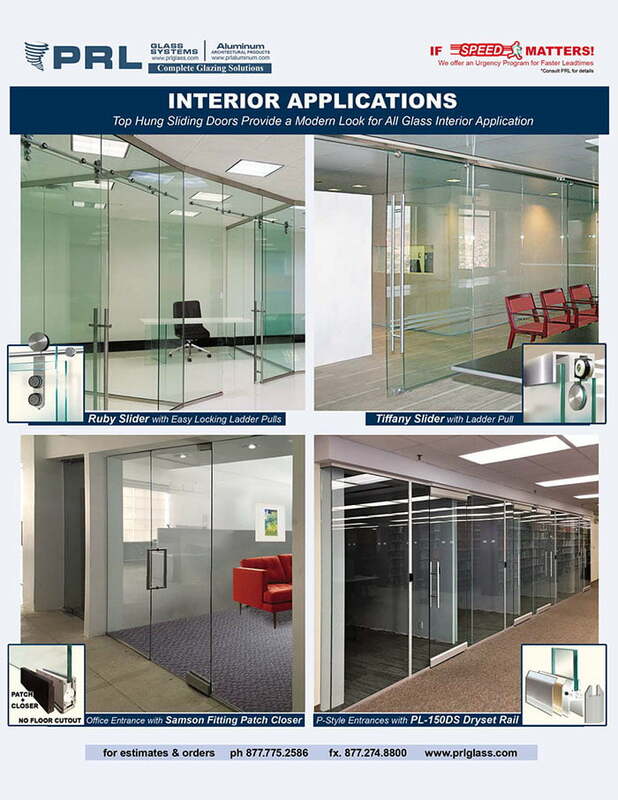 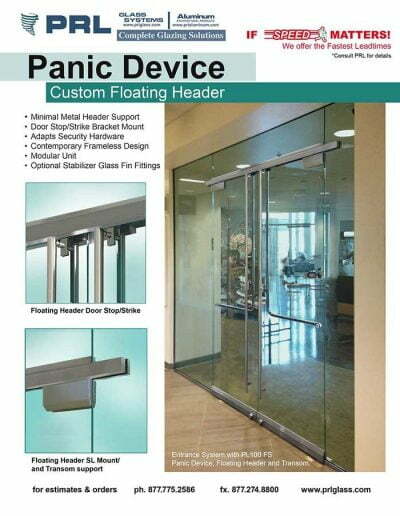 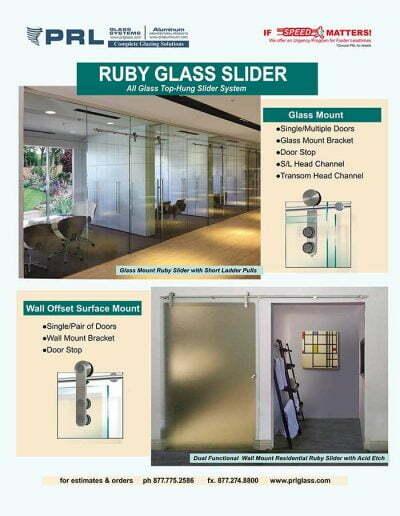 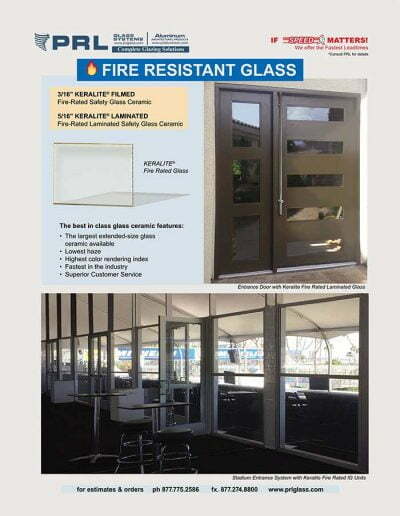 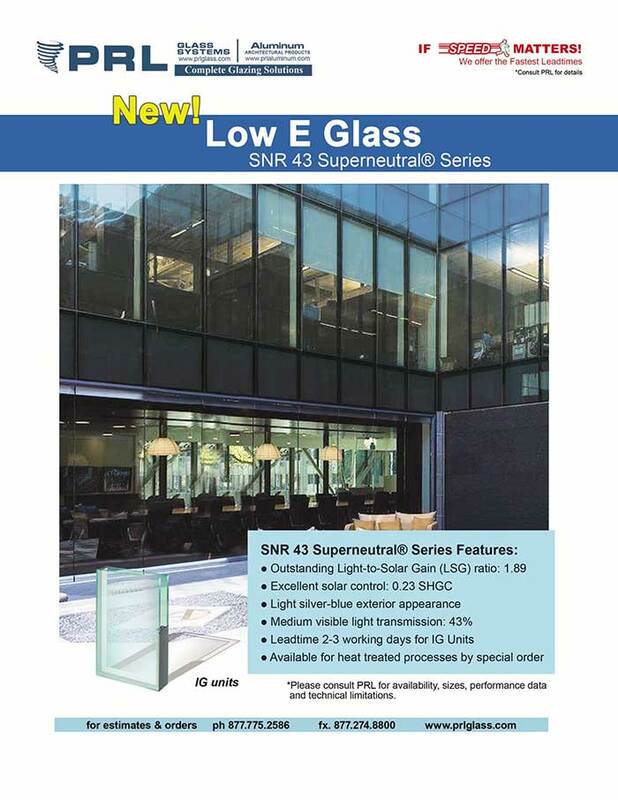 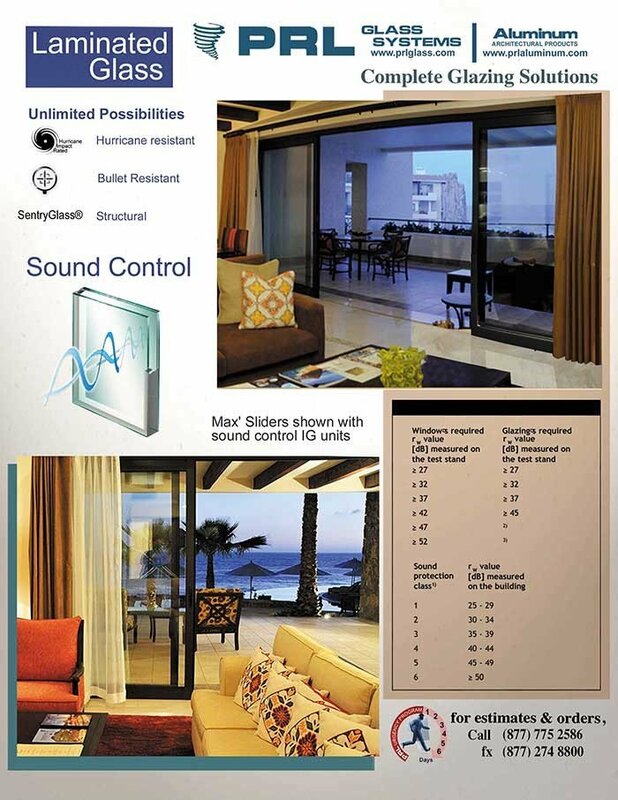 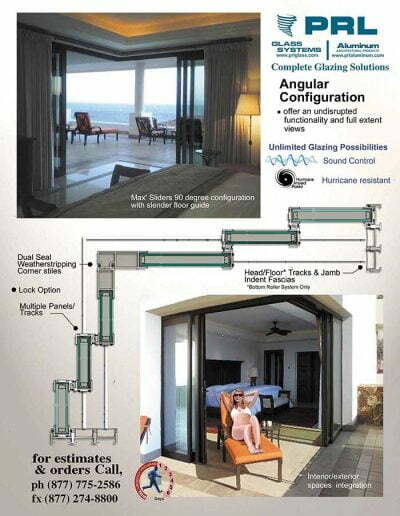 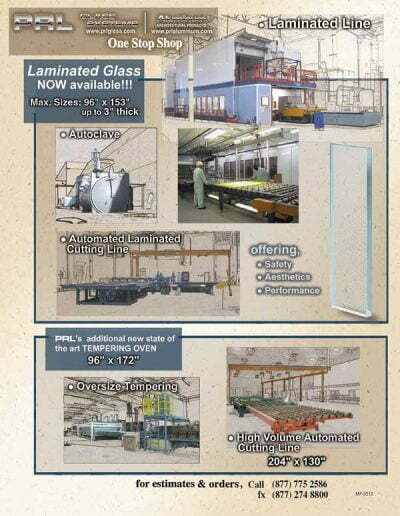 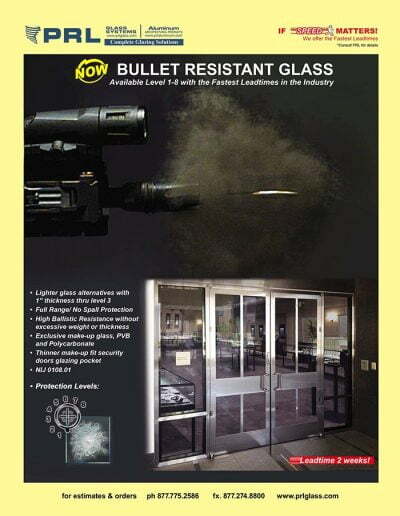 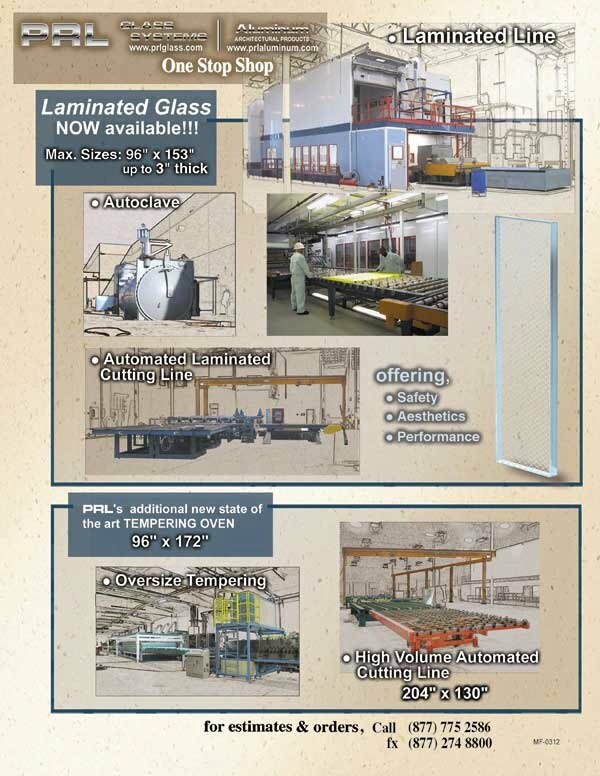 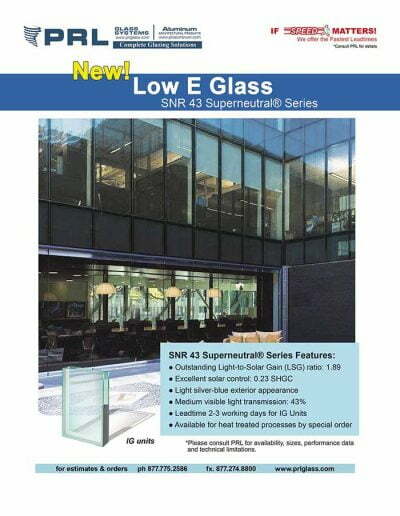 They are readily available and can be processed and fabricated similarly to normal float glass to provide an economical choice for reducing air-conditioning loads and costs. 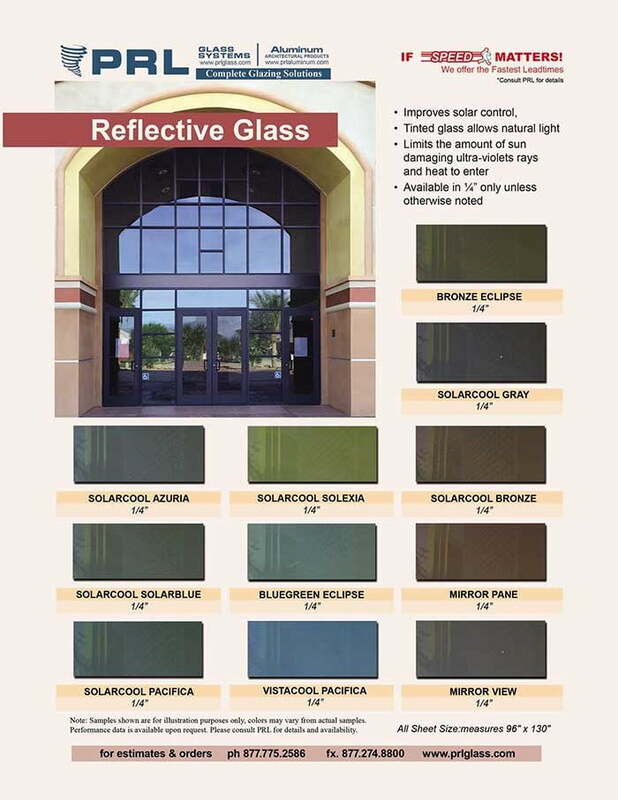 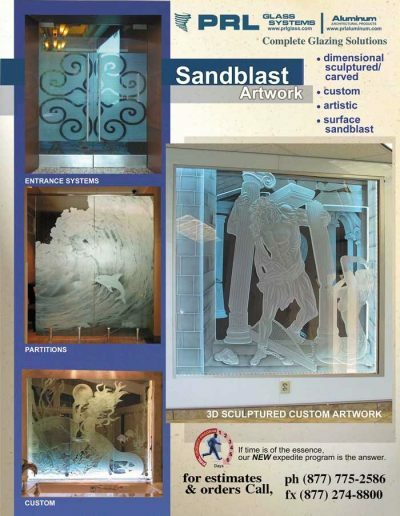 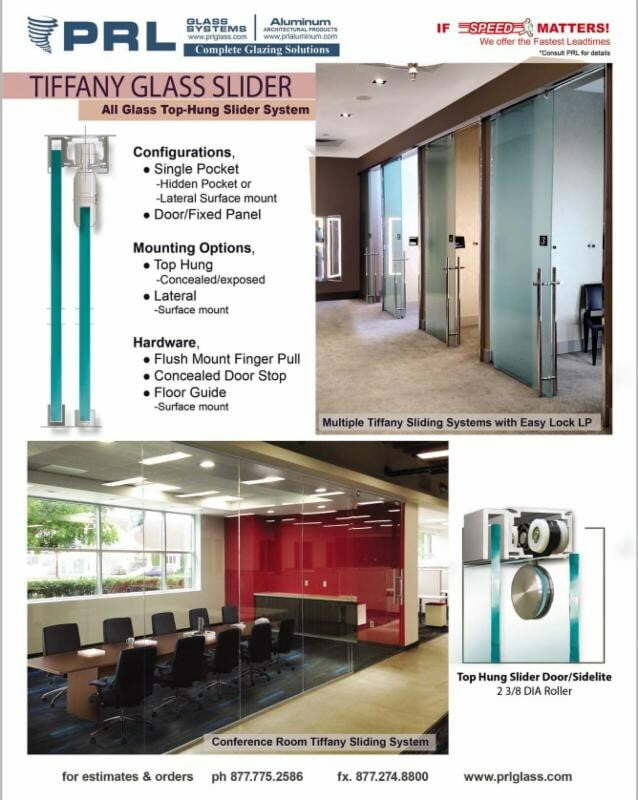 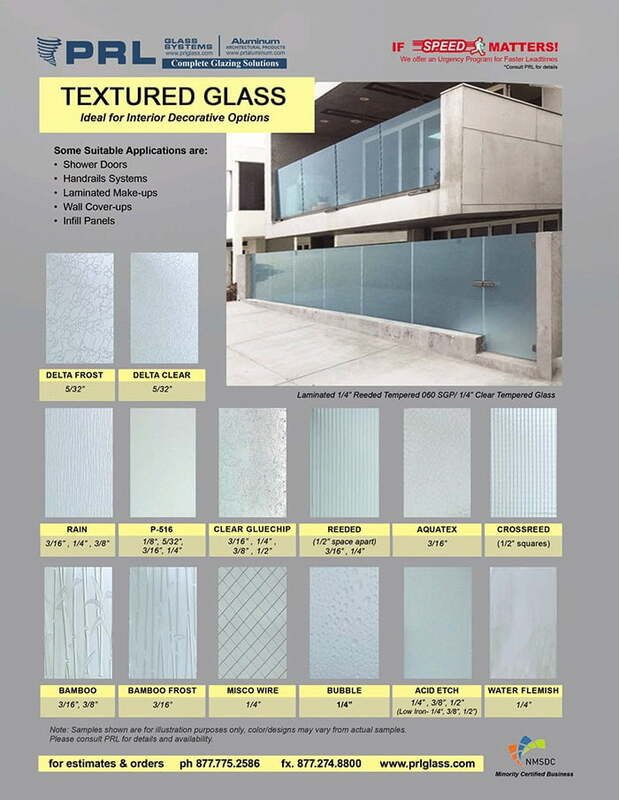 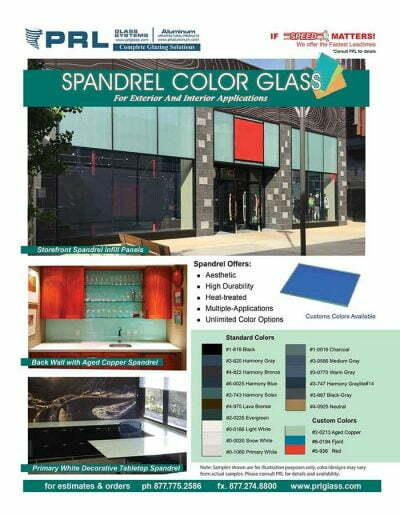 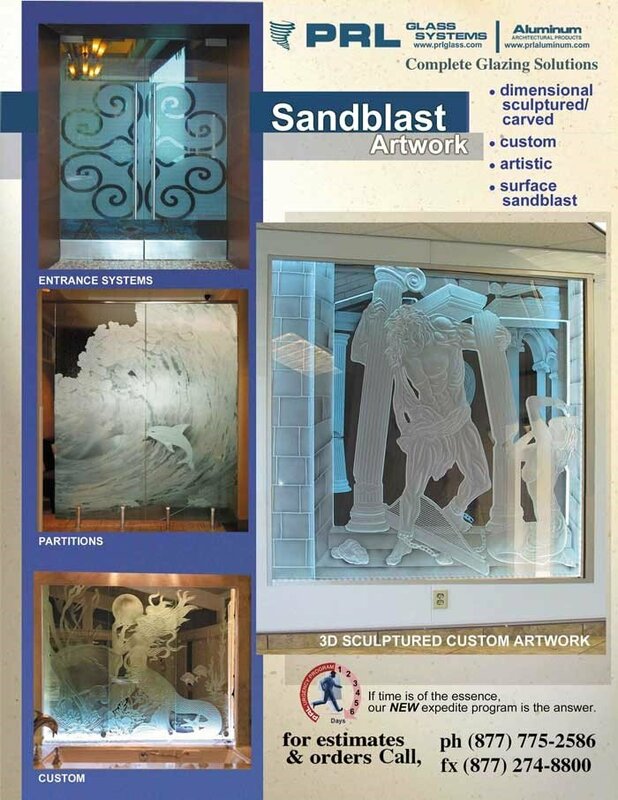 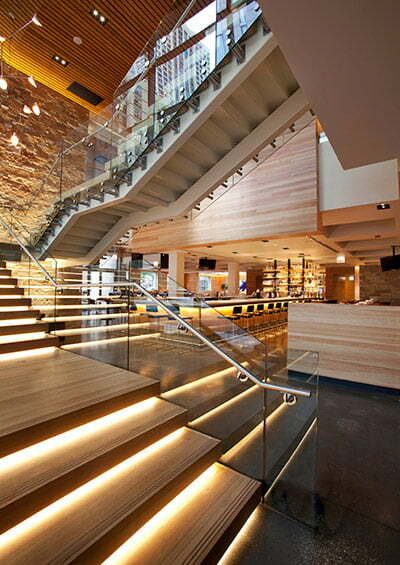 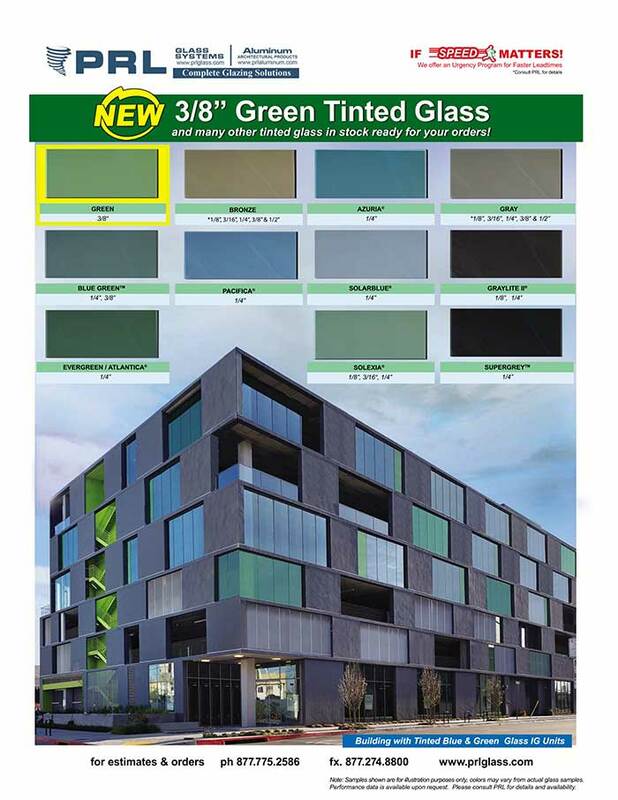 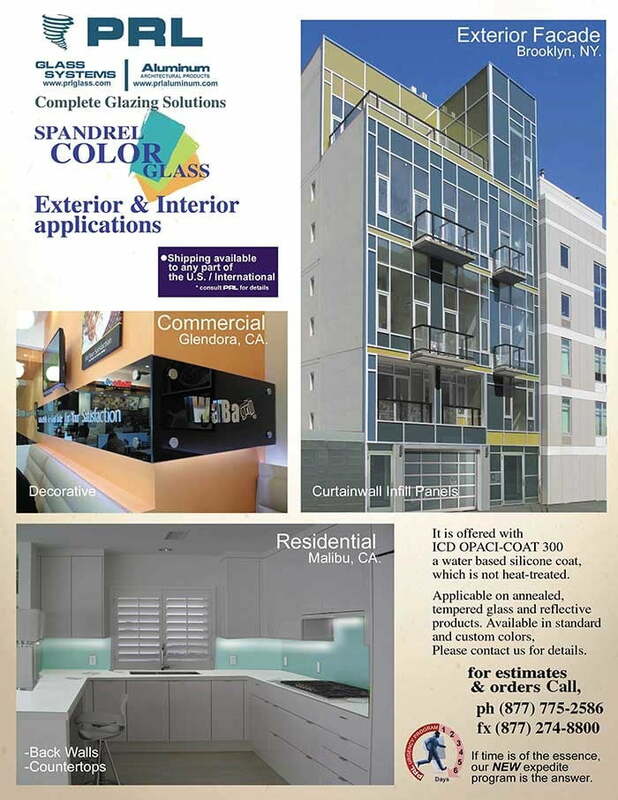 This type of architectural glass can be used in commercial projects, for buildings that desire more color in the low, mid, or hi-rise applications. 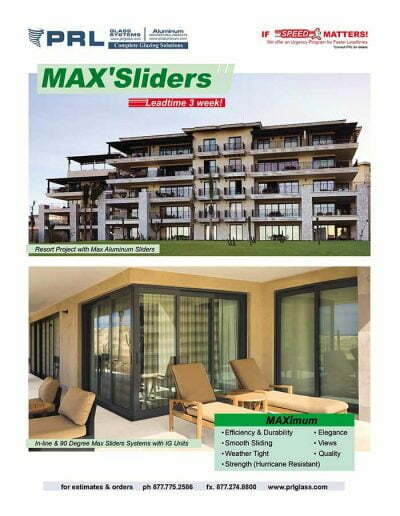 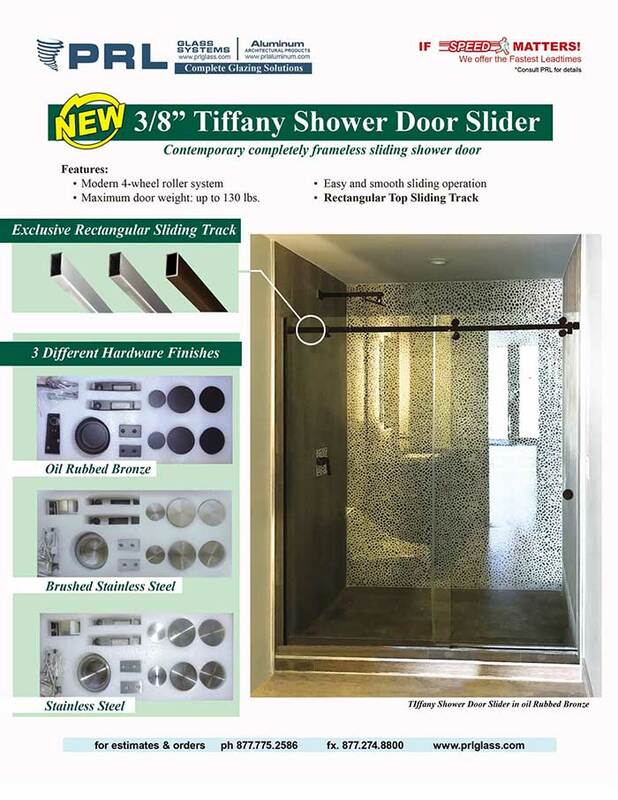 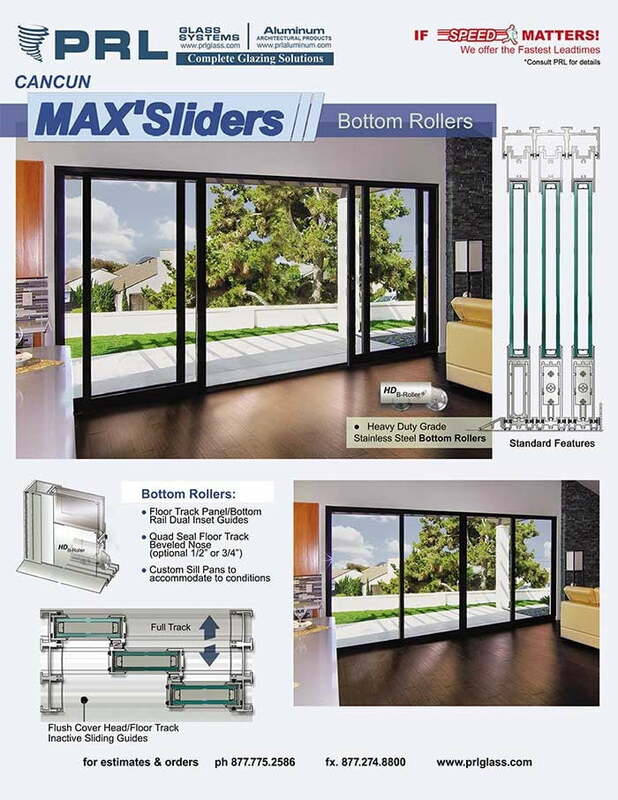 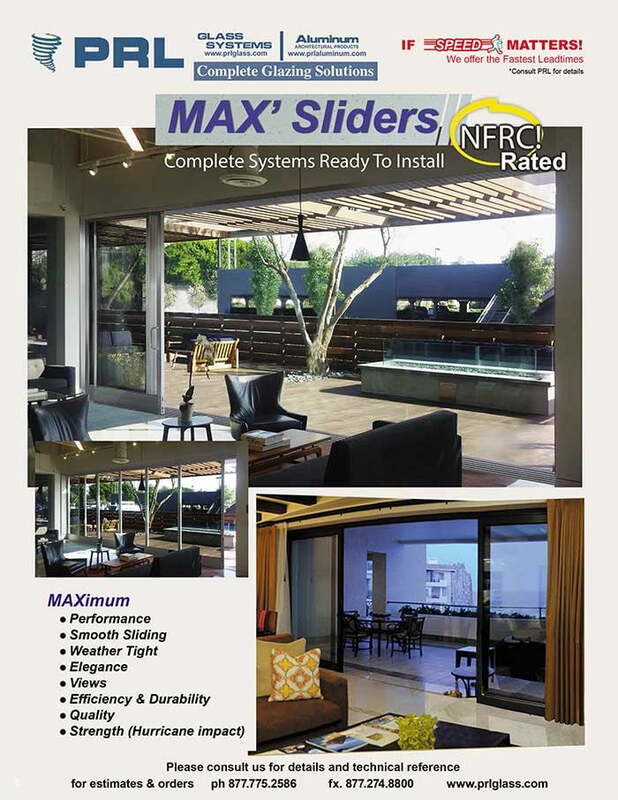 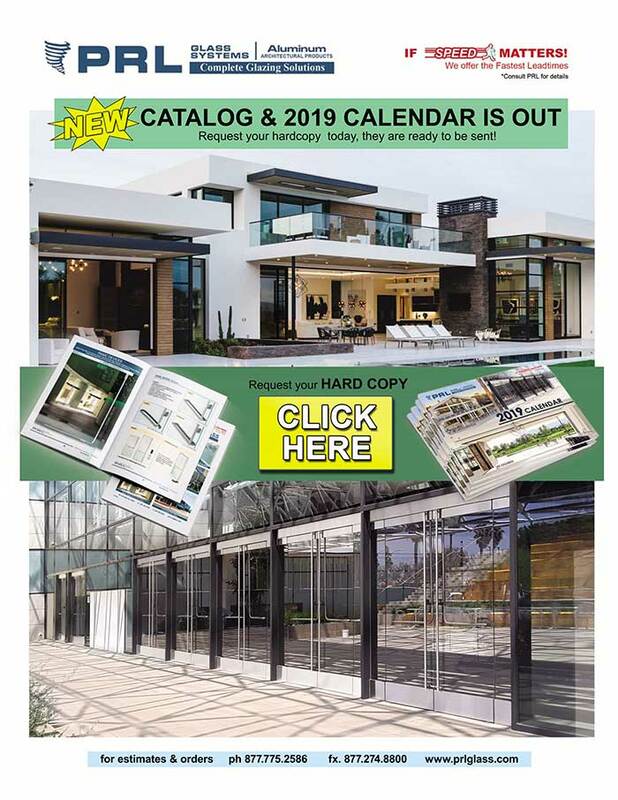 It can also be used for residential applications and accommodate homeowners with limiting the amount of sunlight entering the home and enhance the home’s interior comfort. 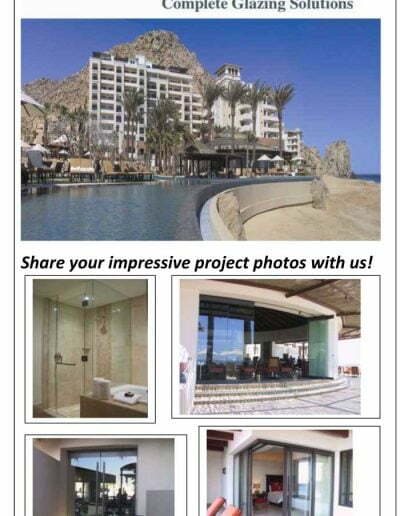 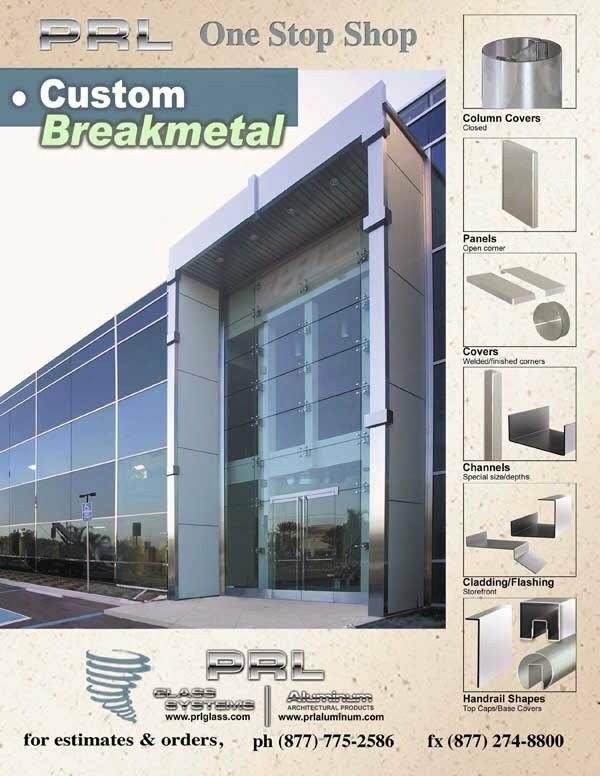 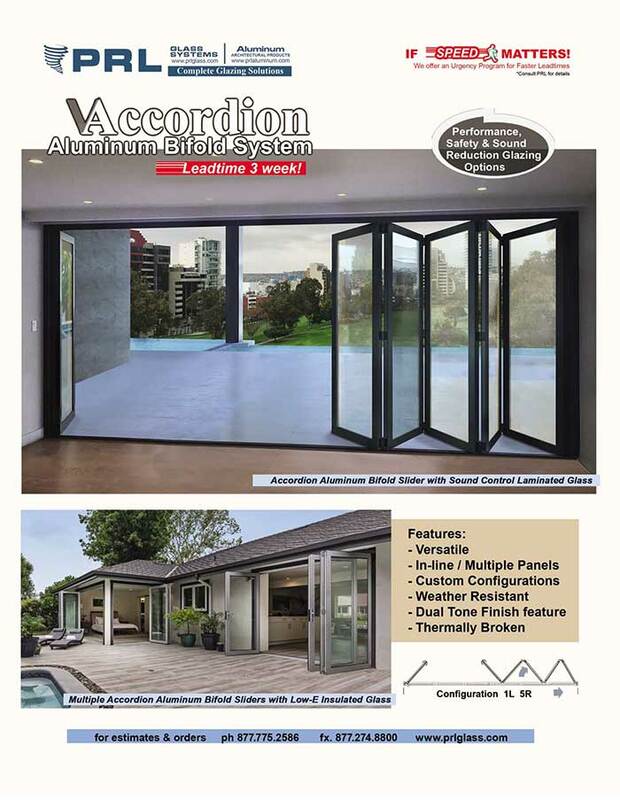 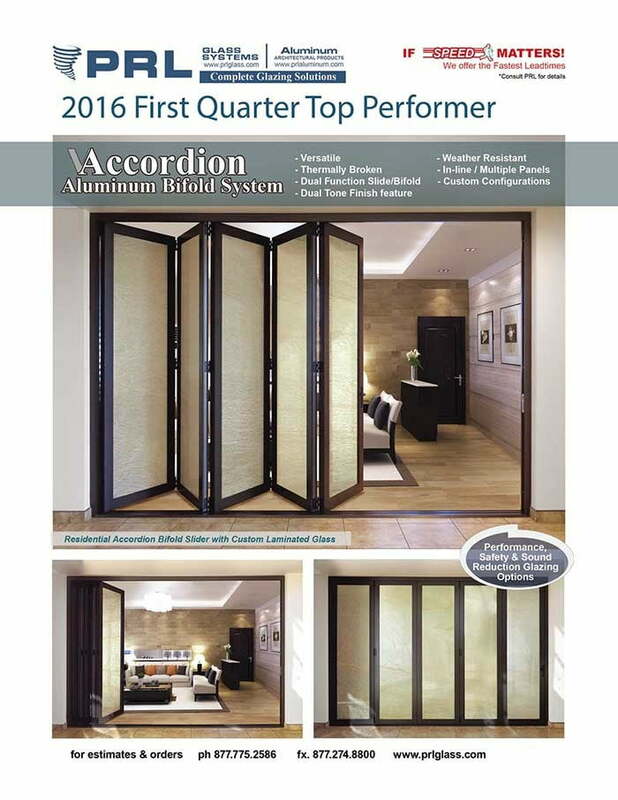 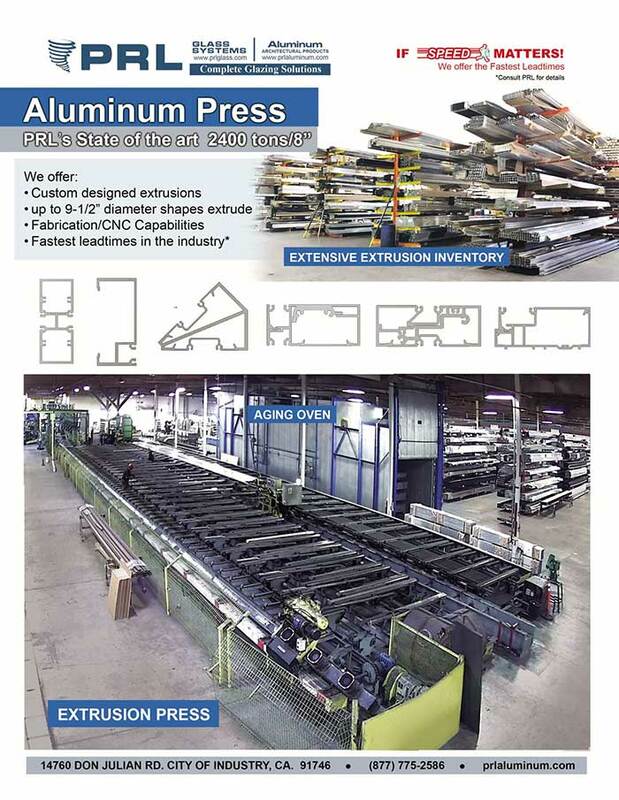 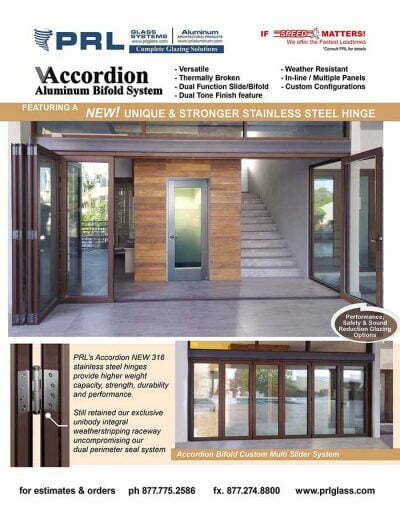 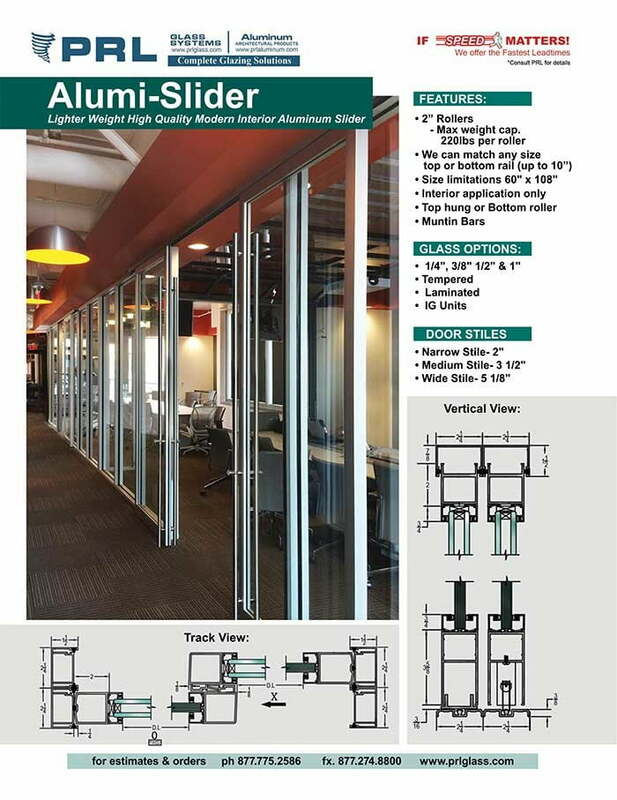 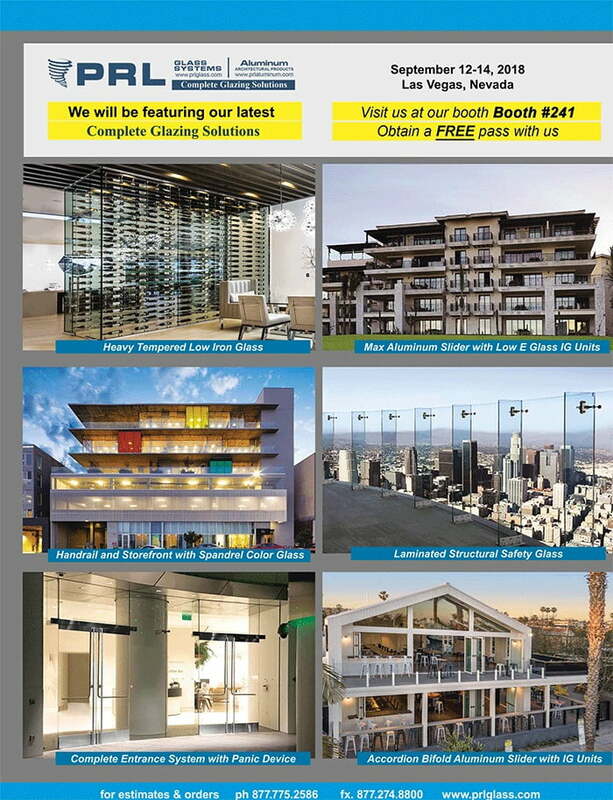 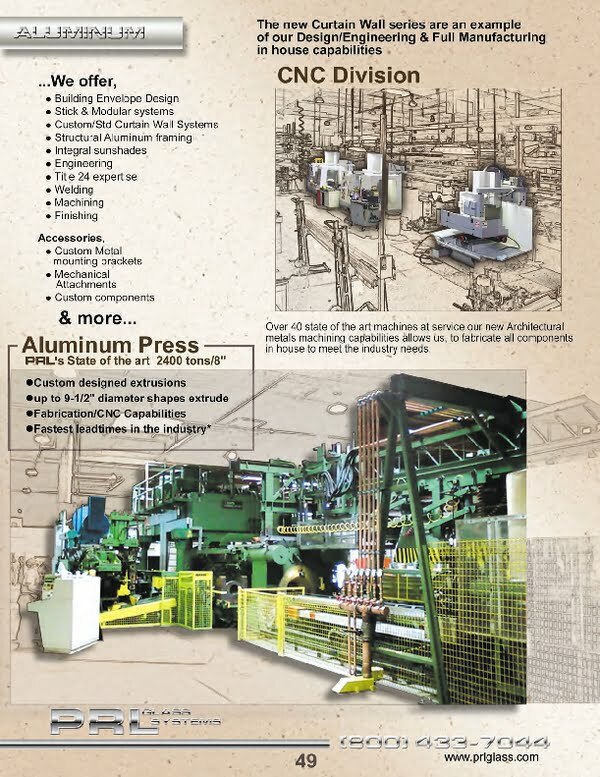 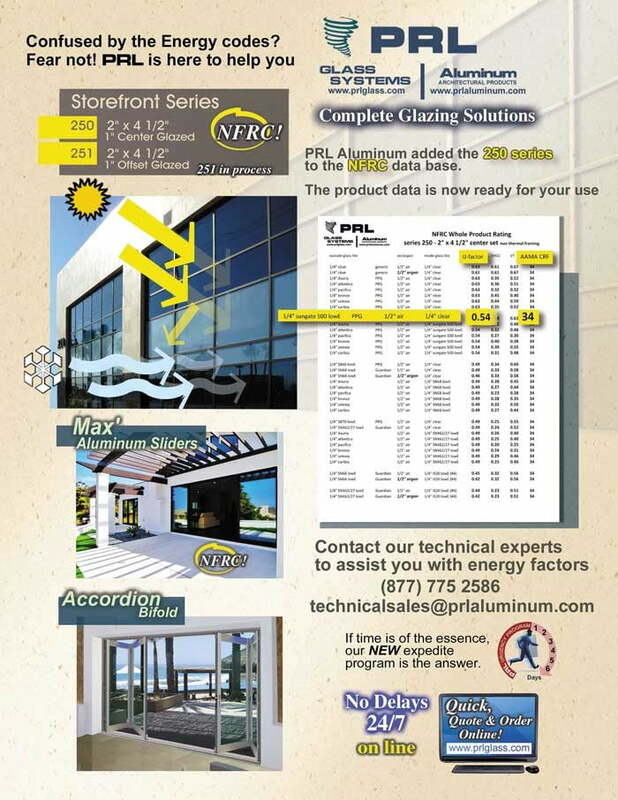 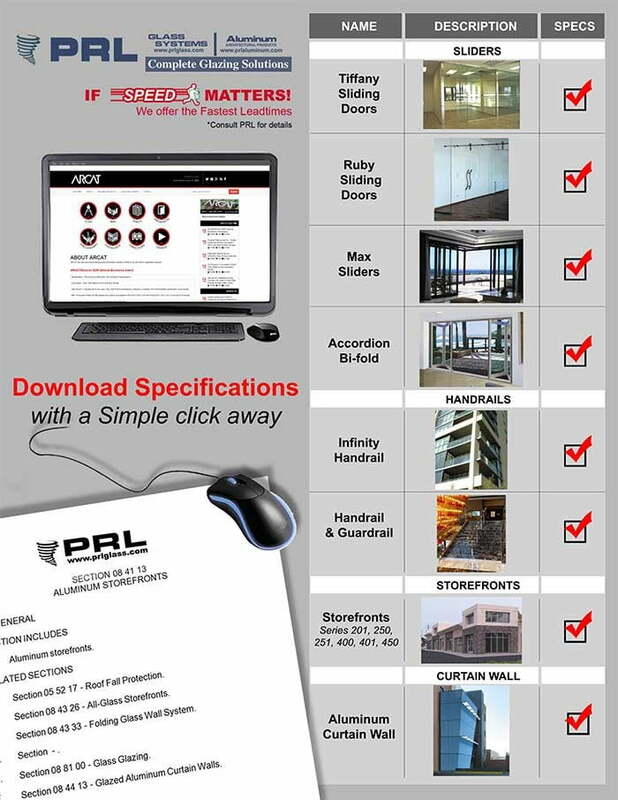 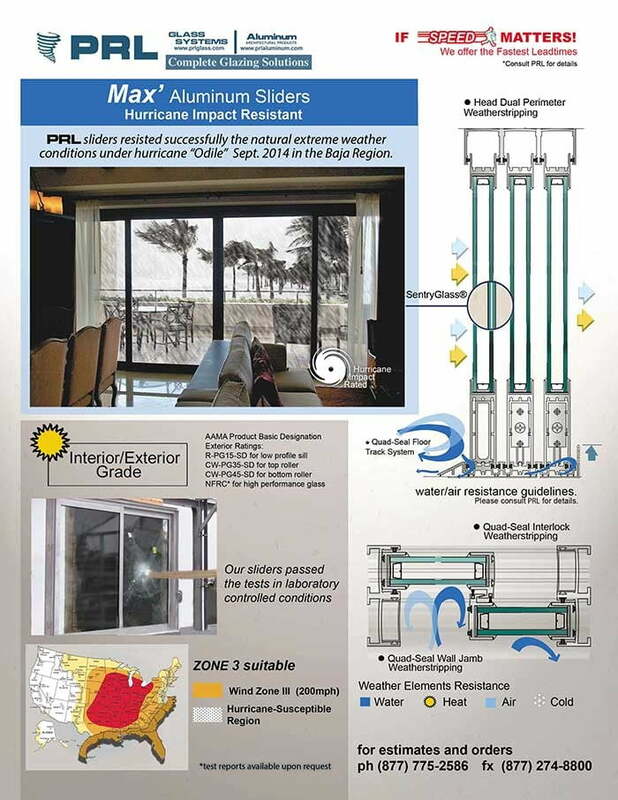 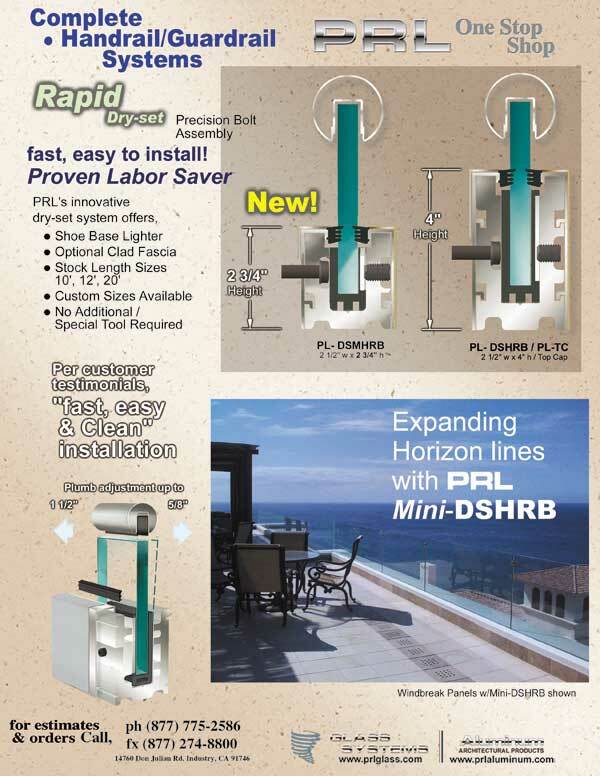 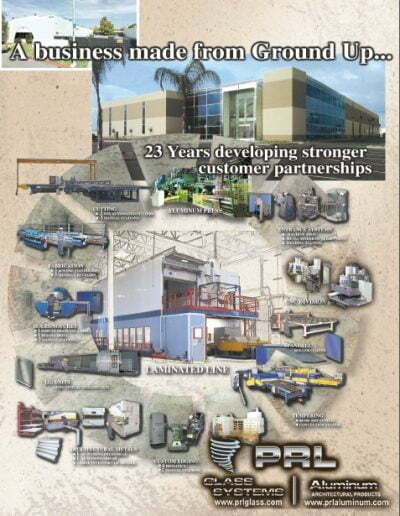 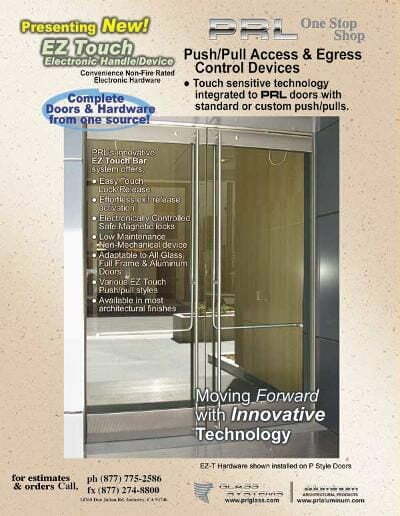 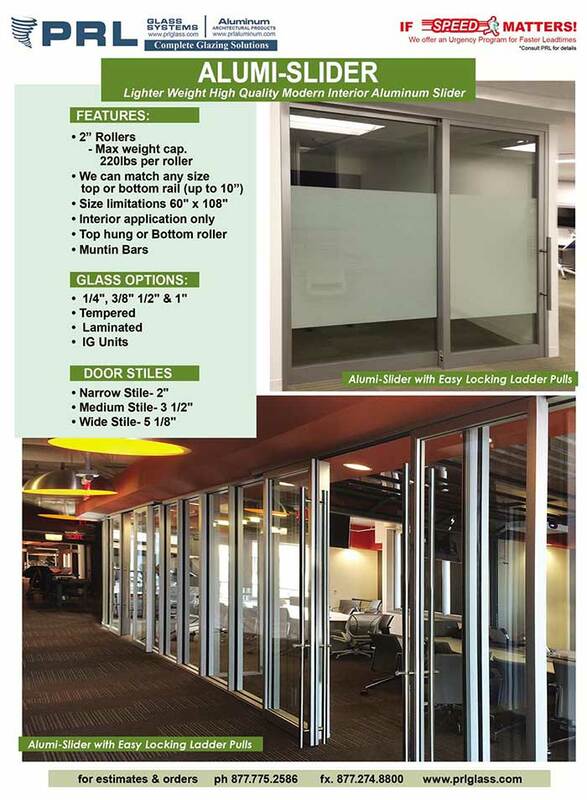 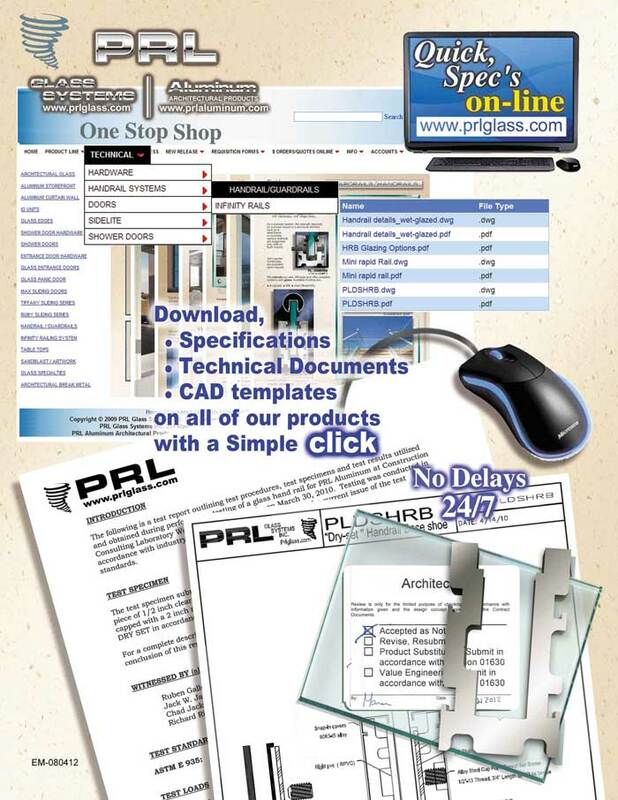 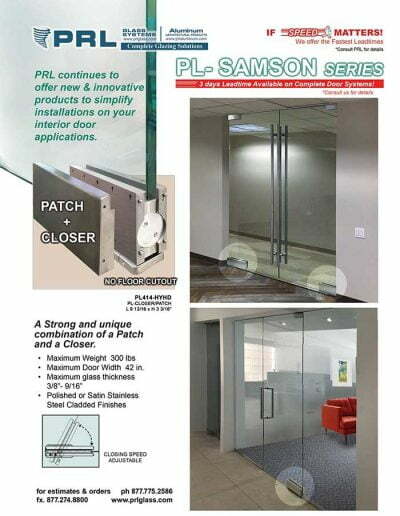 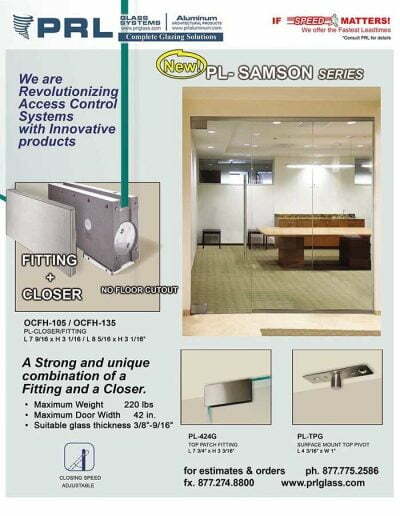 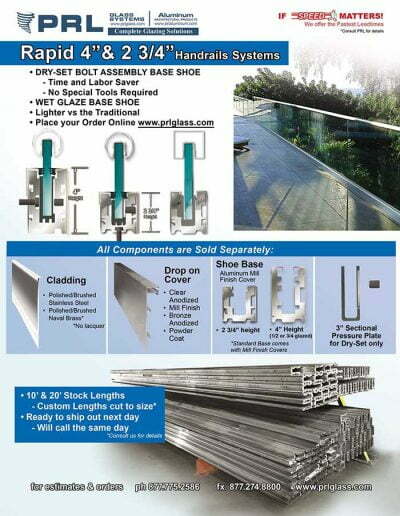 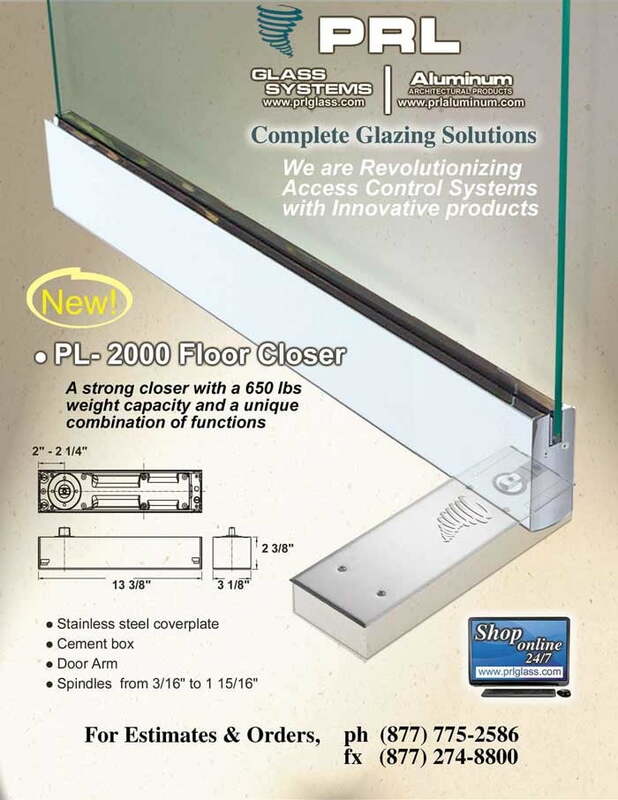 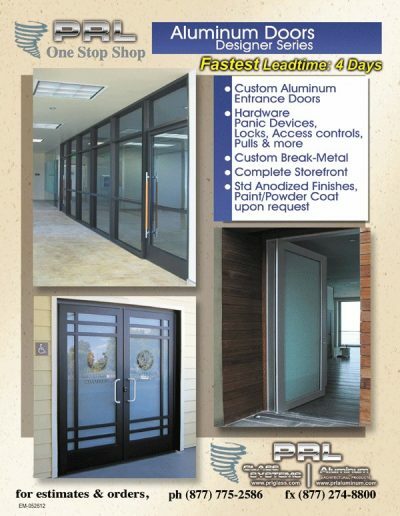 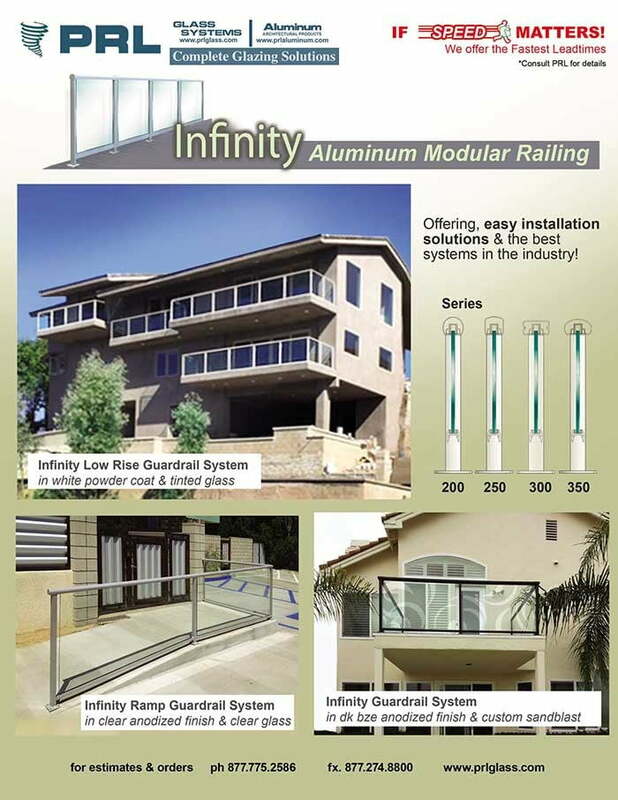 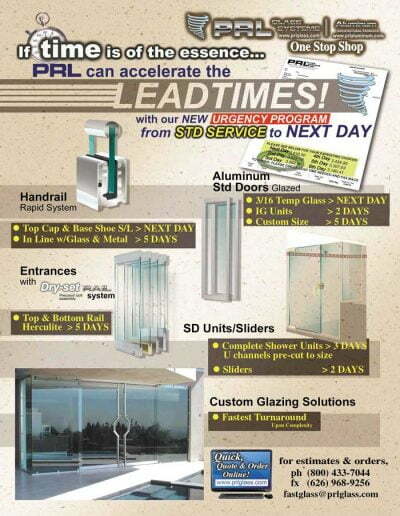 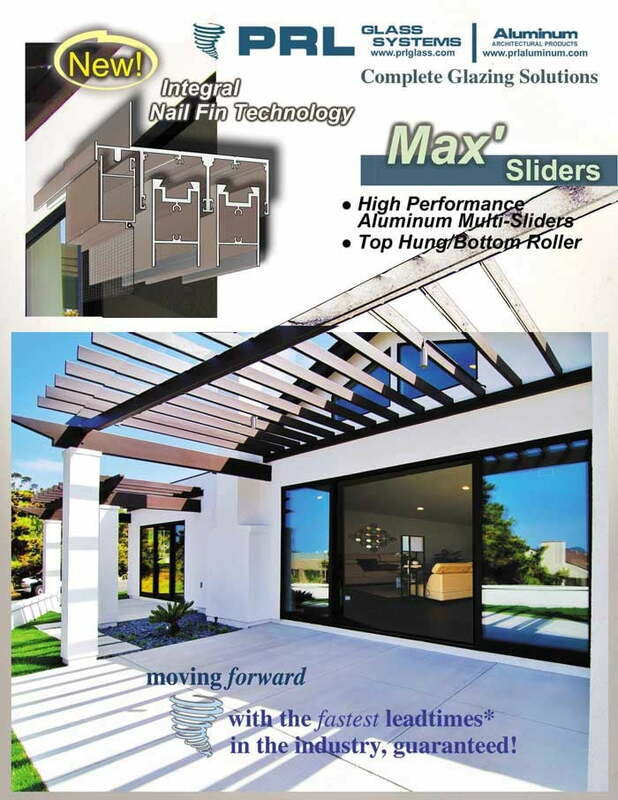 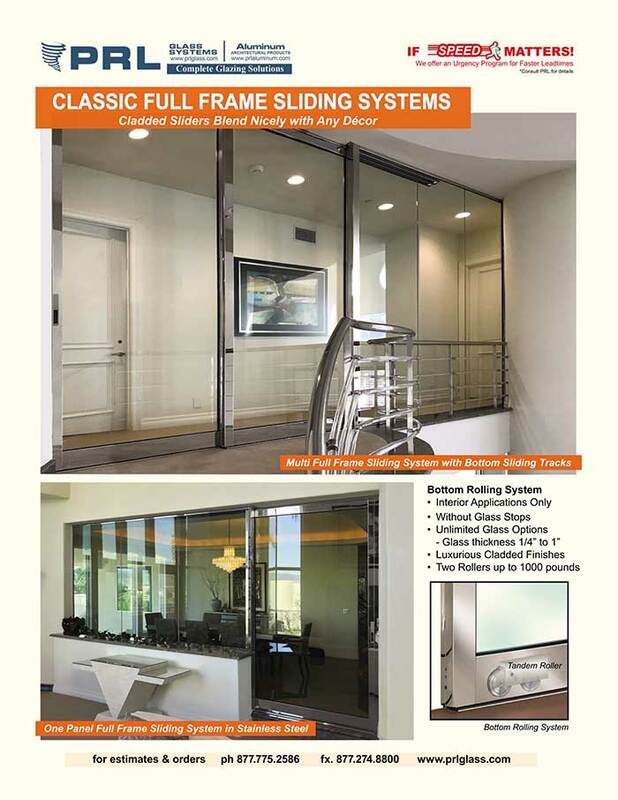 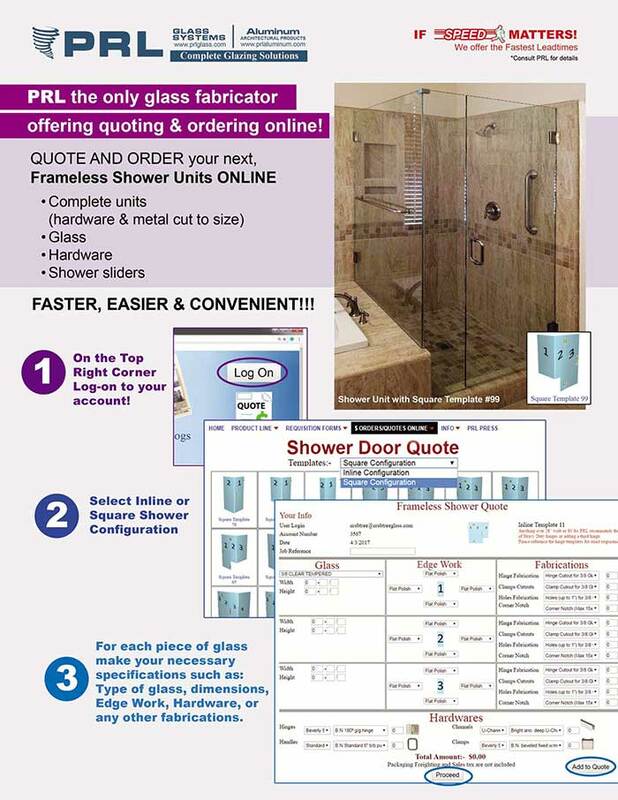 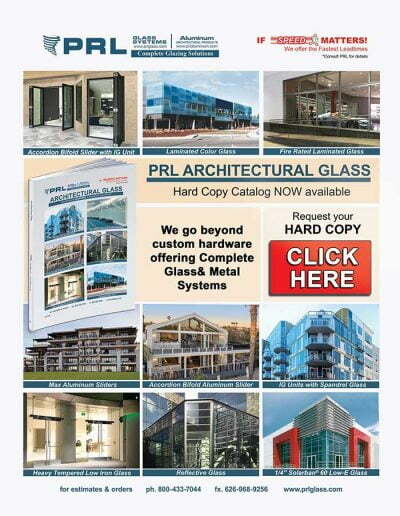 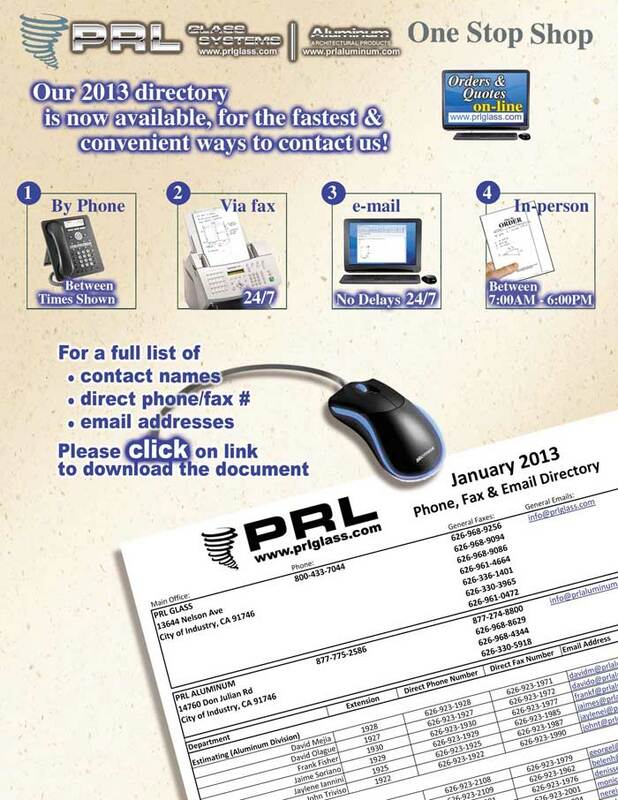 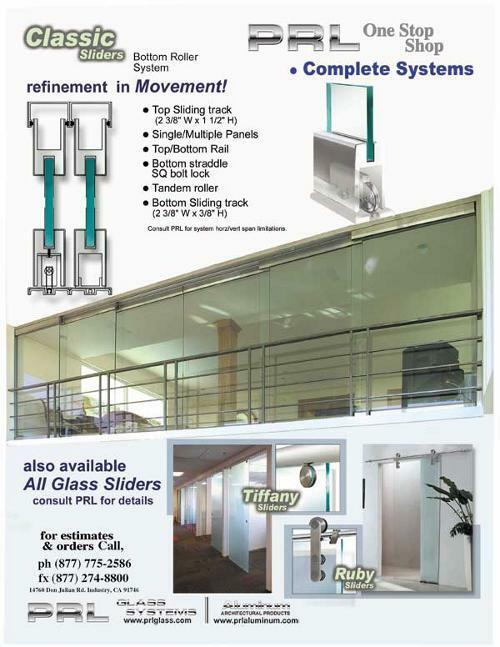 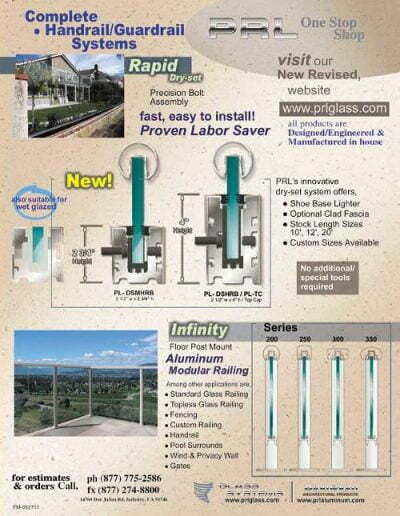 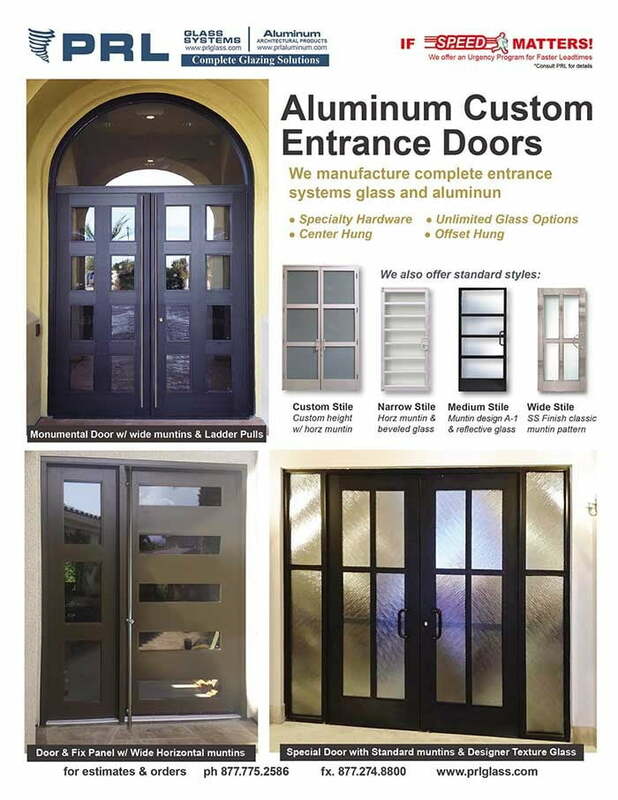 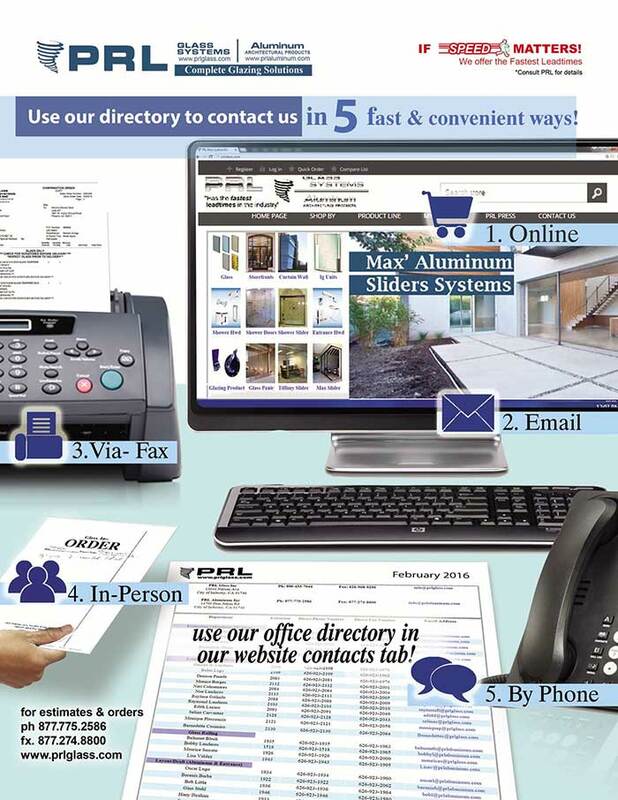 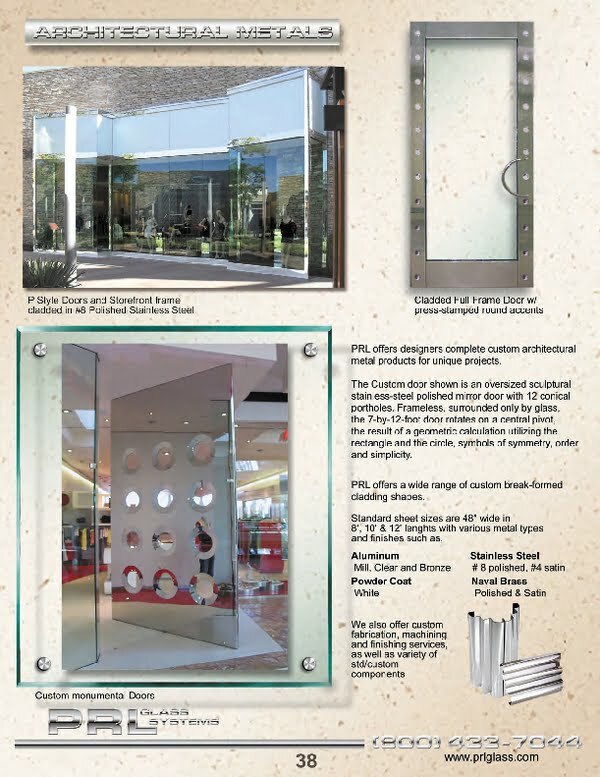 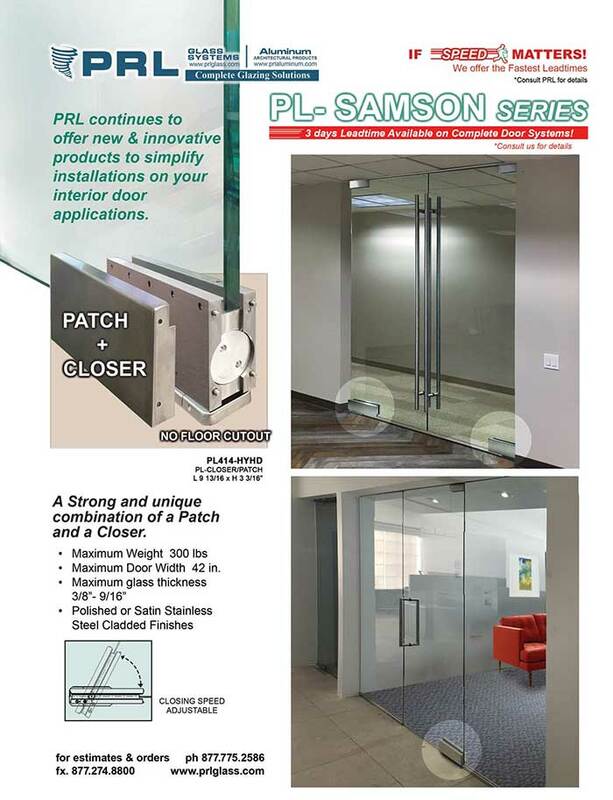 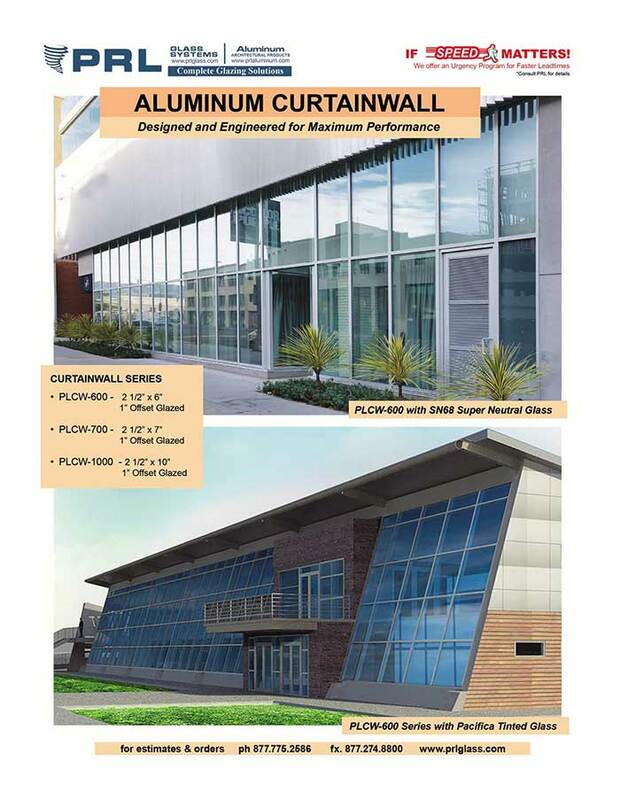 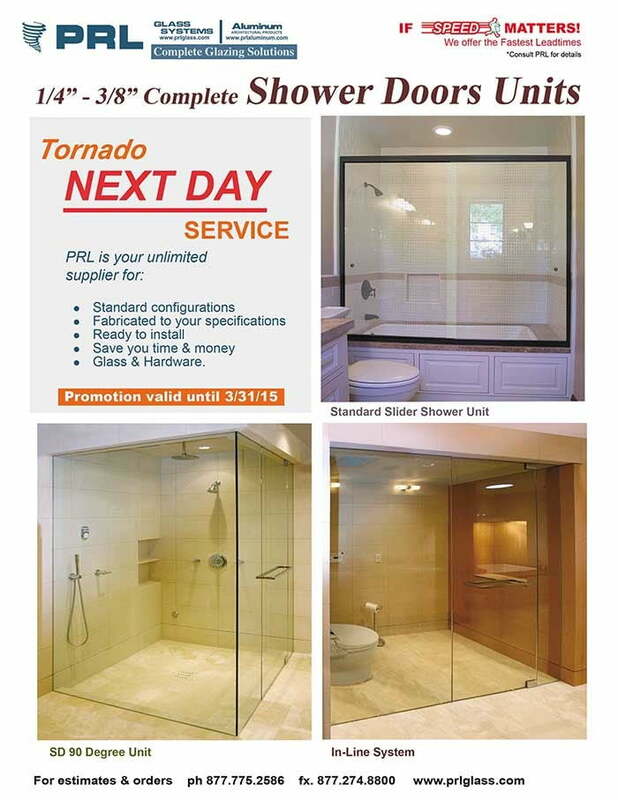 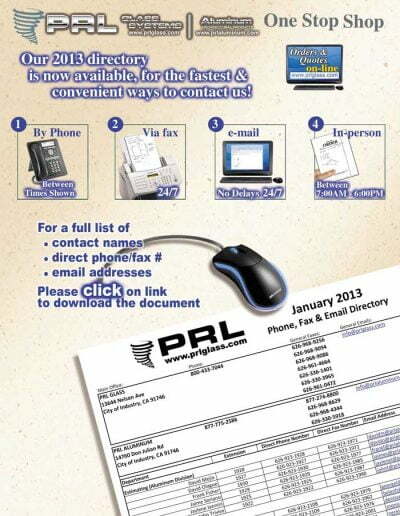 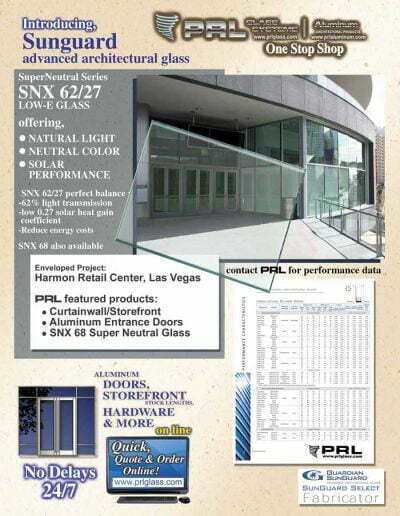 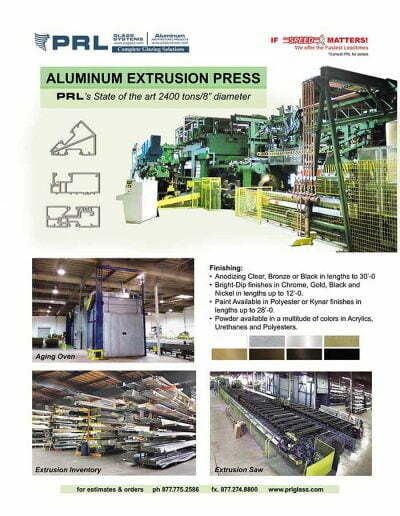 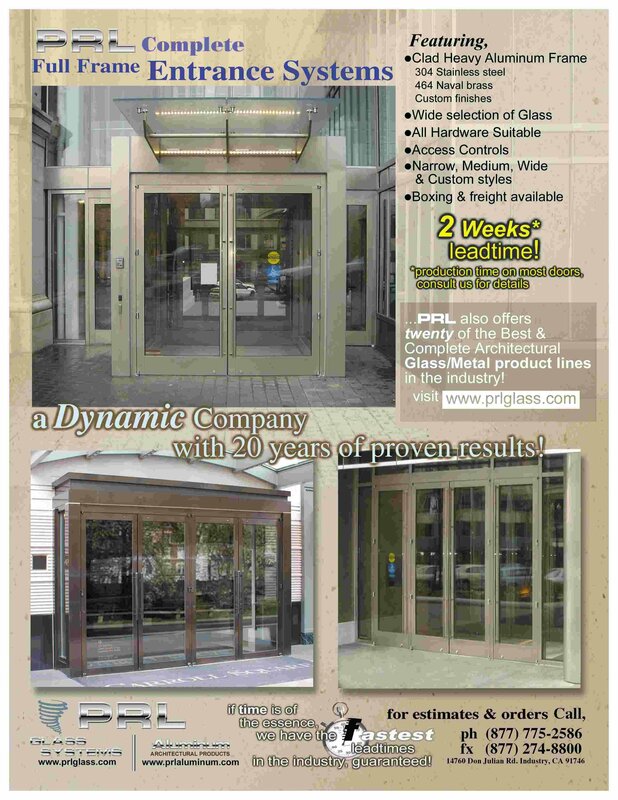 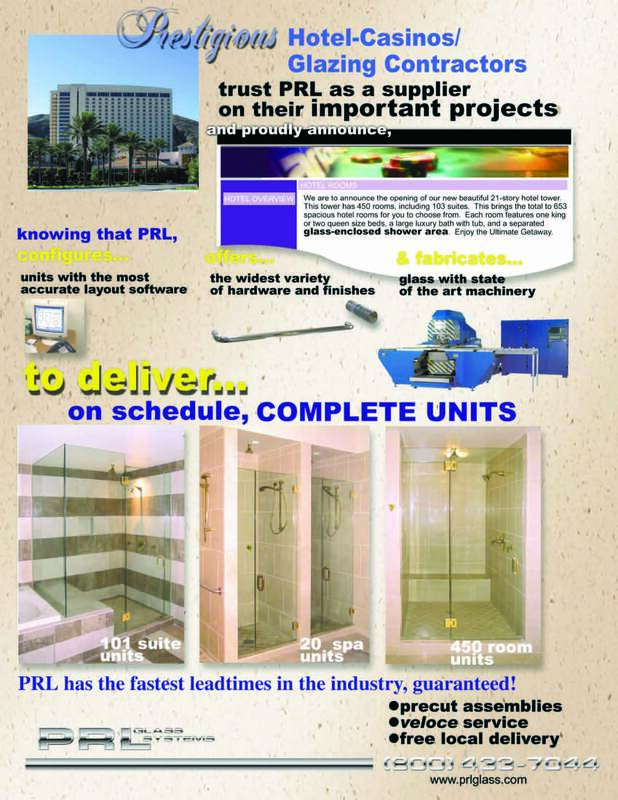 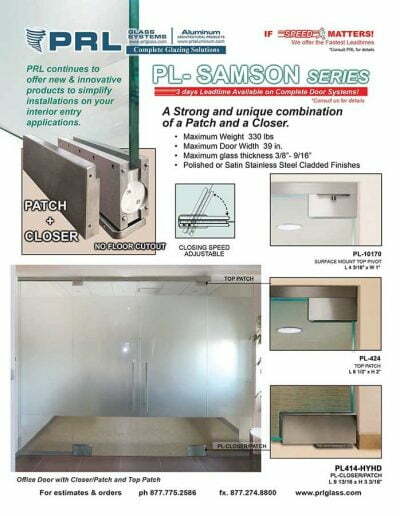 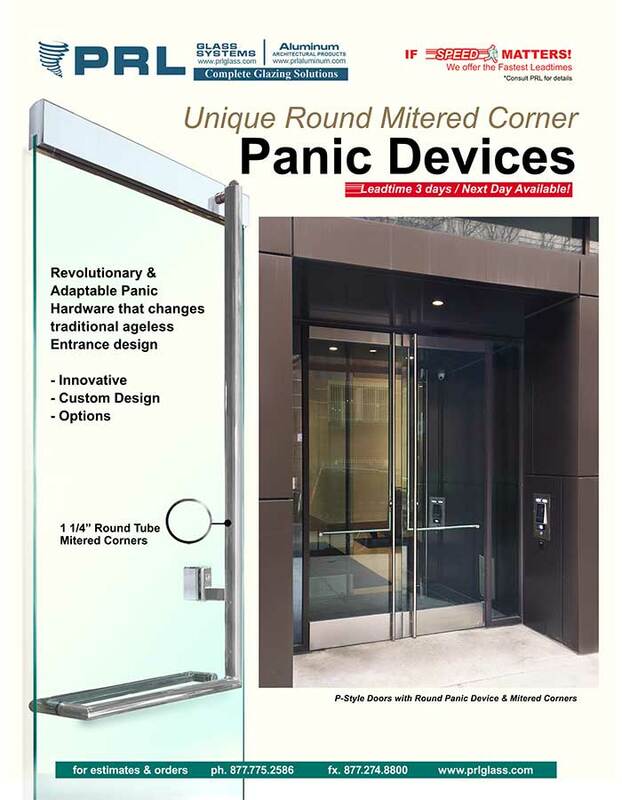 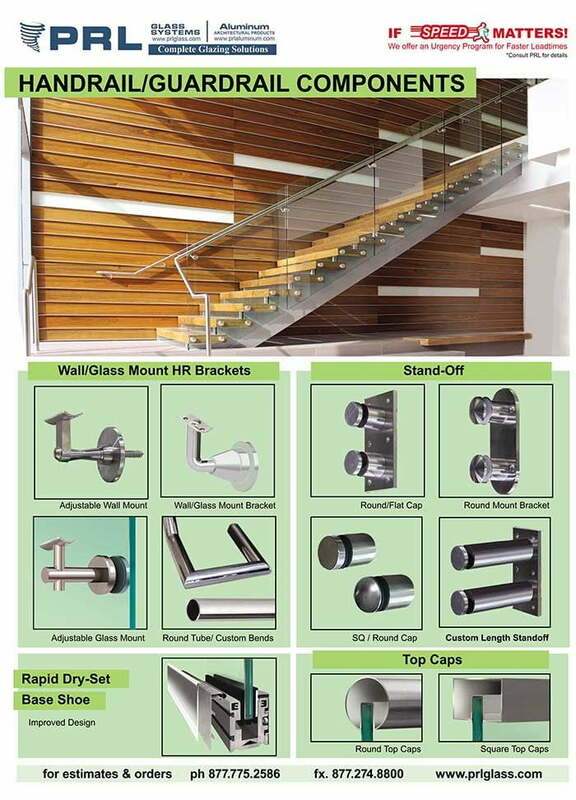 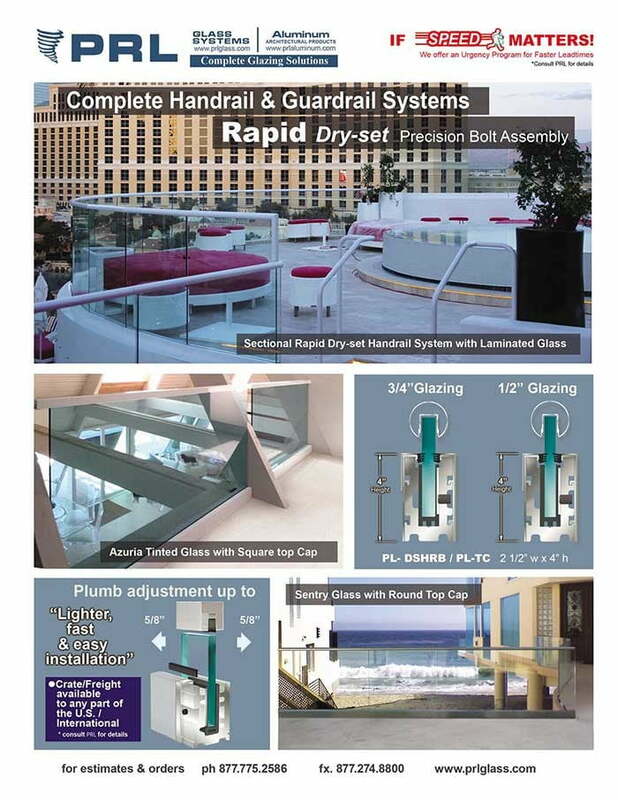 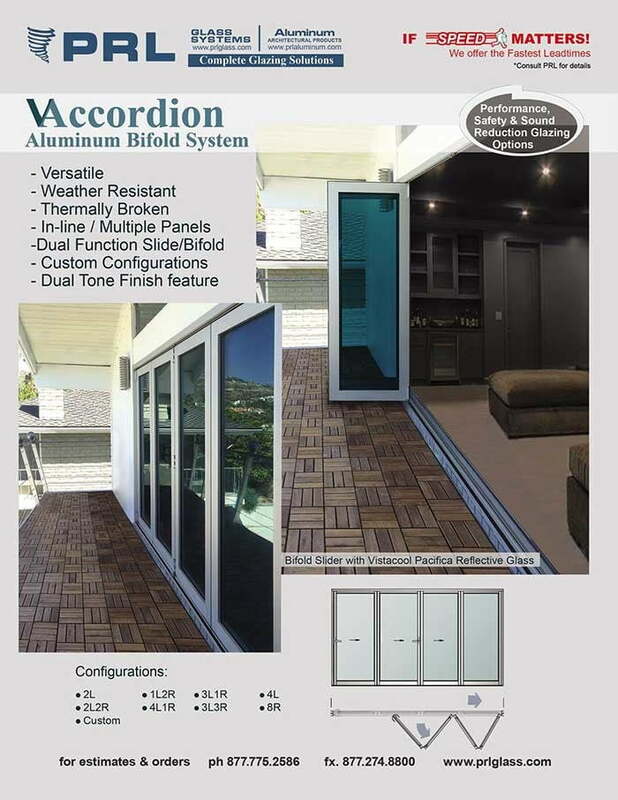 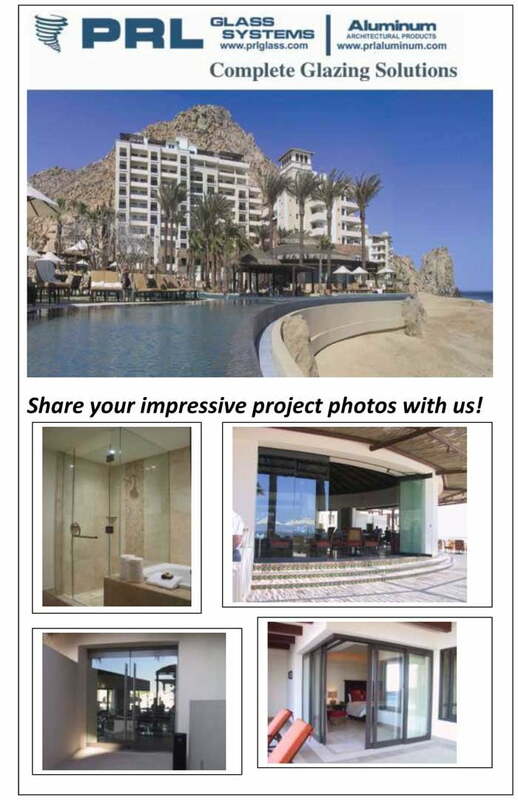 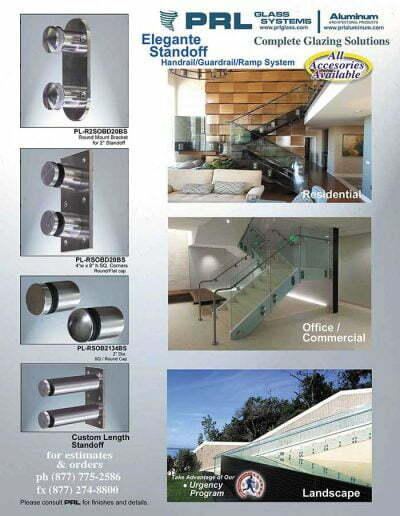 PRL also offers our customers complete architectural aluminum systems to complement and provide a one source supplier option. 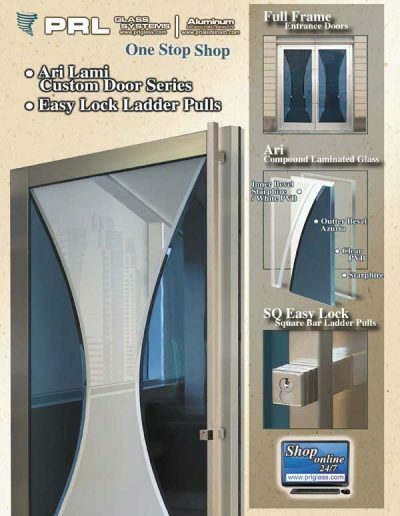 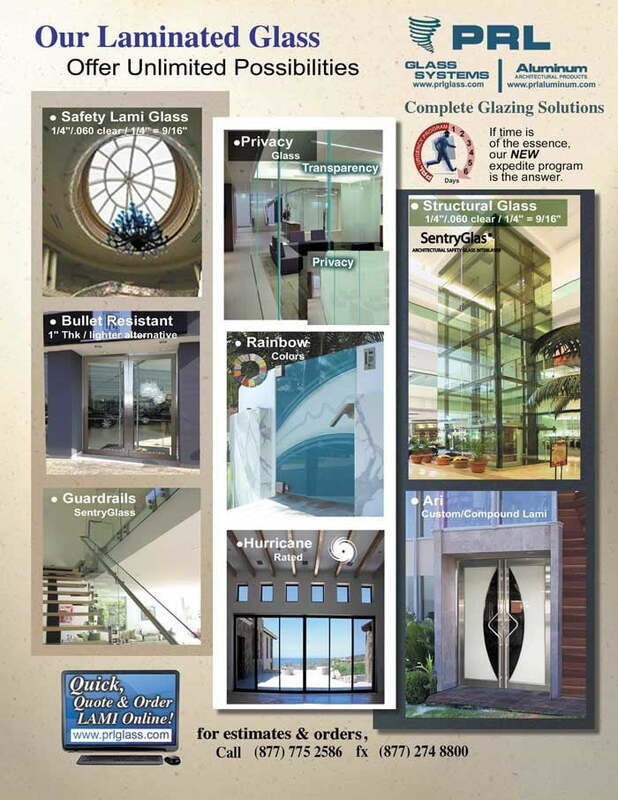 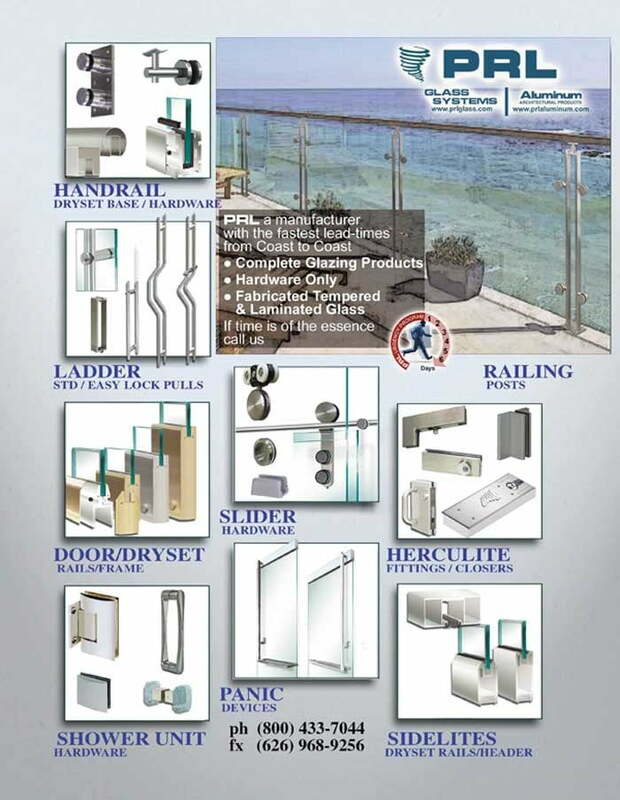 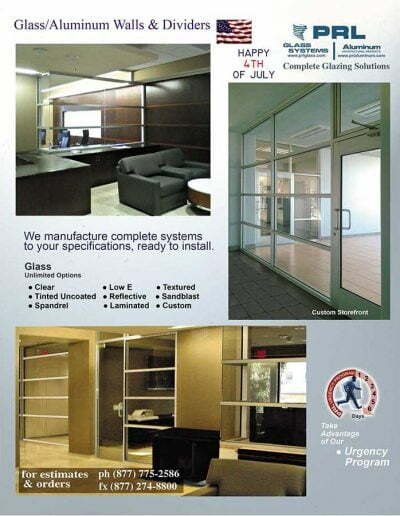 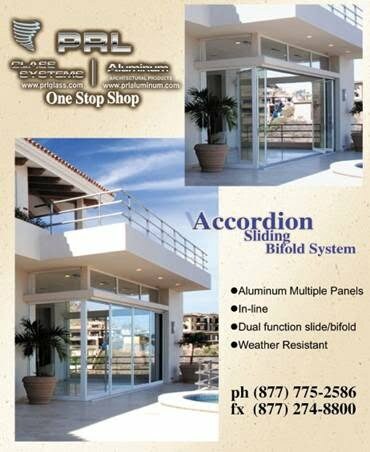 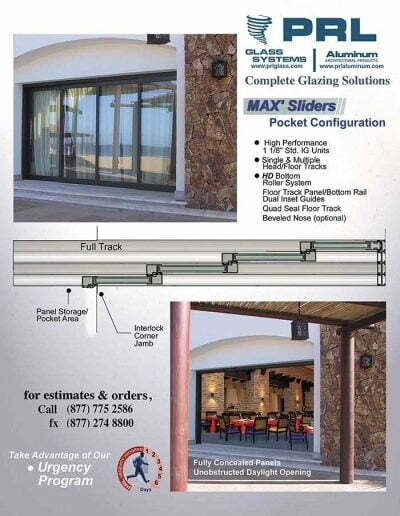 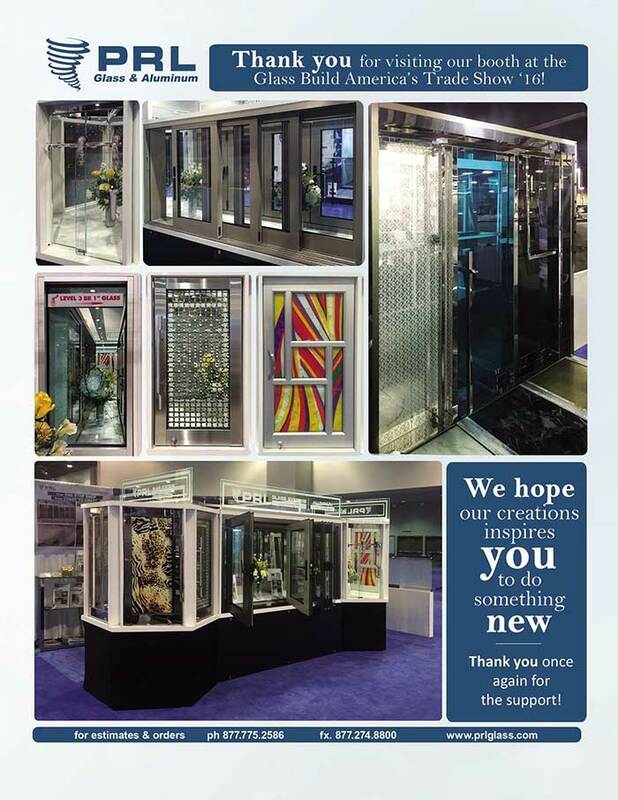 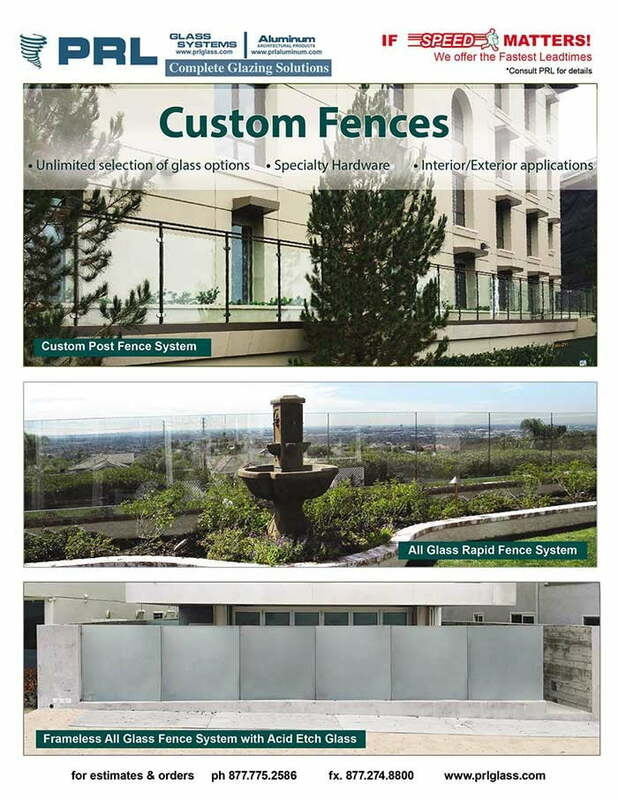 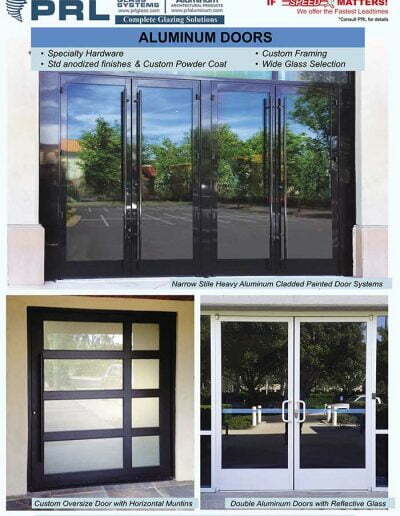 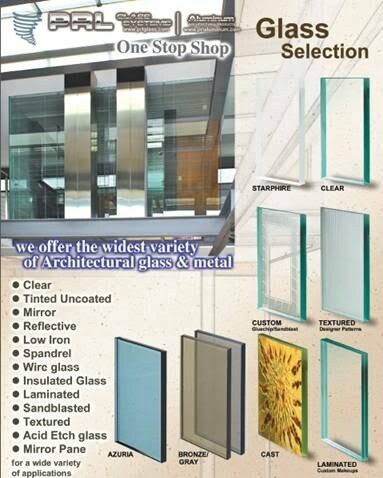 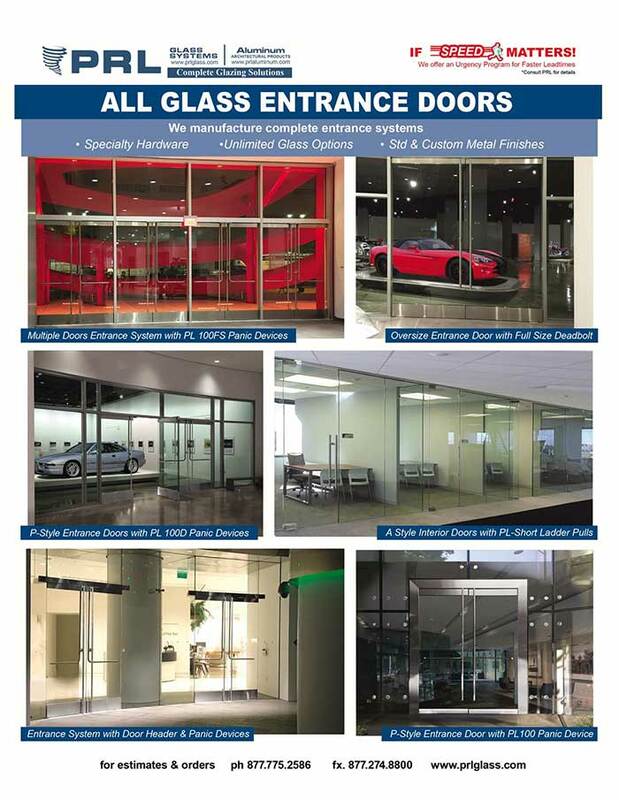 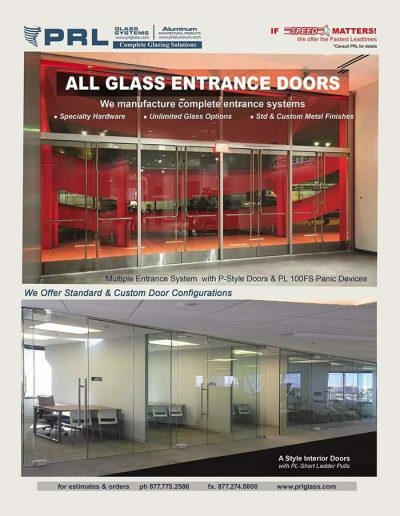 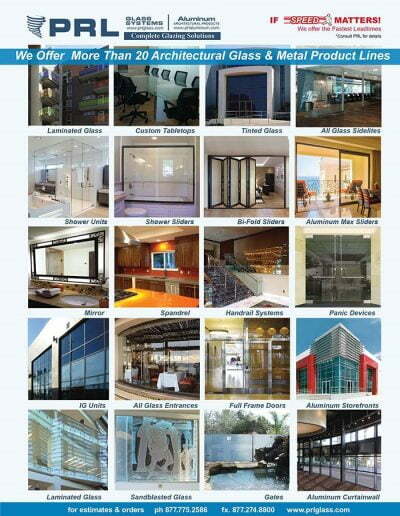 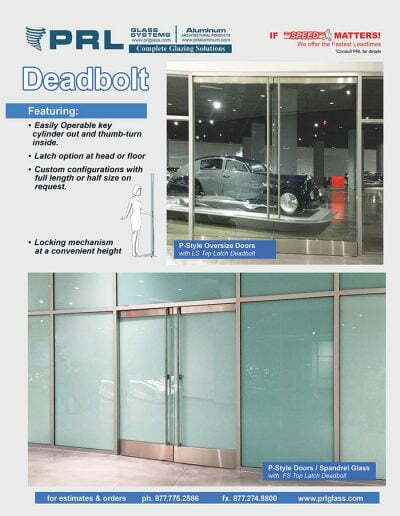 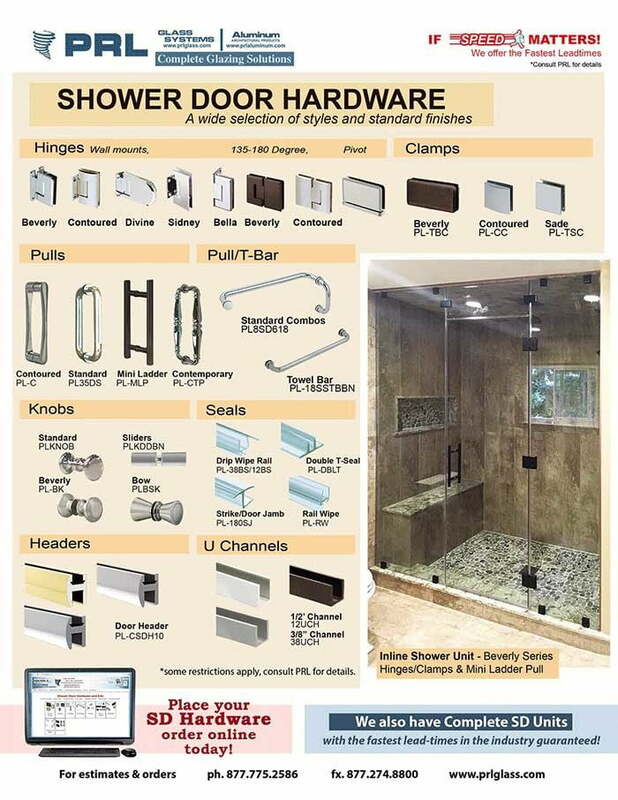 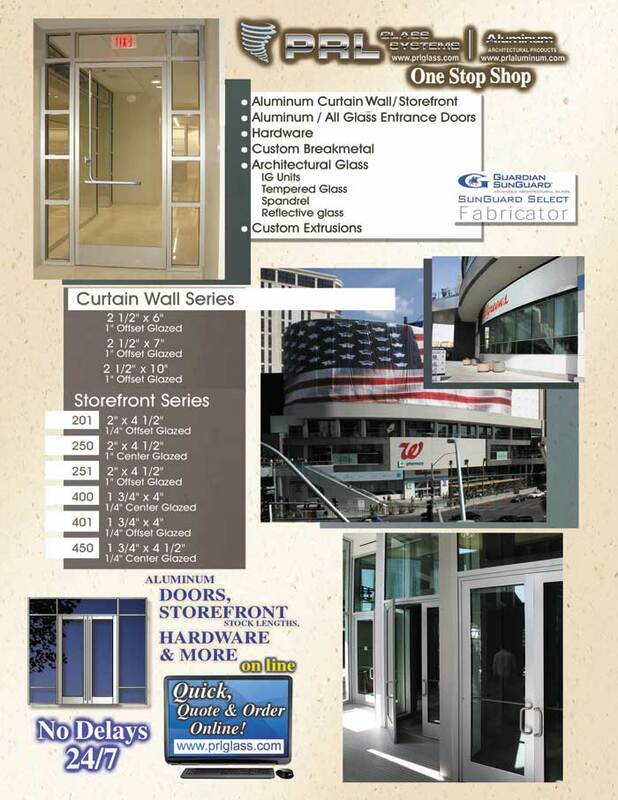 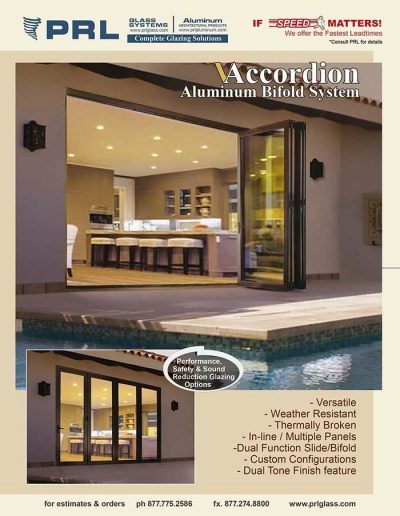 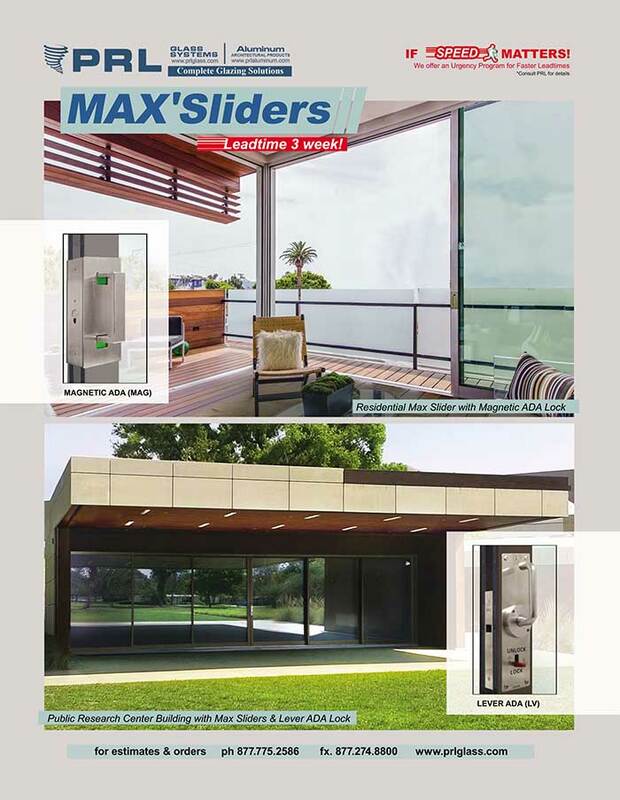 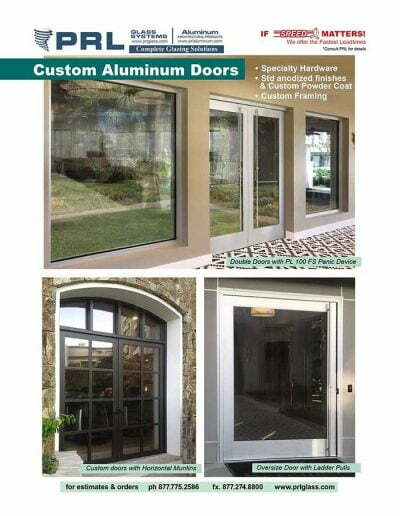 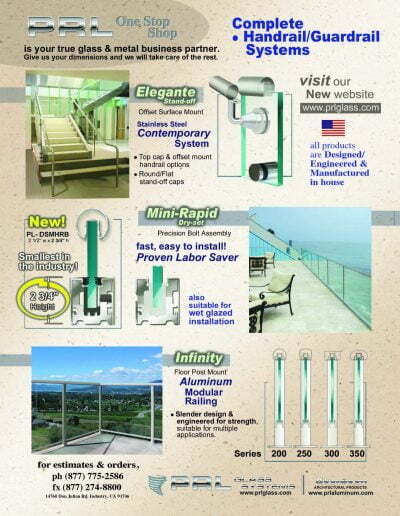 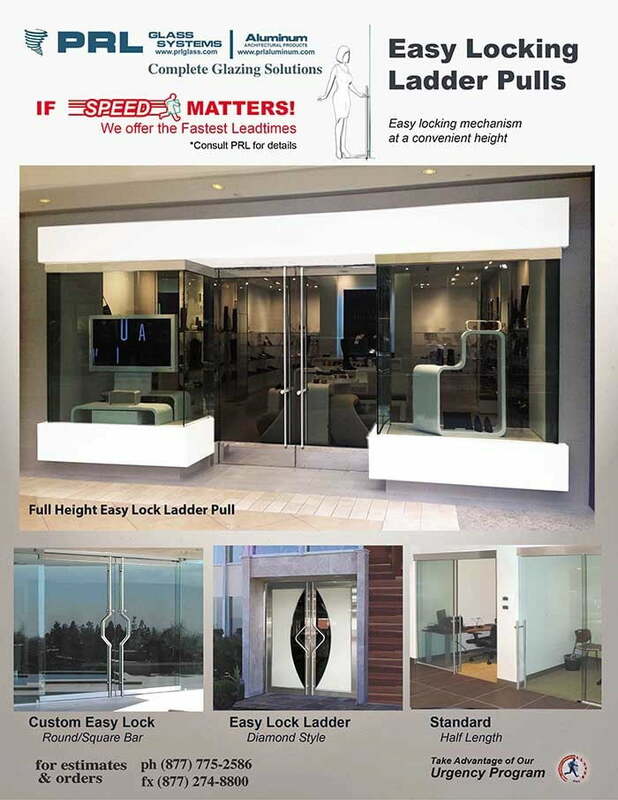 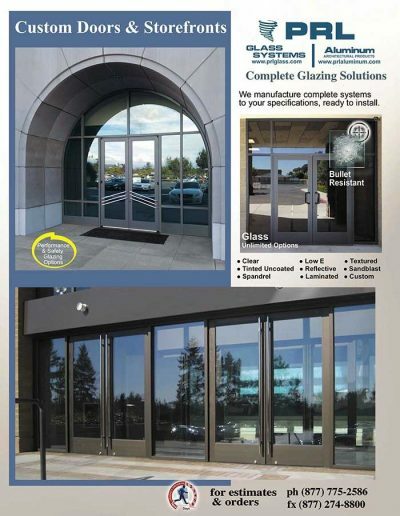 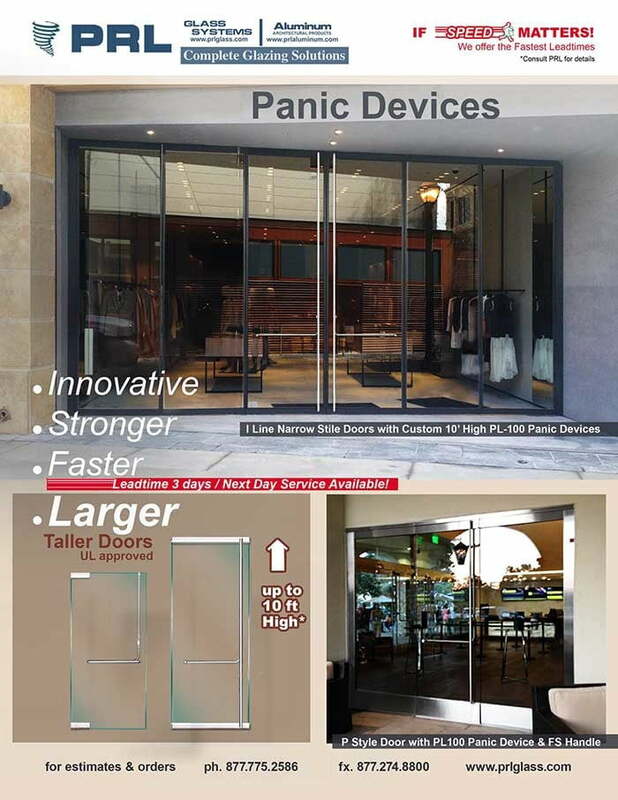 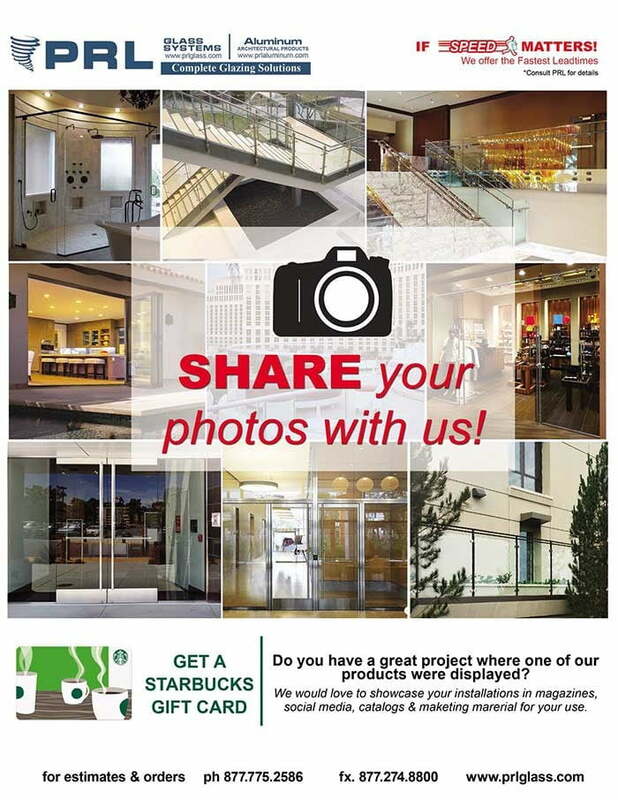 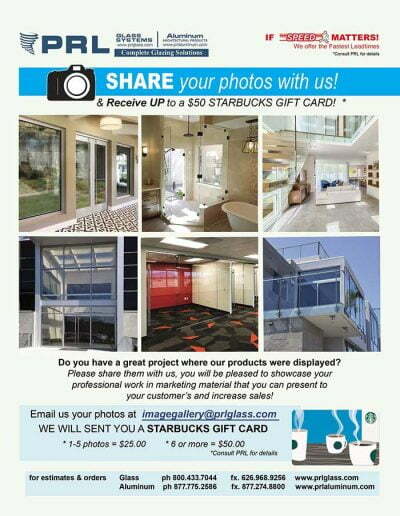 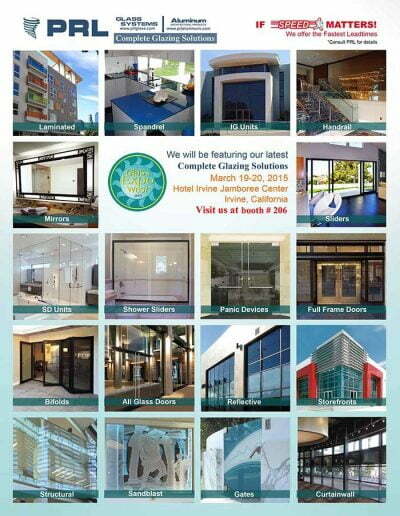 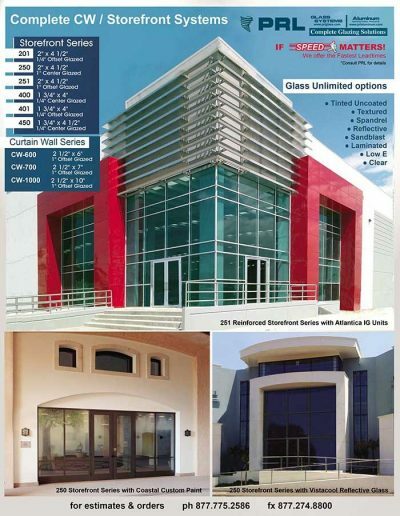 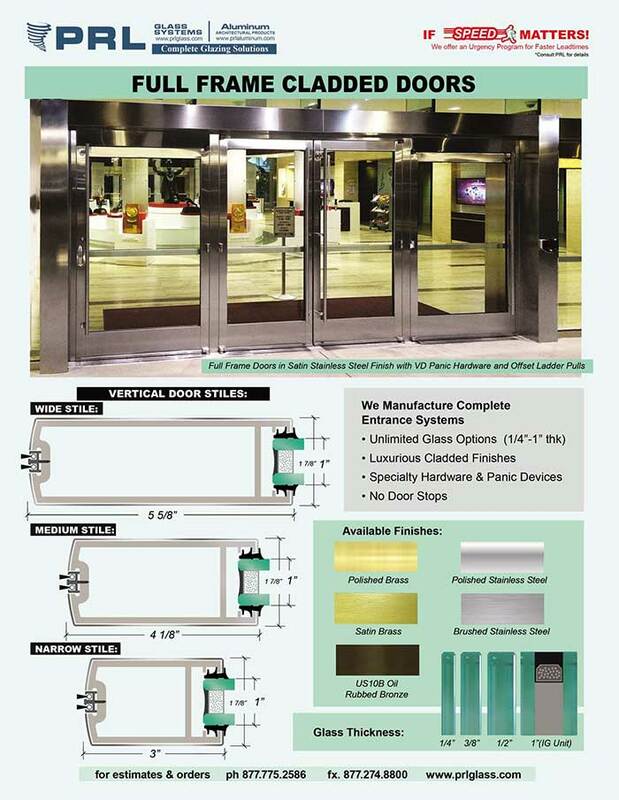 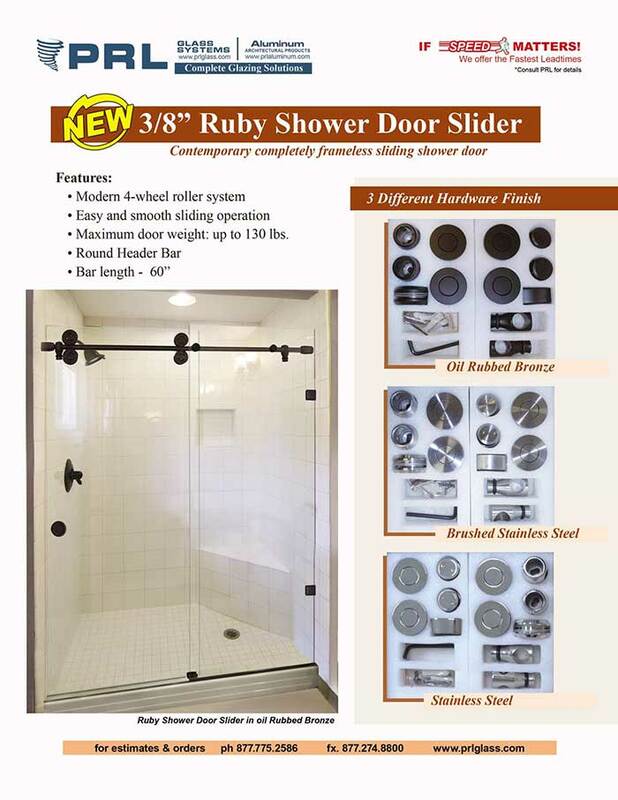 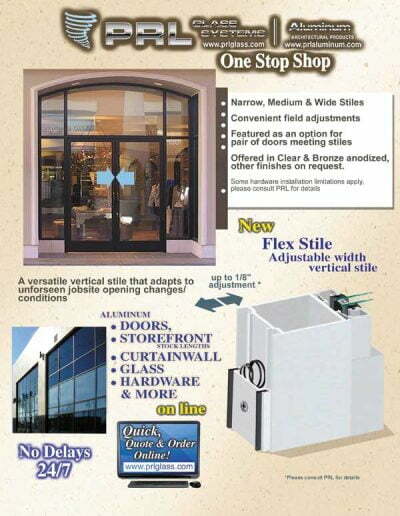 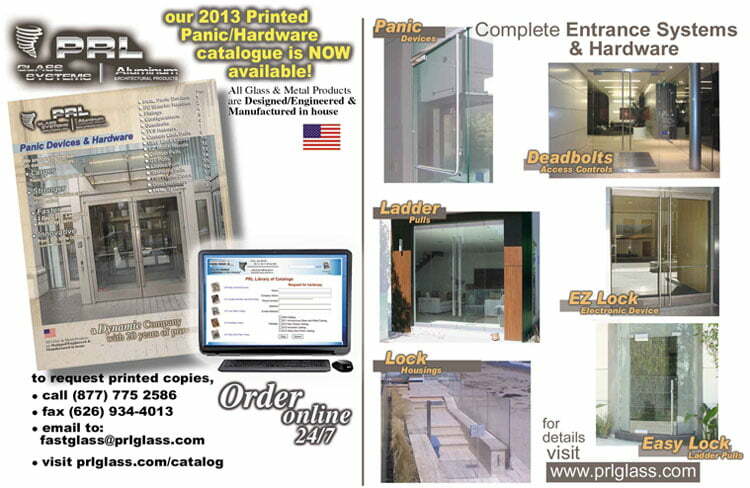 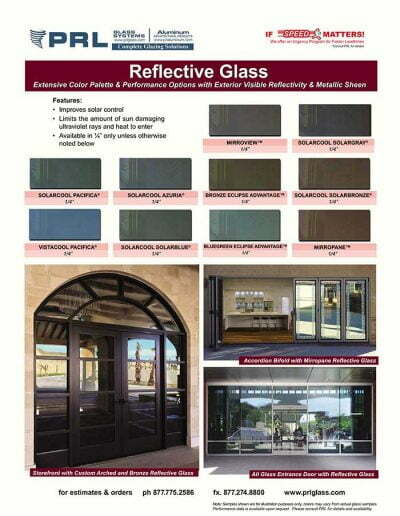 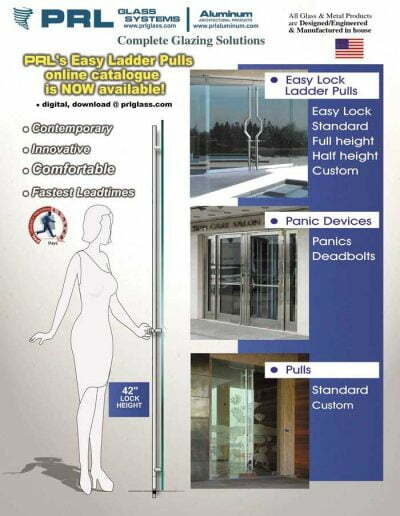 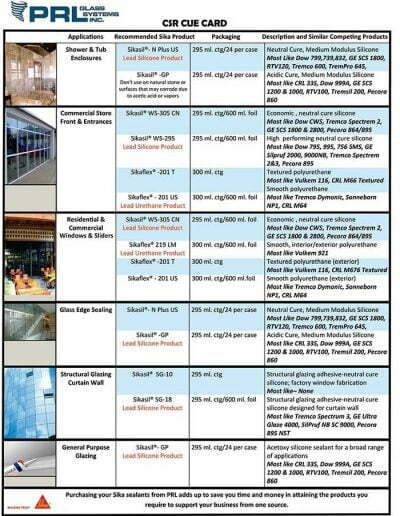 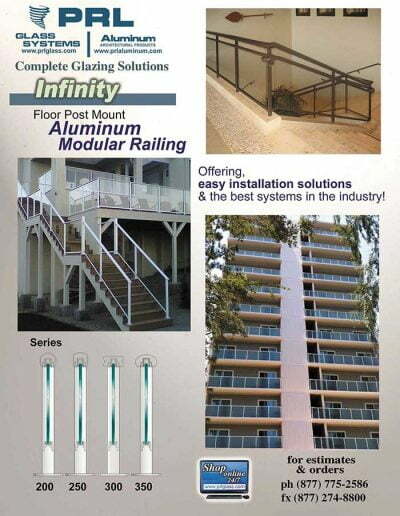 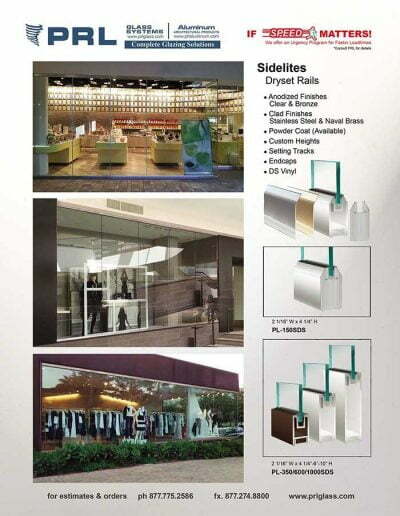 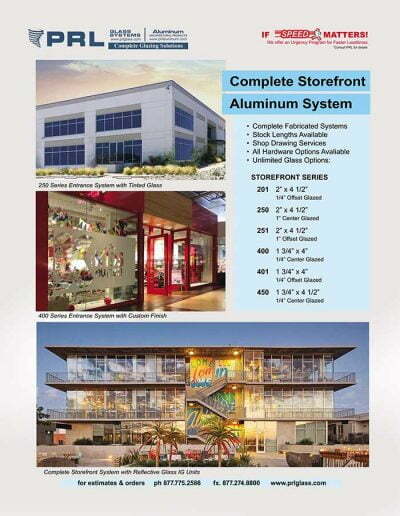 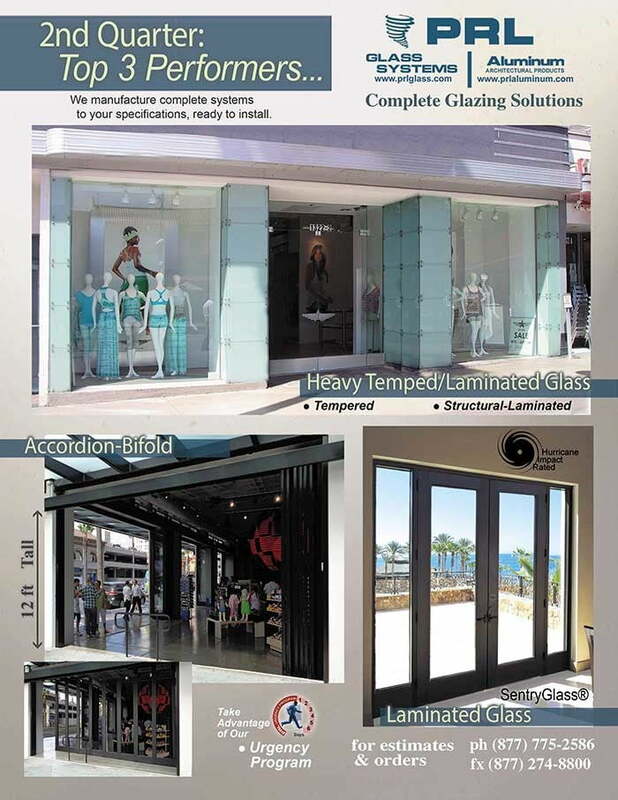 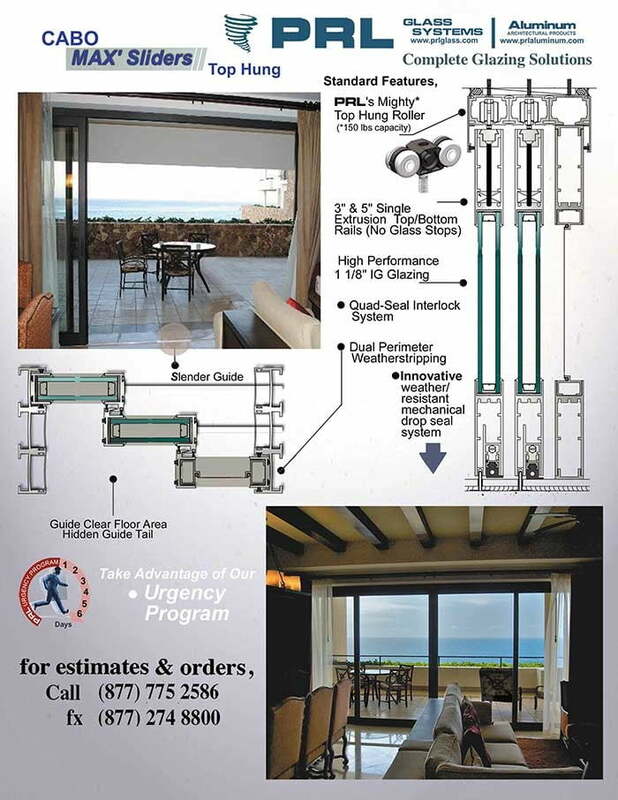 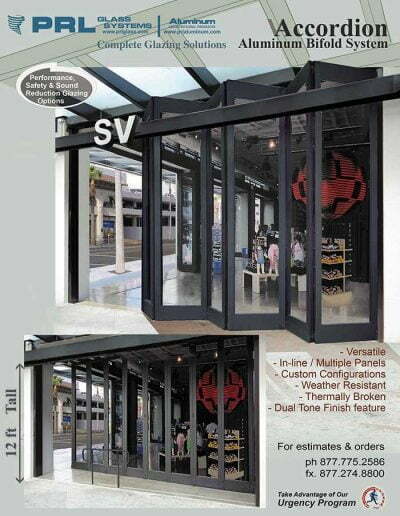 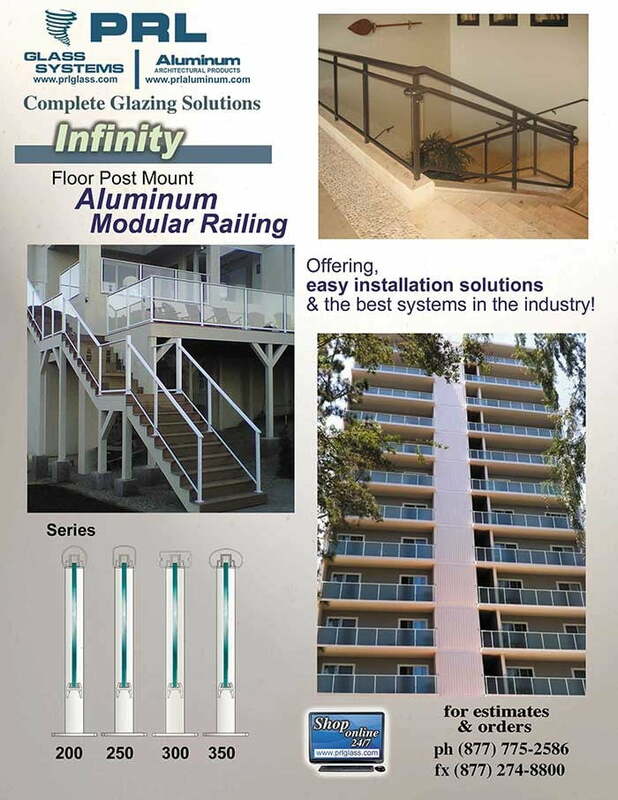 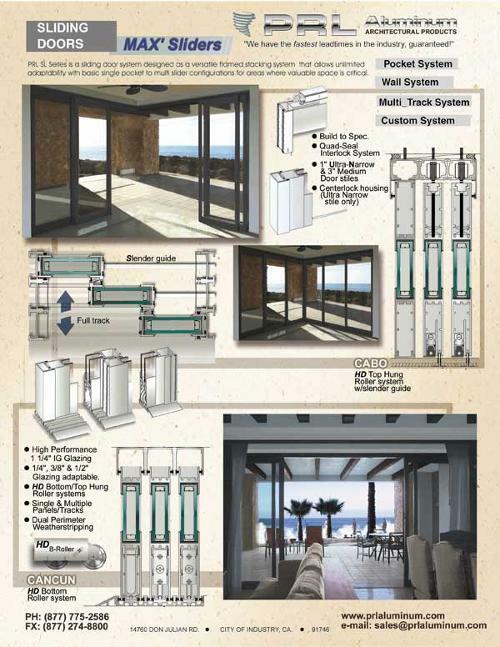 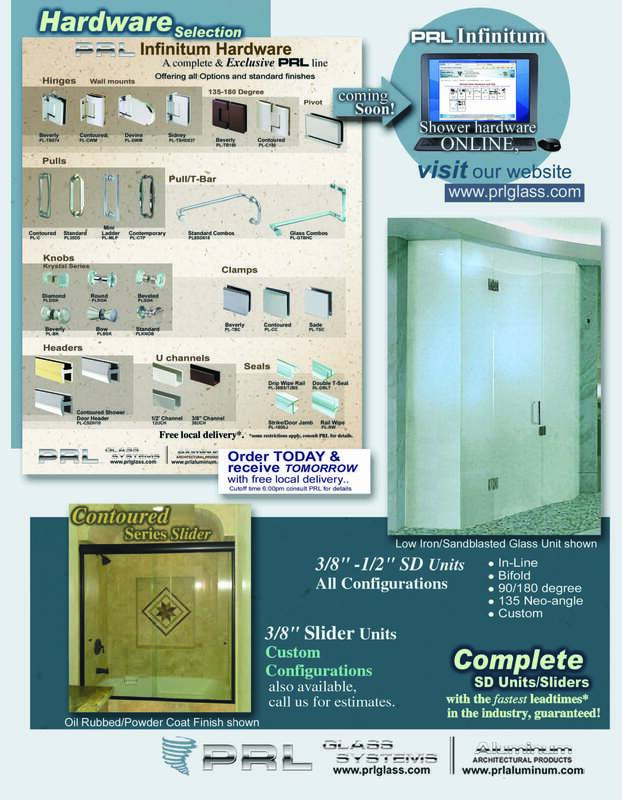 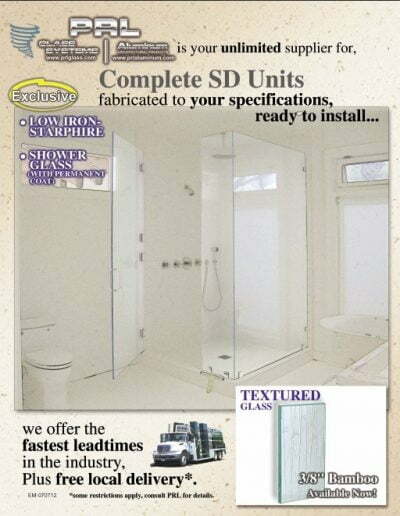 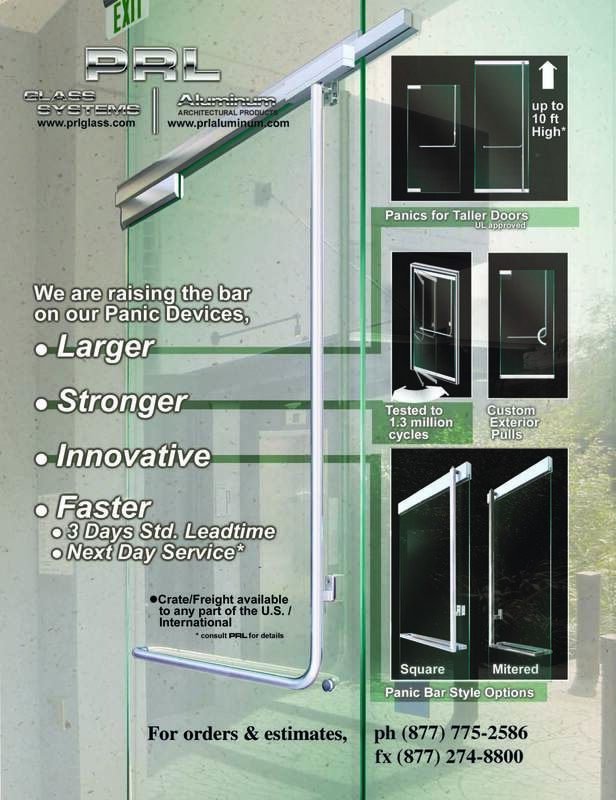 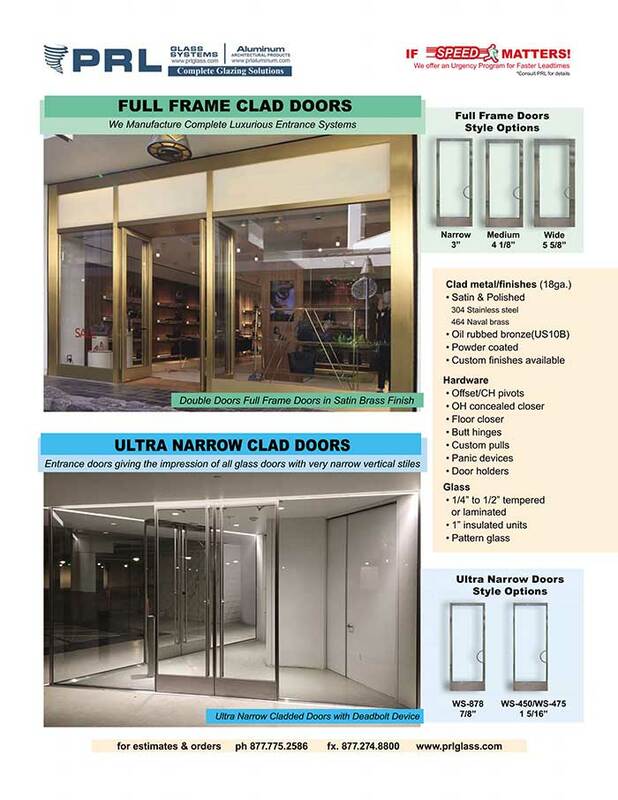 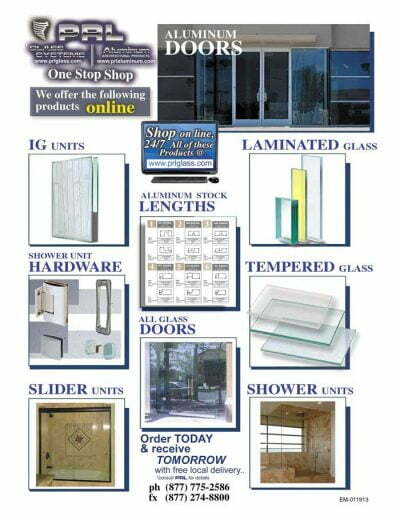 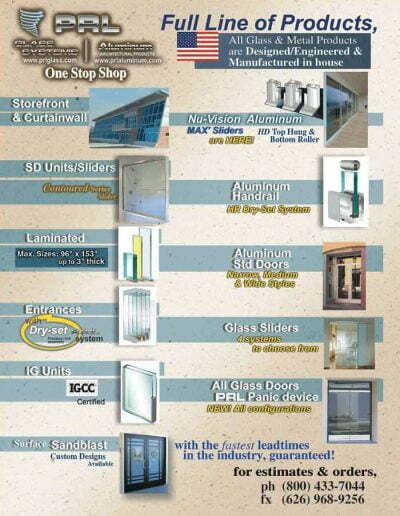 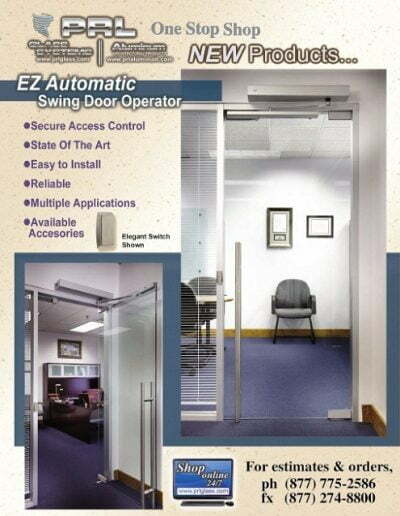 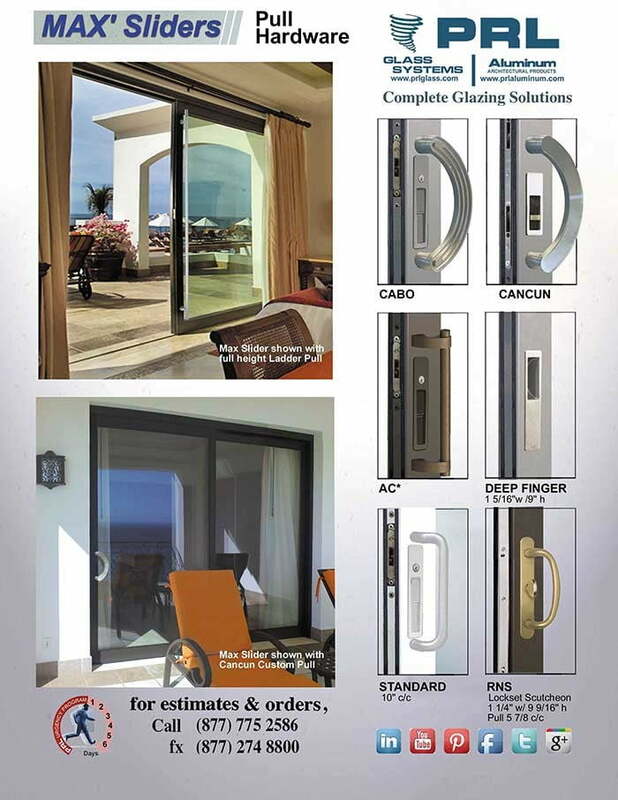 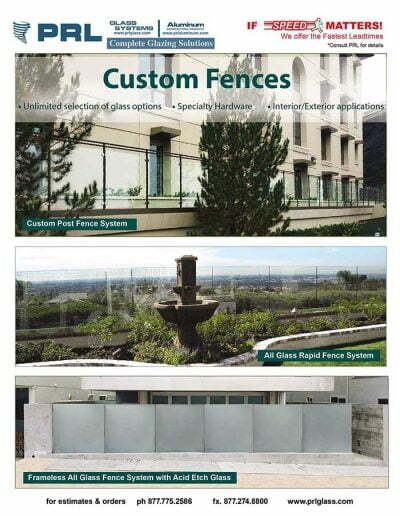 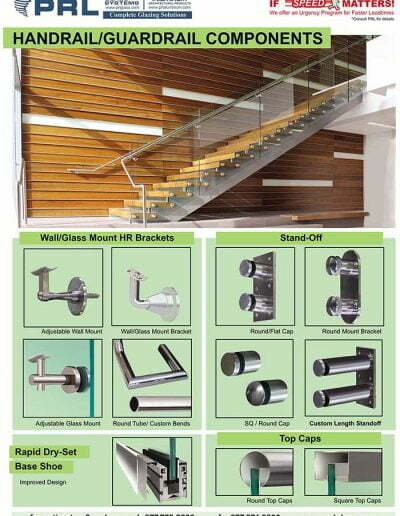 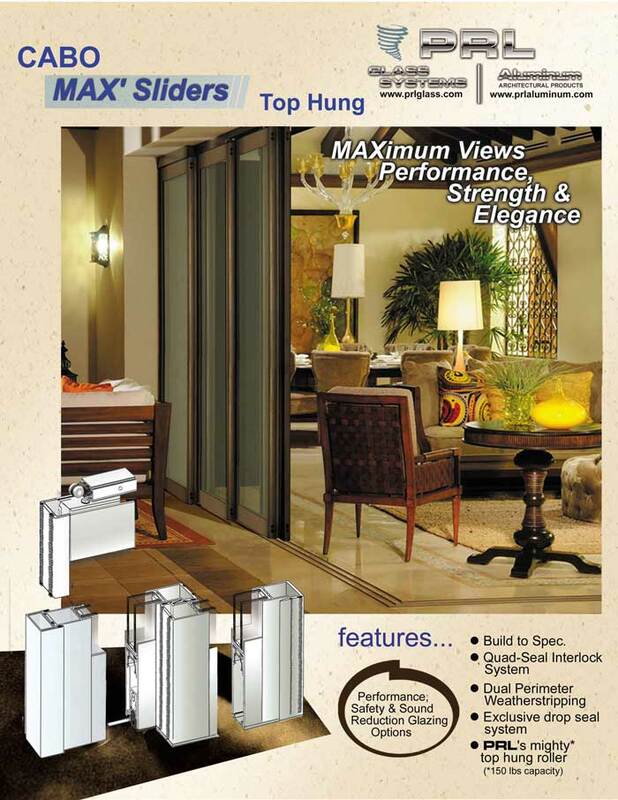 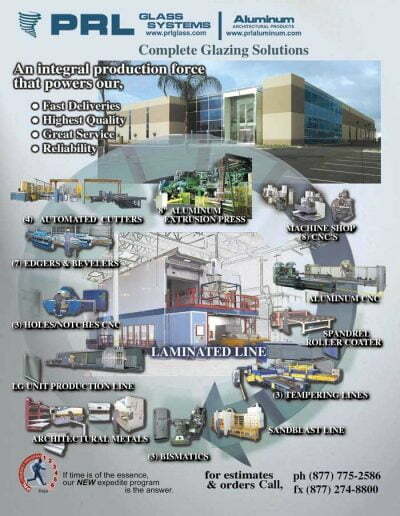 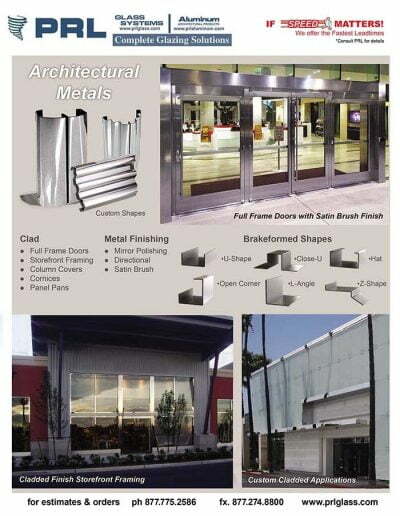 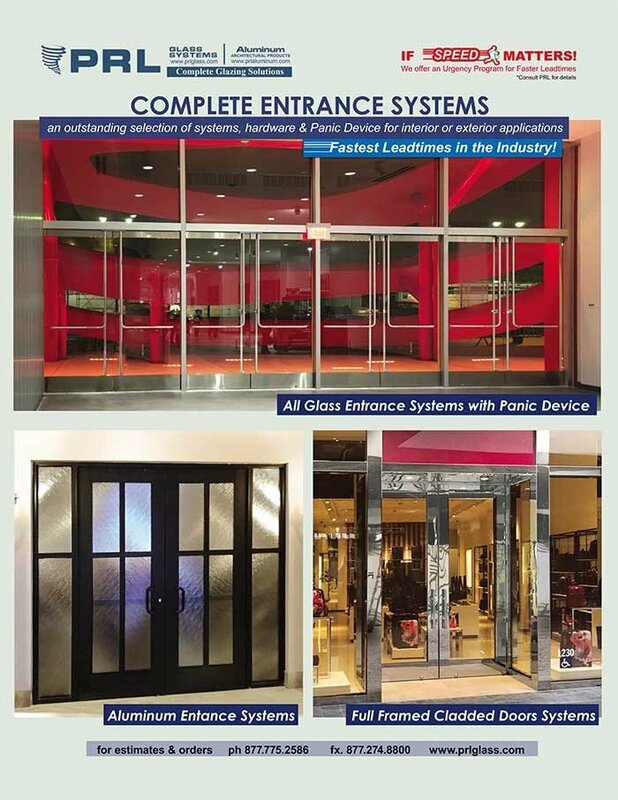 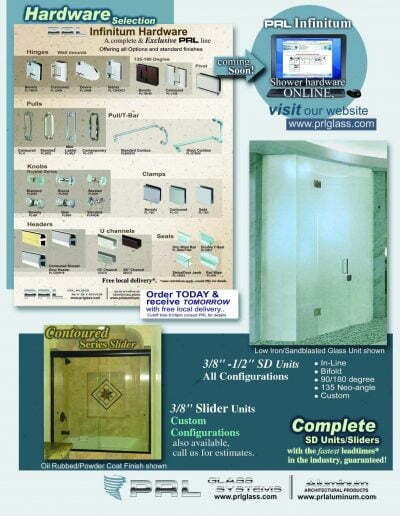 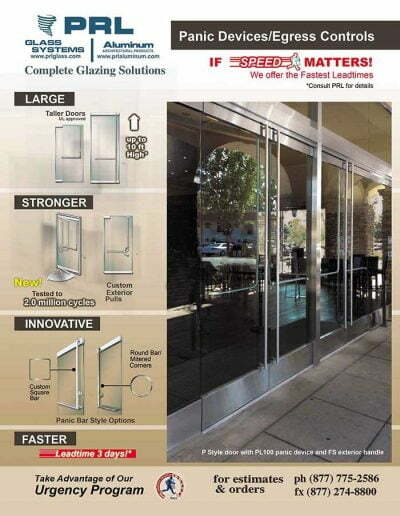 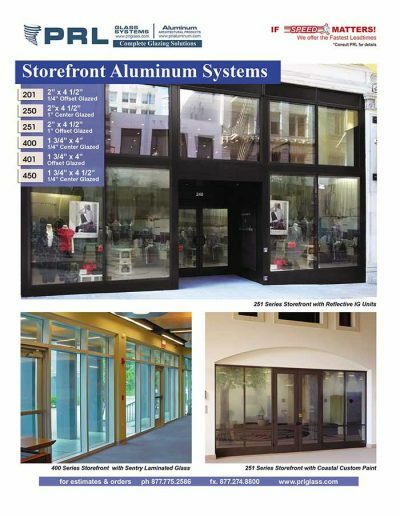 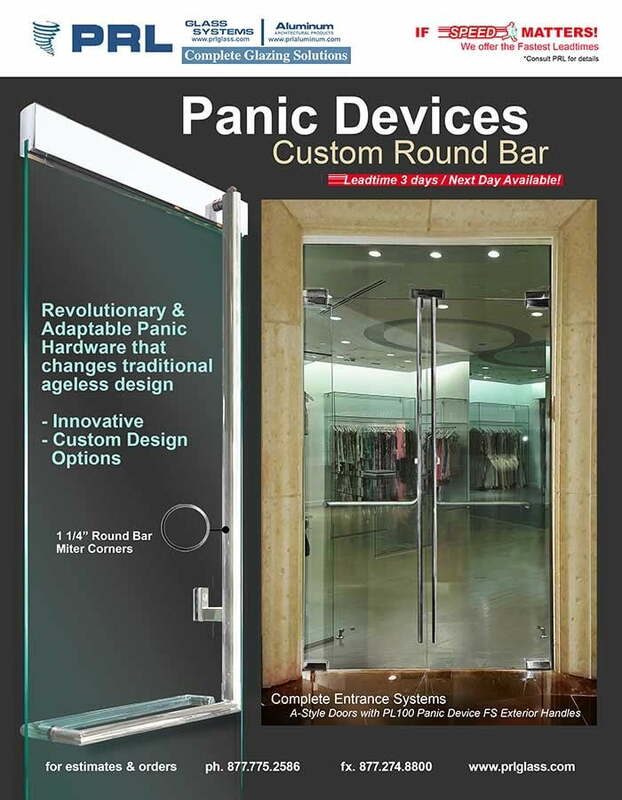 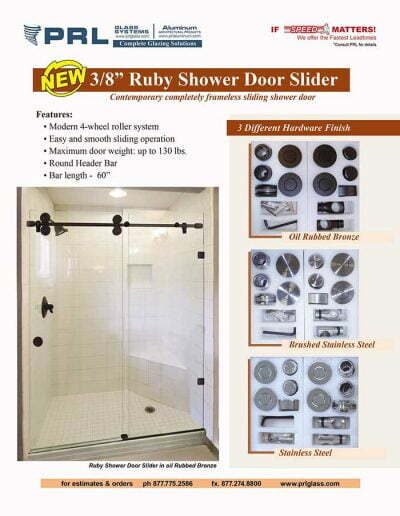 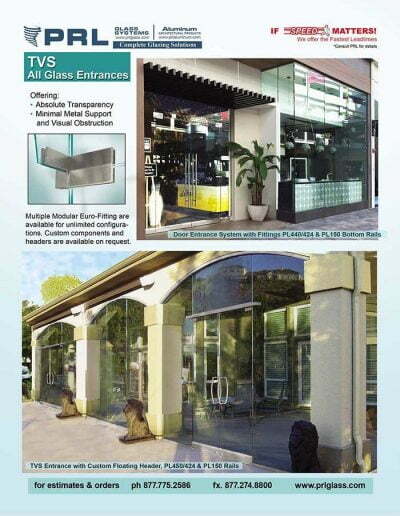 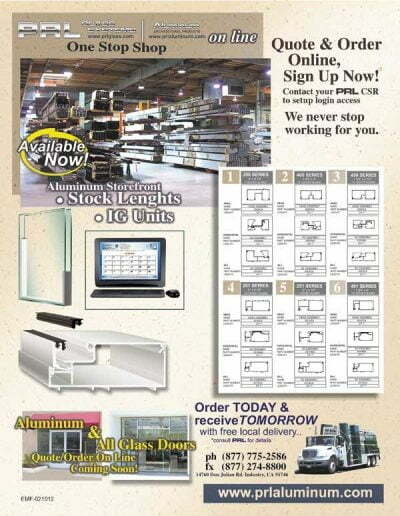 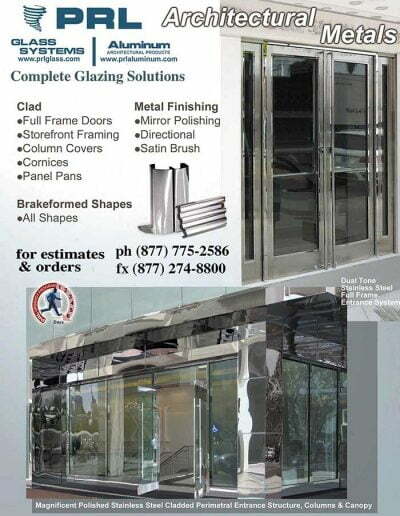 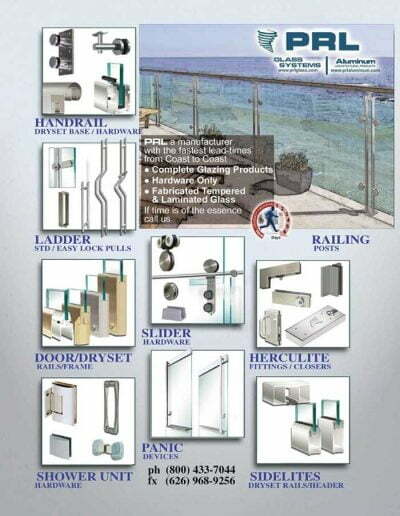 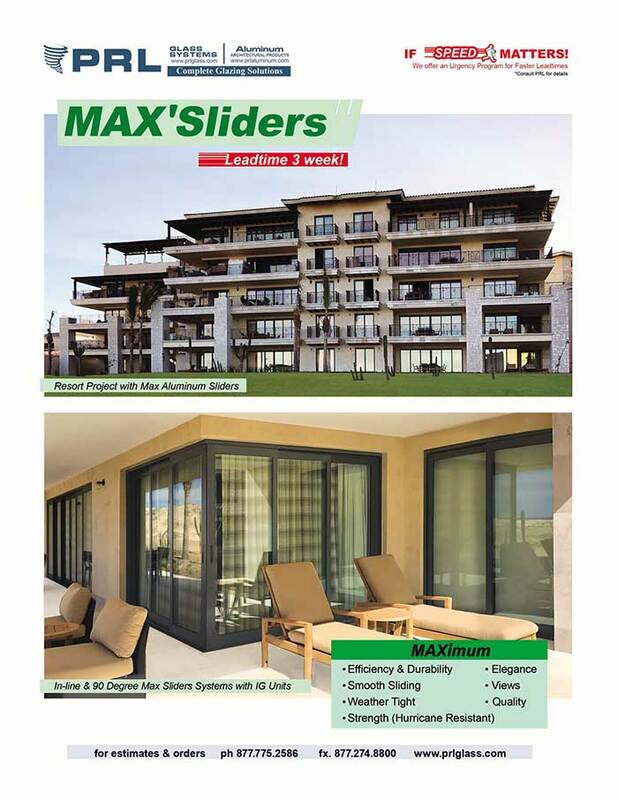 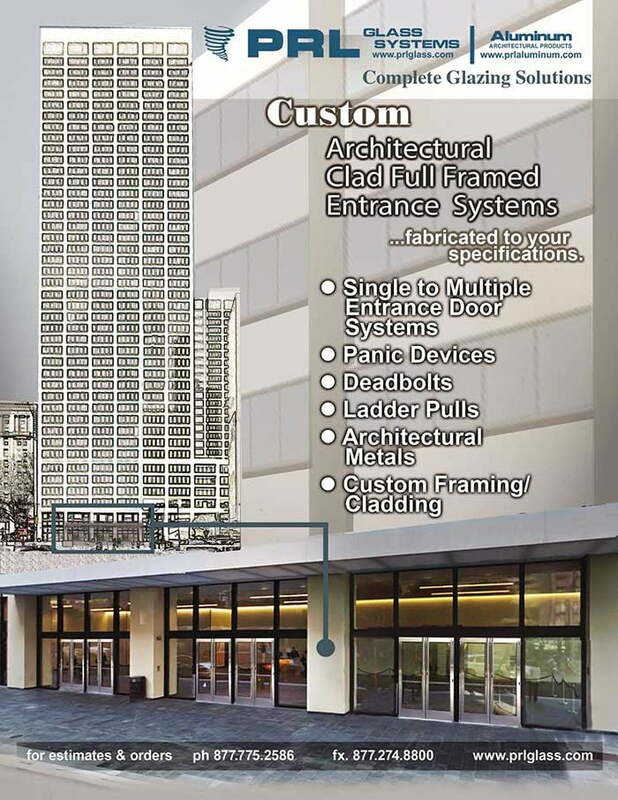 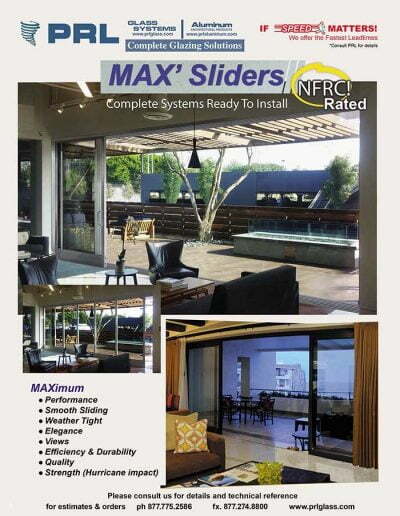 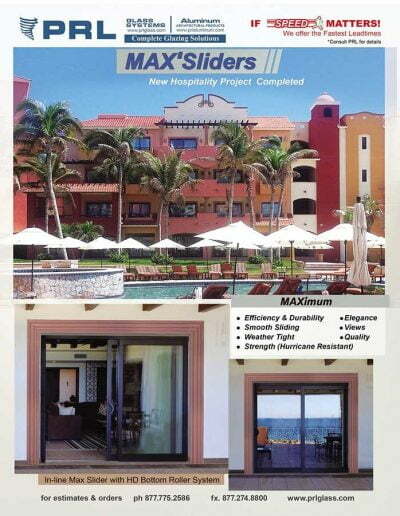 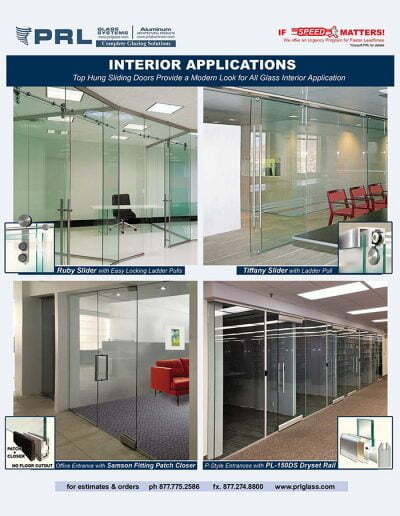 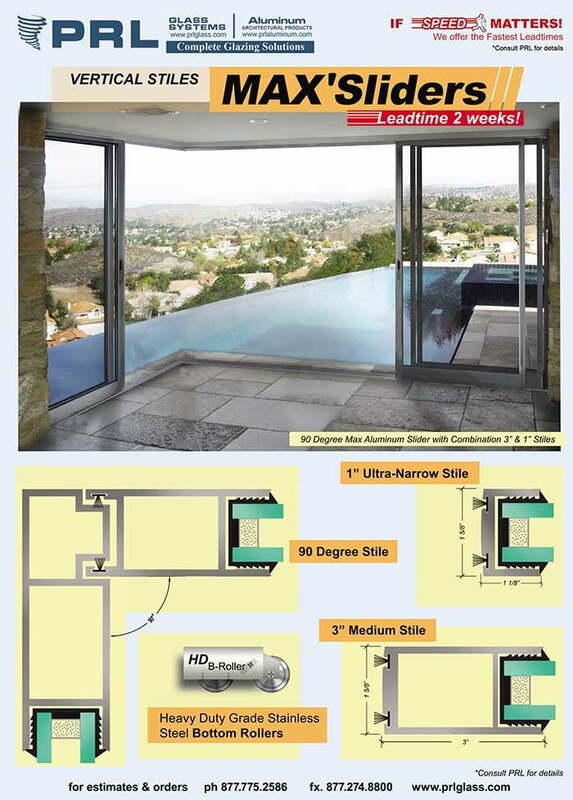 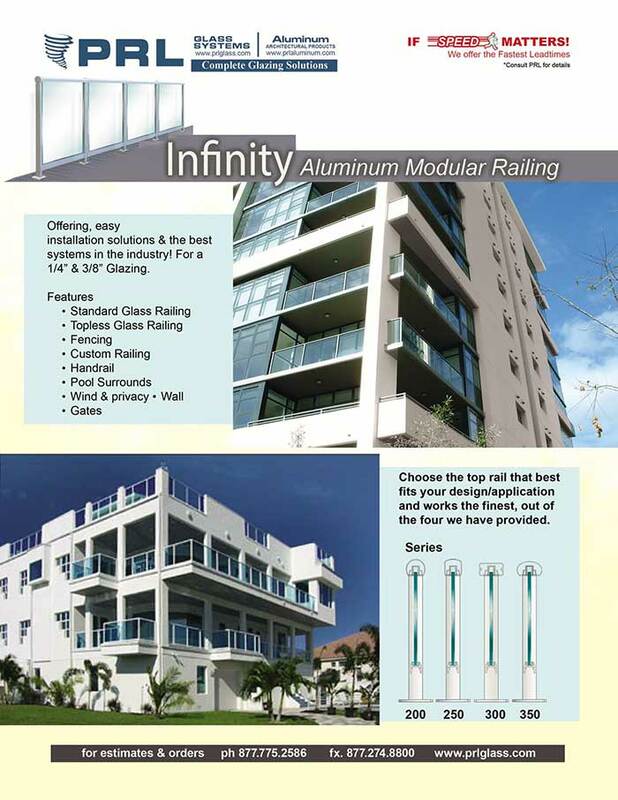 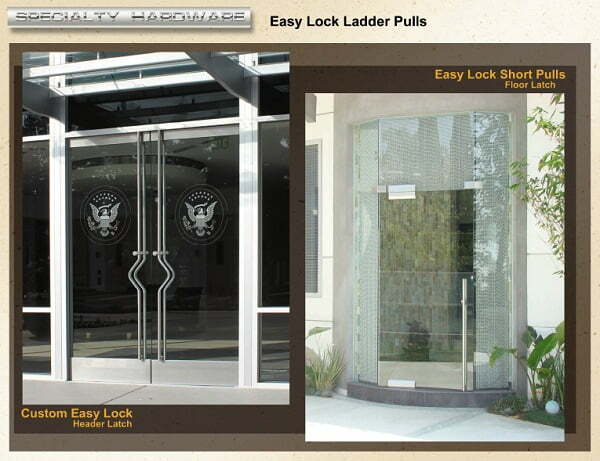 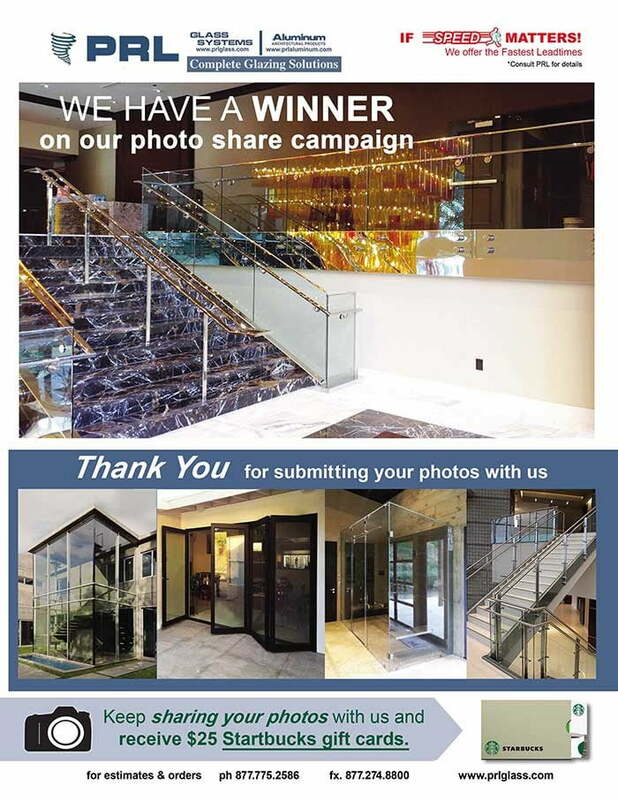 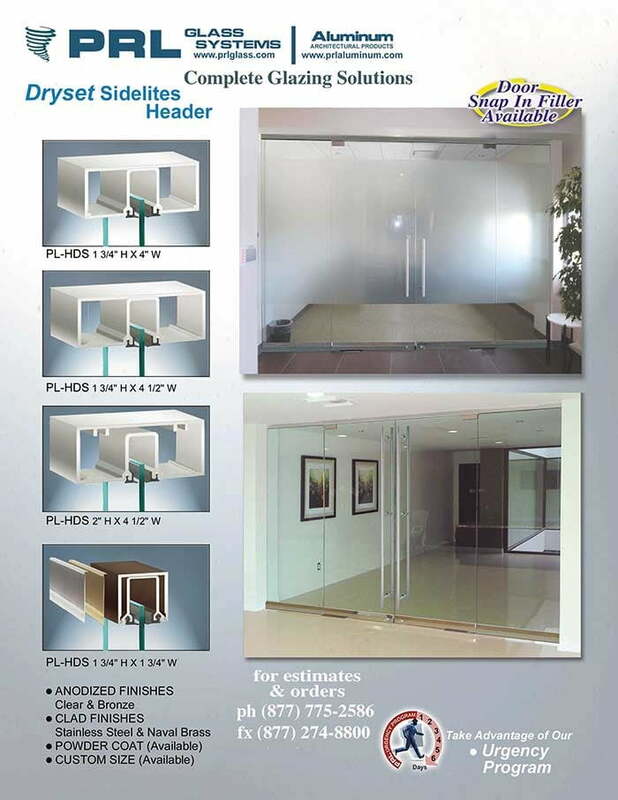 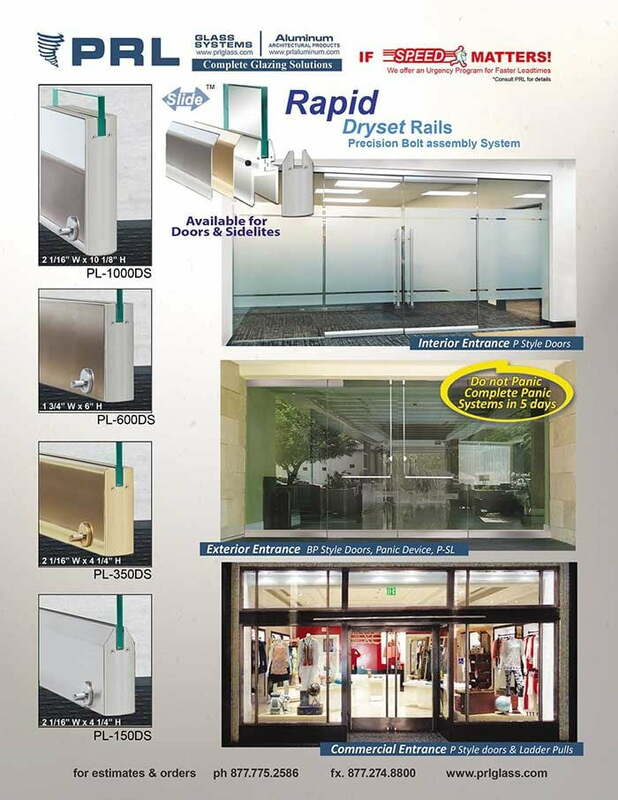 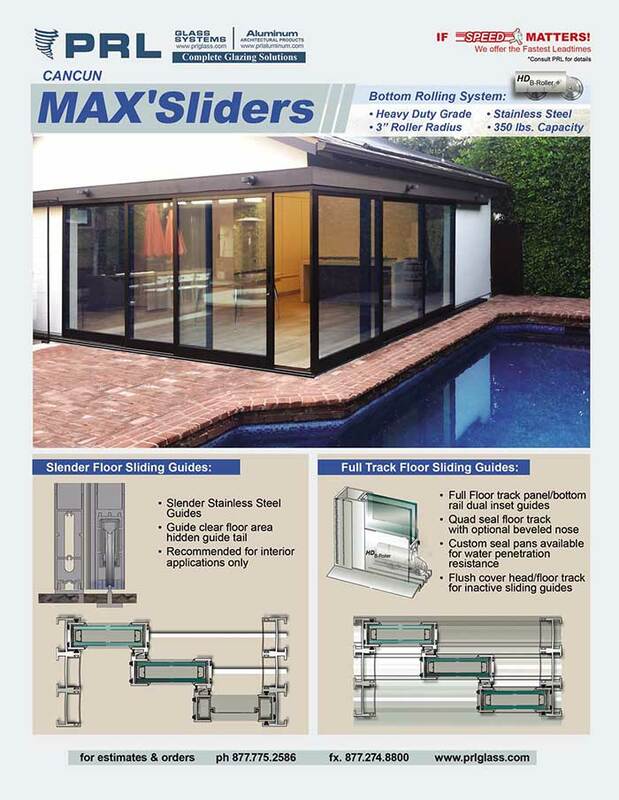 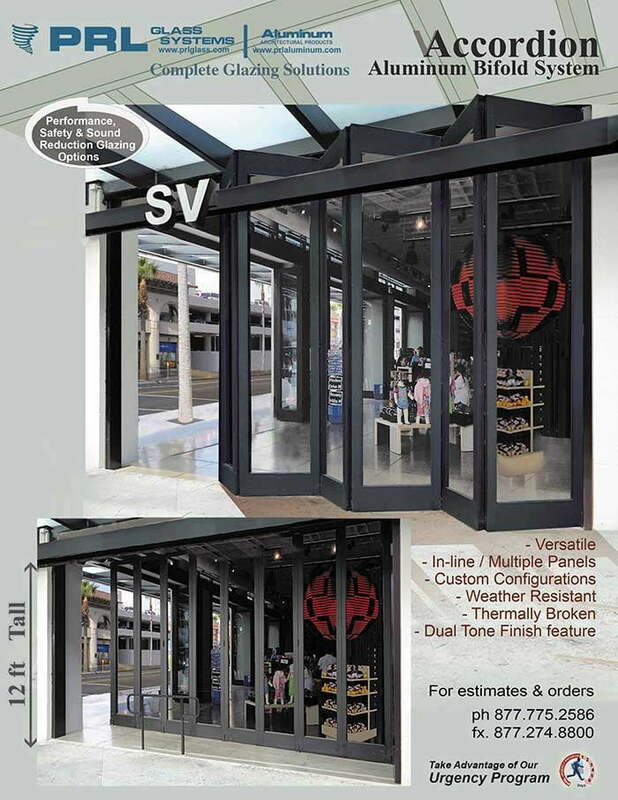 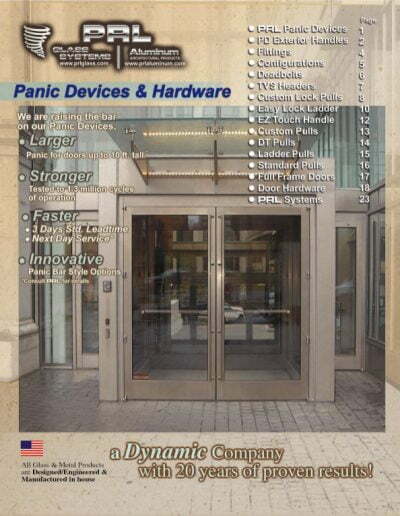 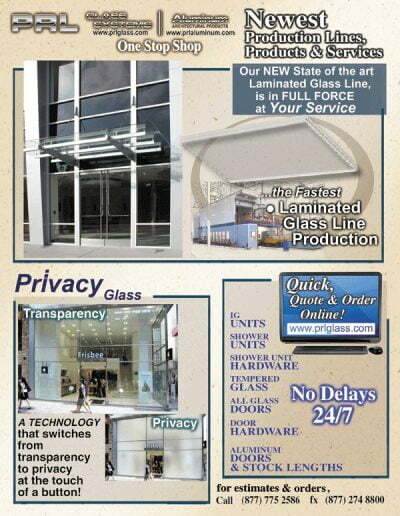 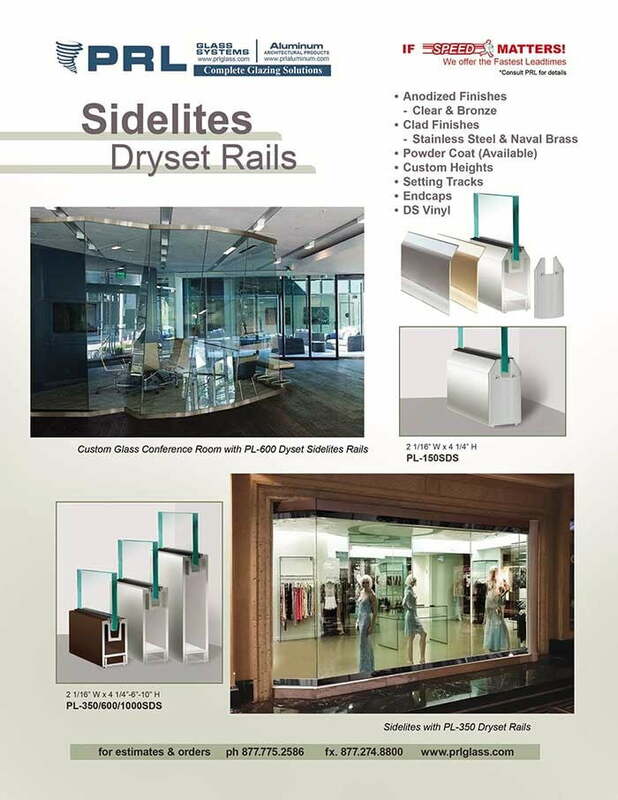 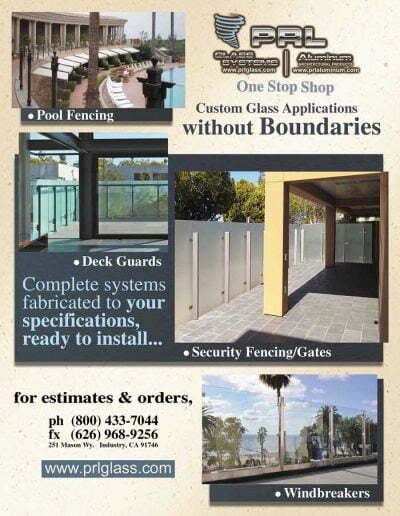 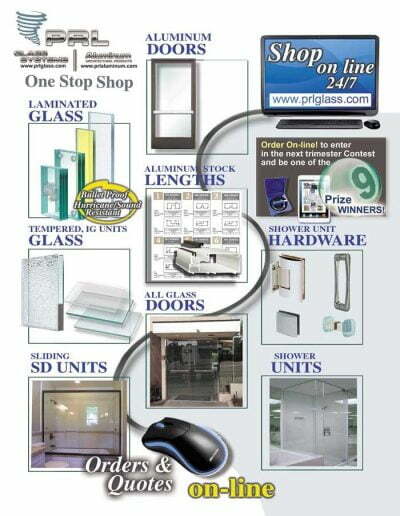 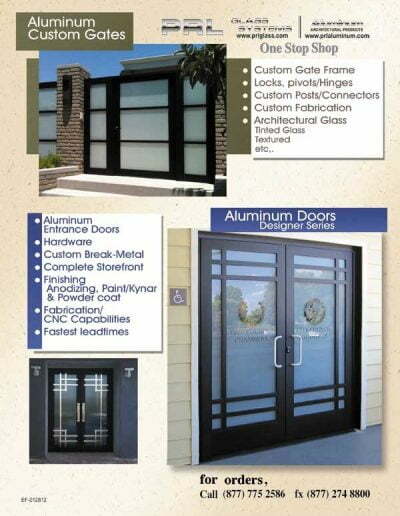 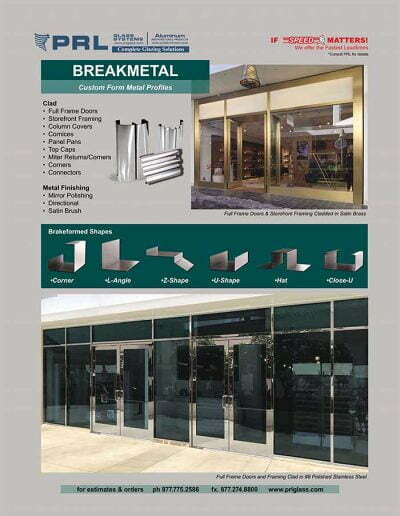 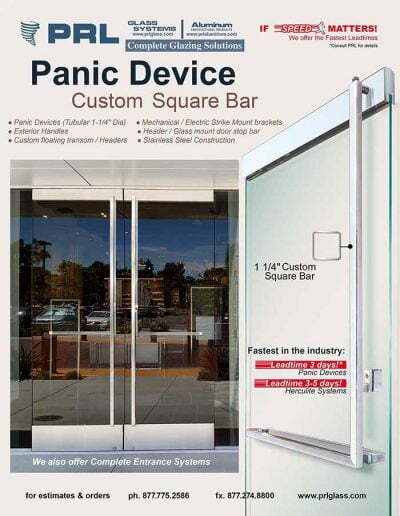 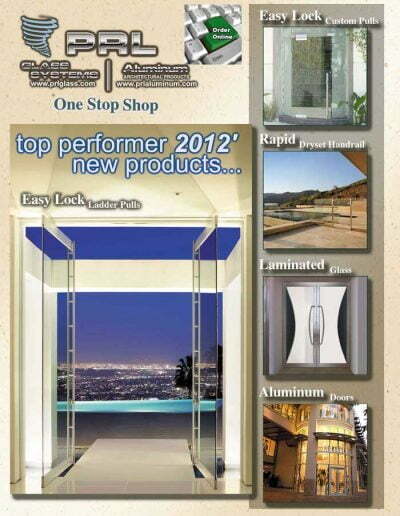 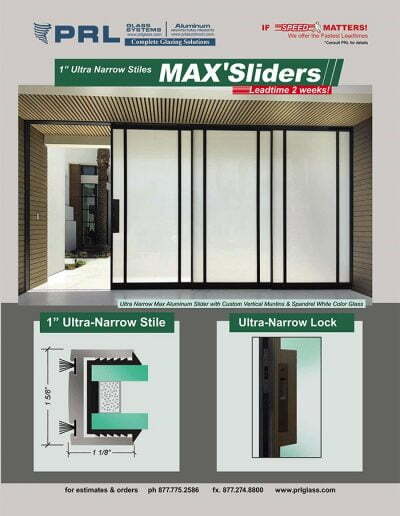 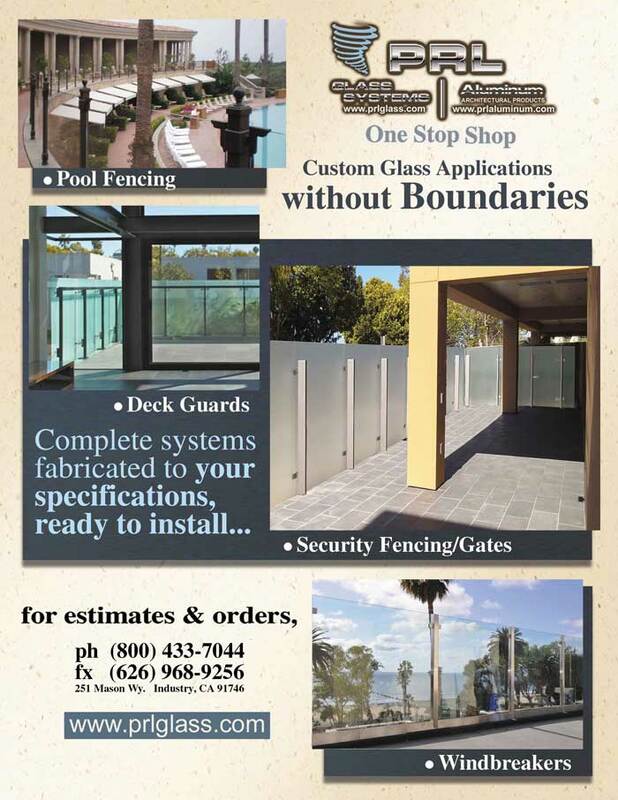 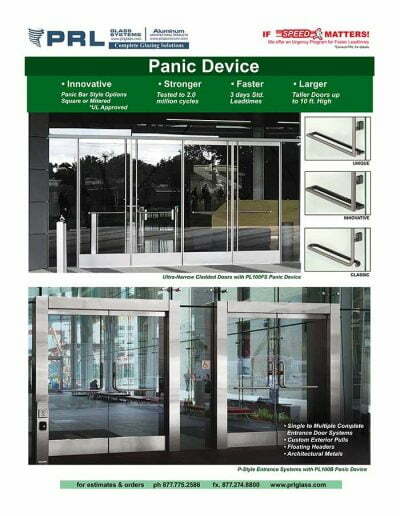 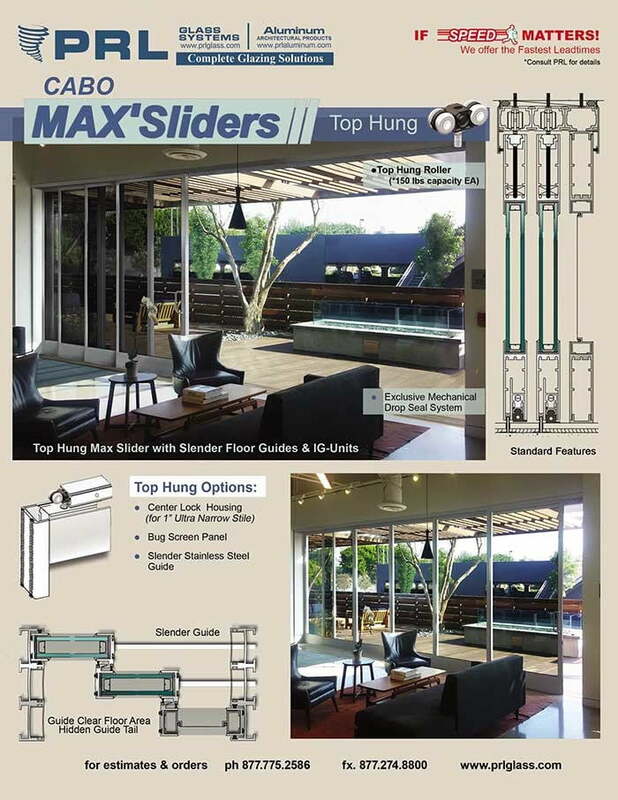 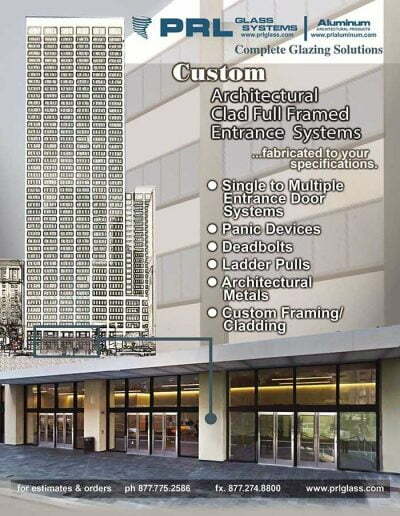 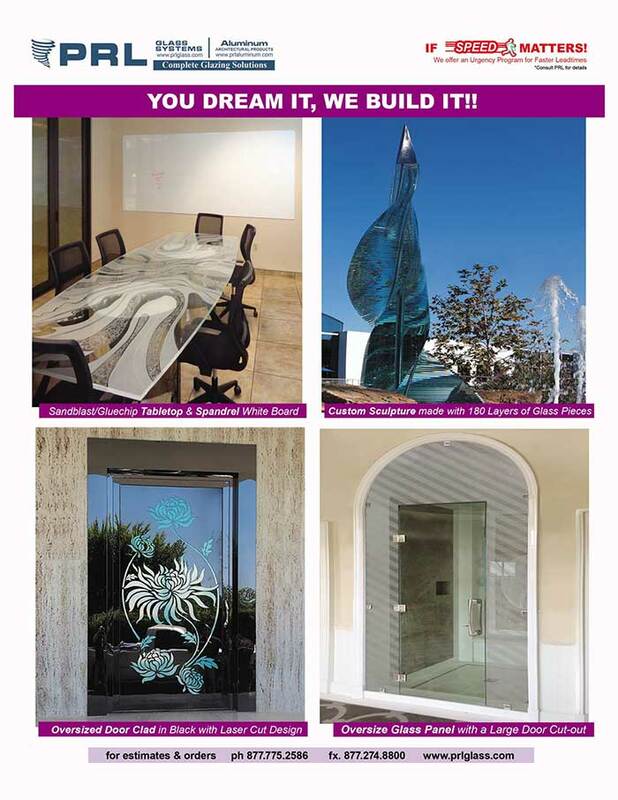 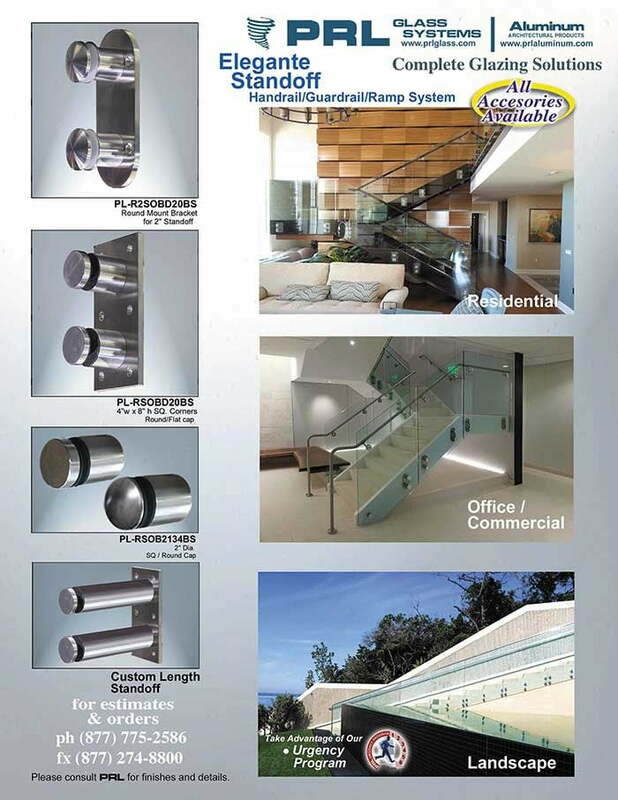 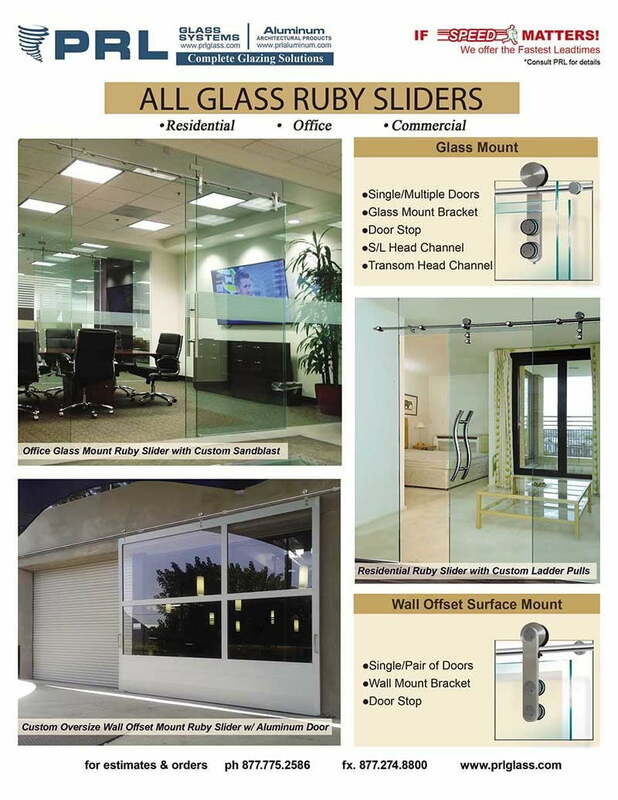 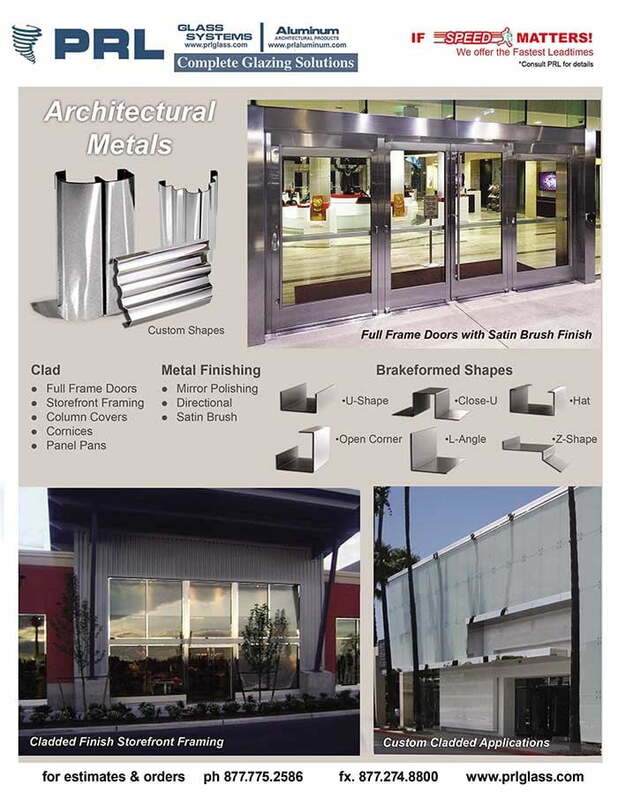 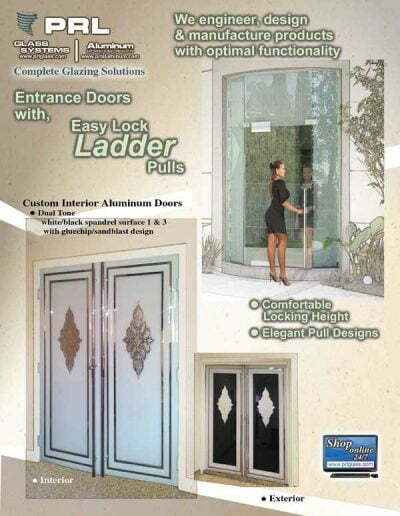 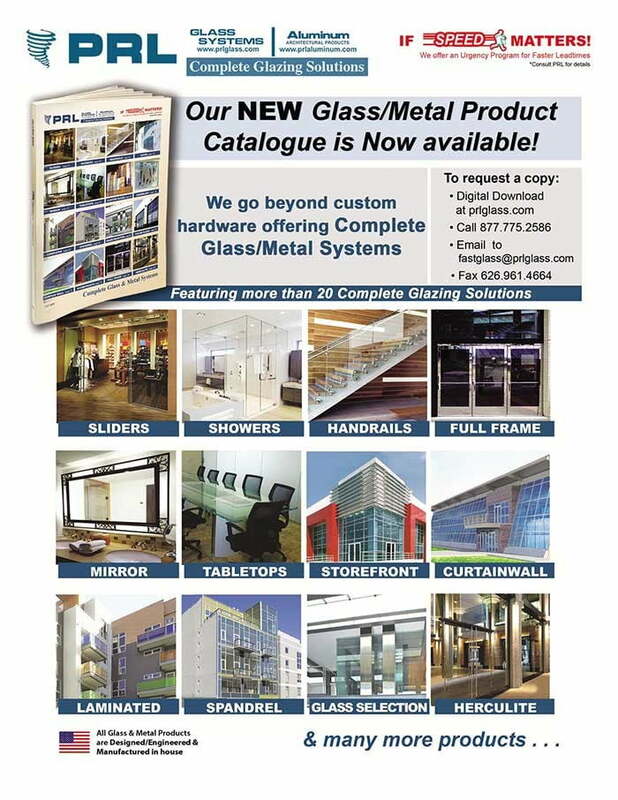 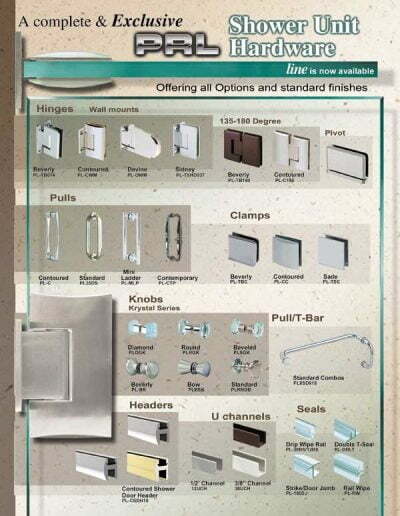 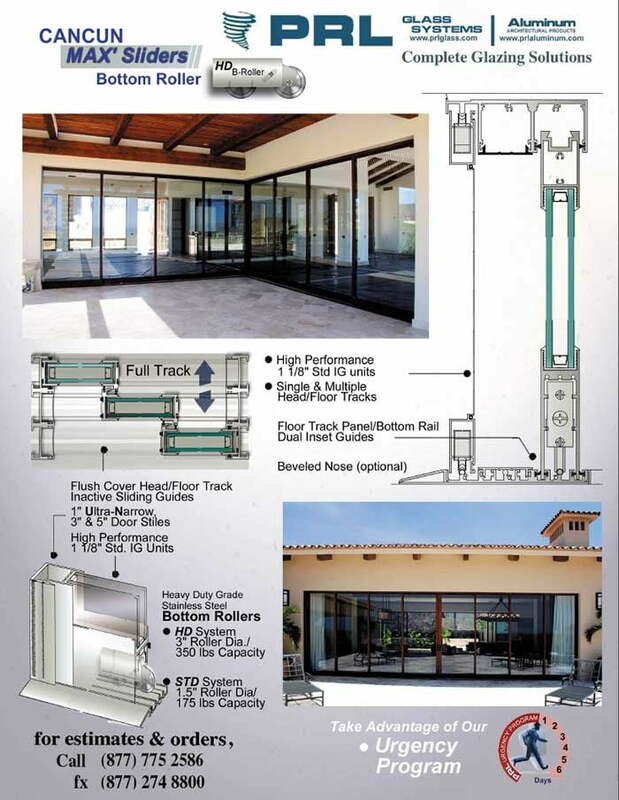 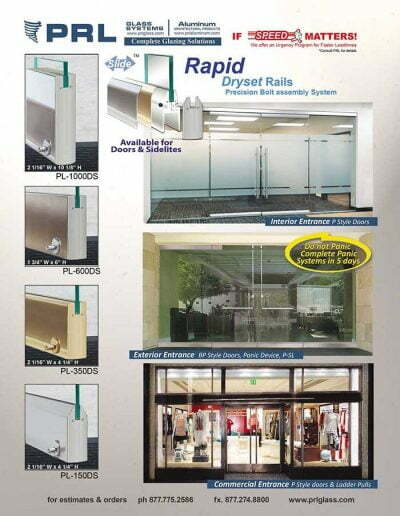 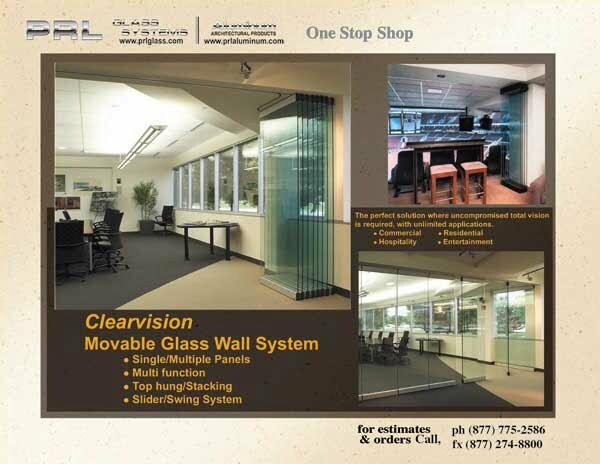 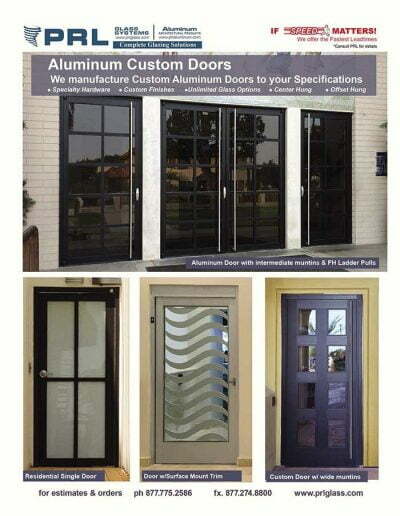 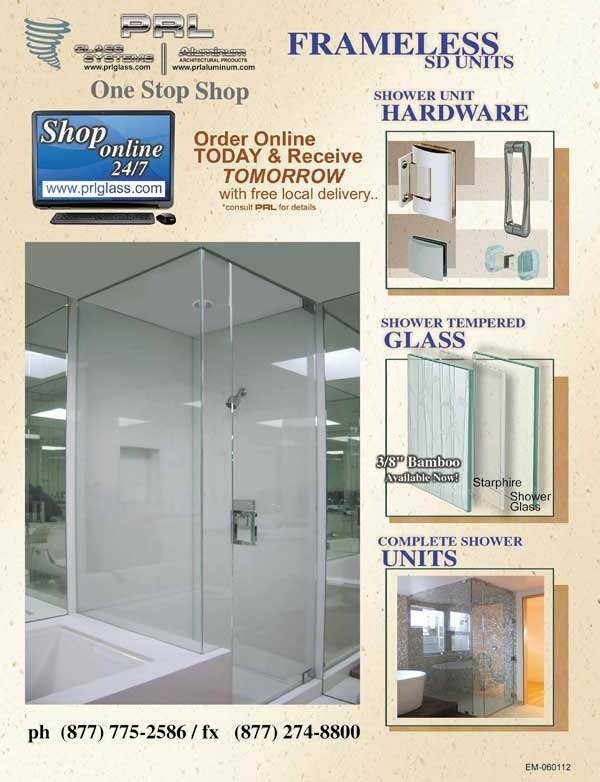 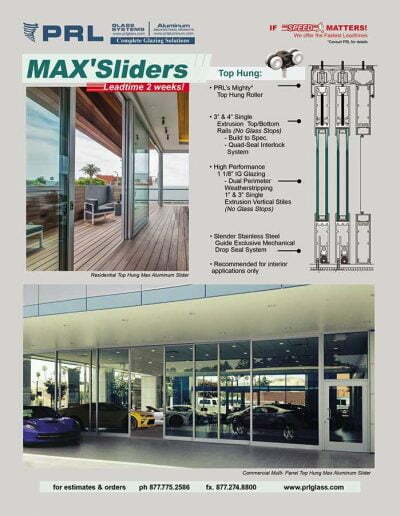 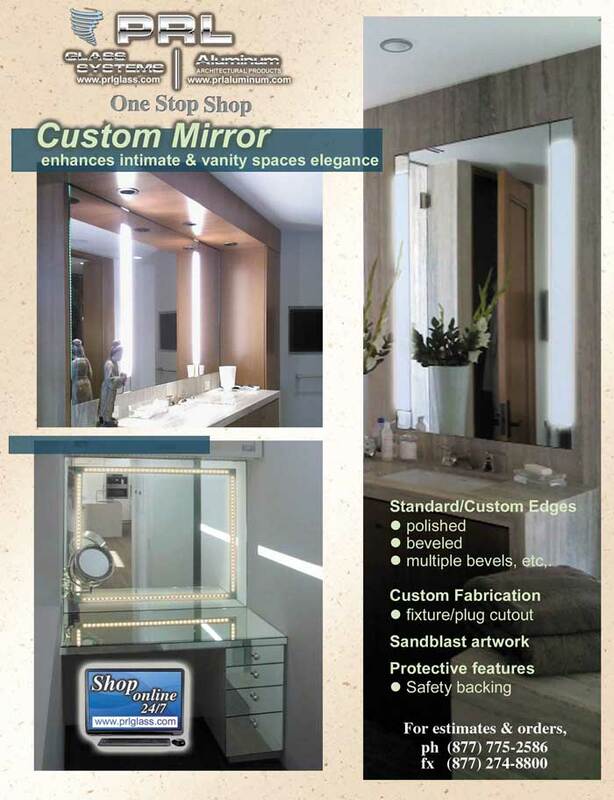 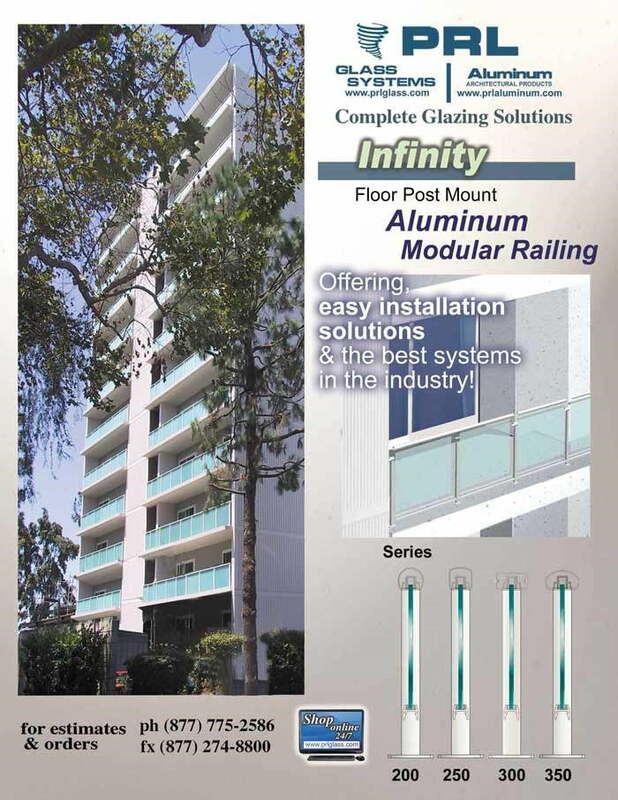 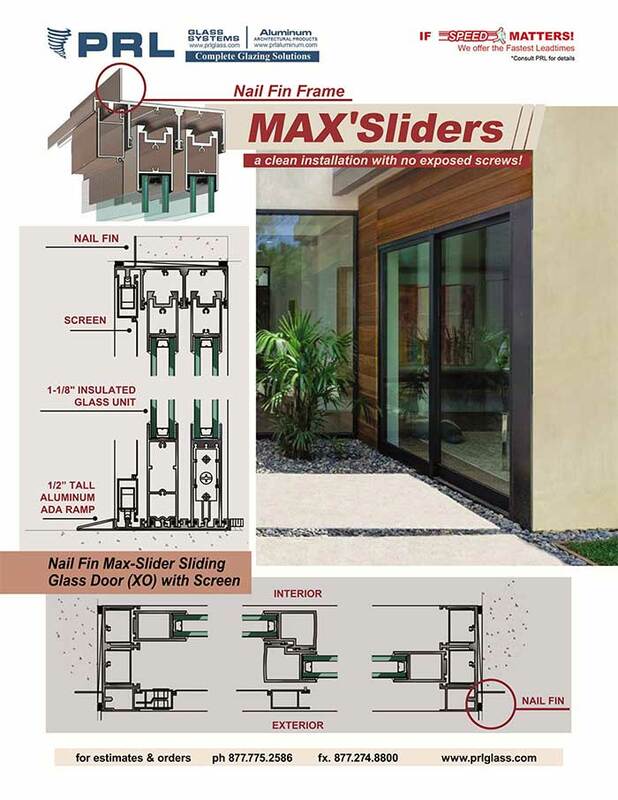 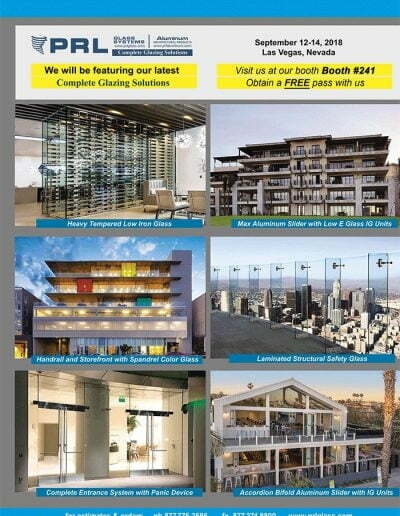 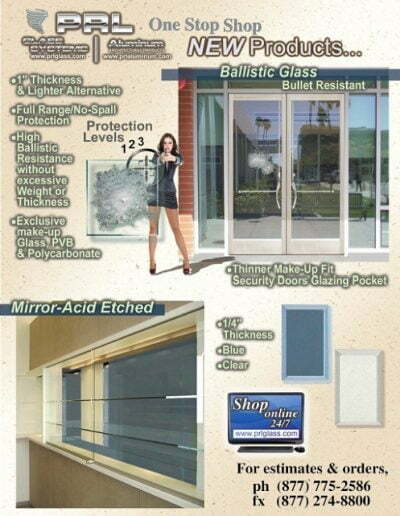 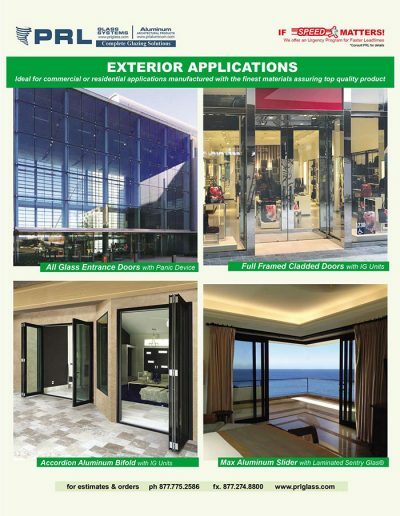 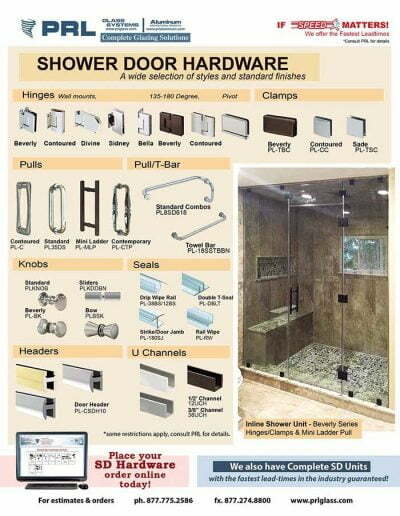 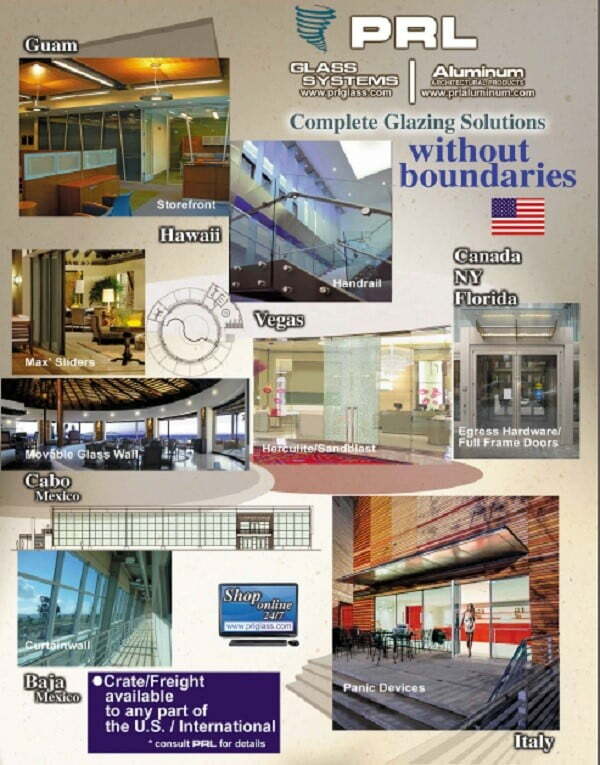 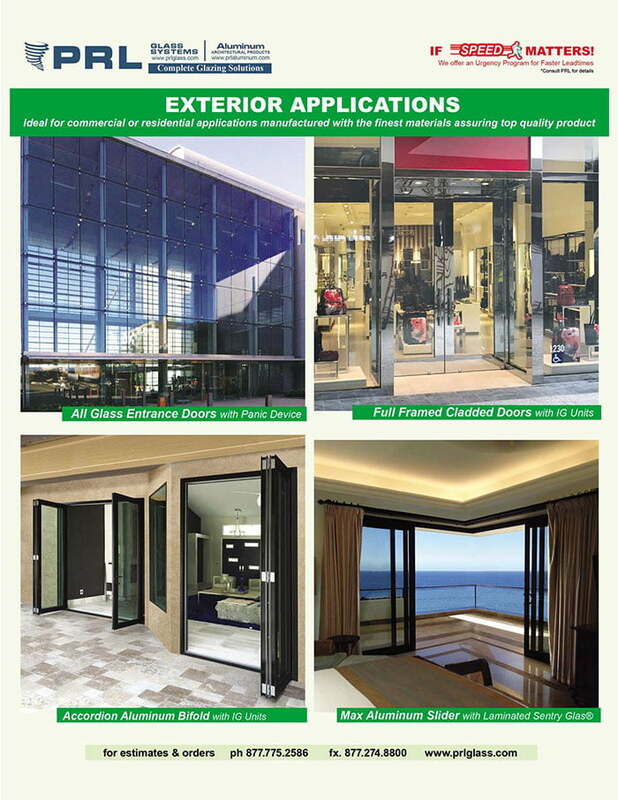 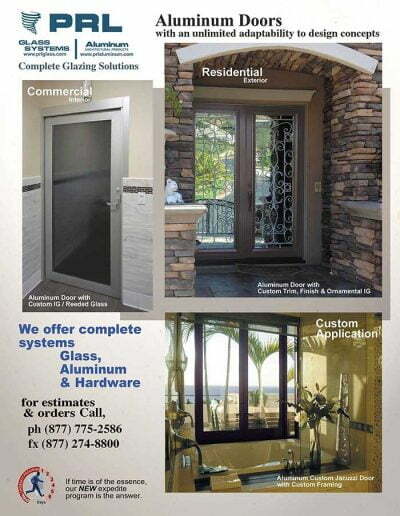 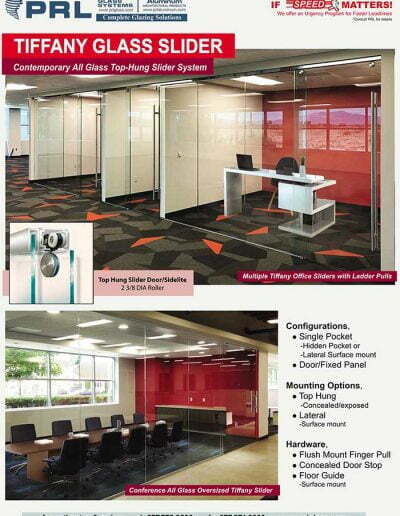 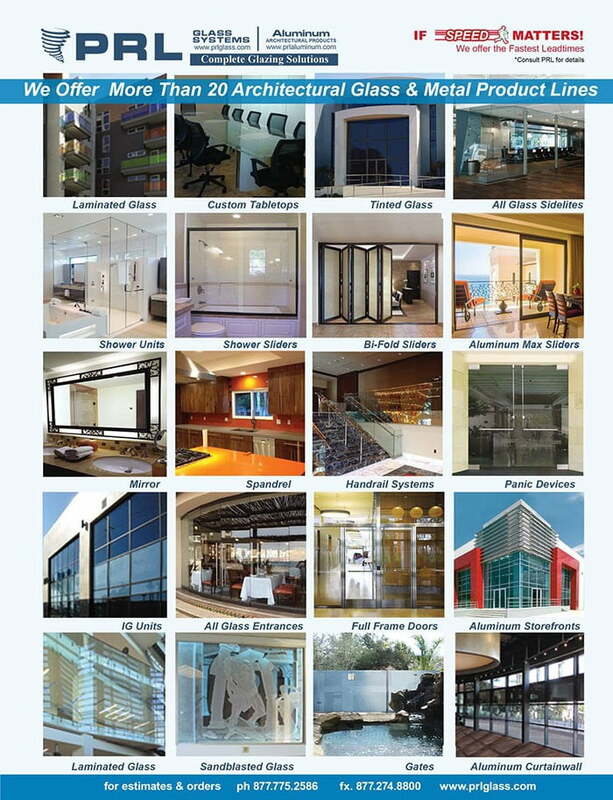 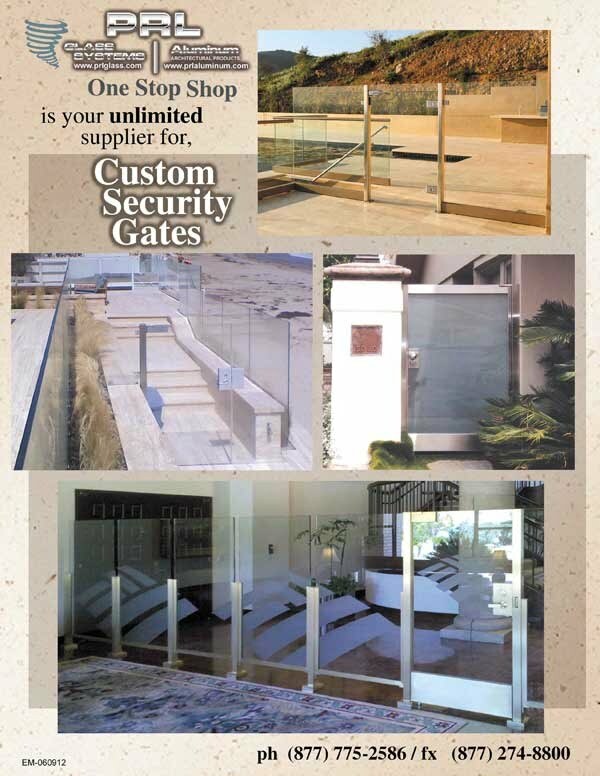 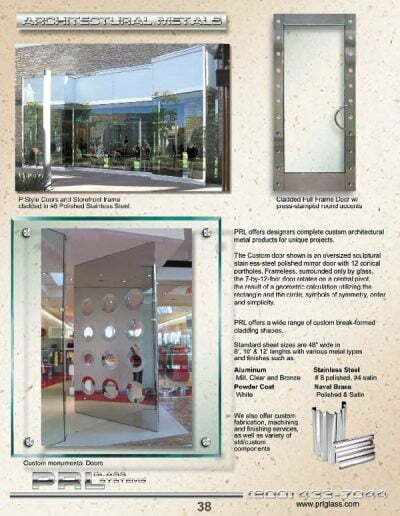 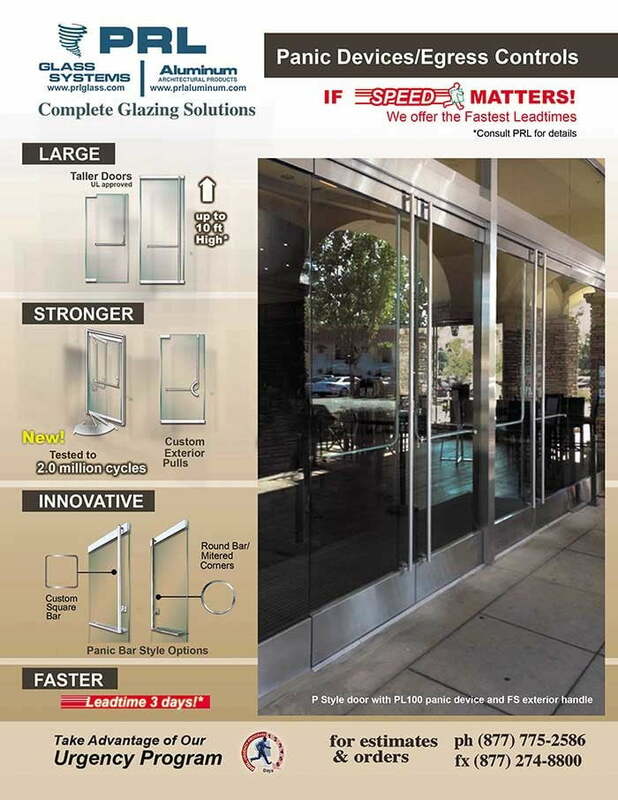 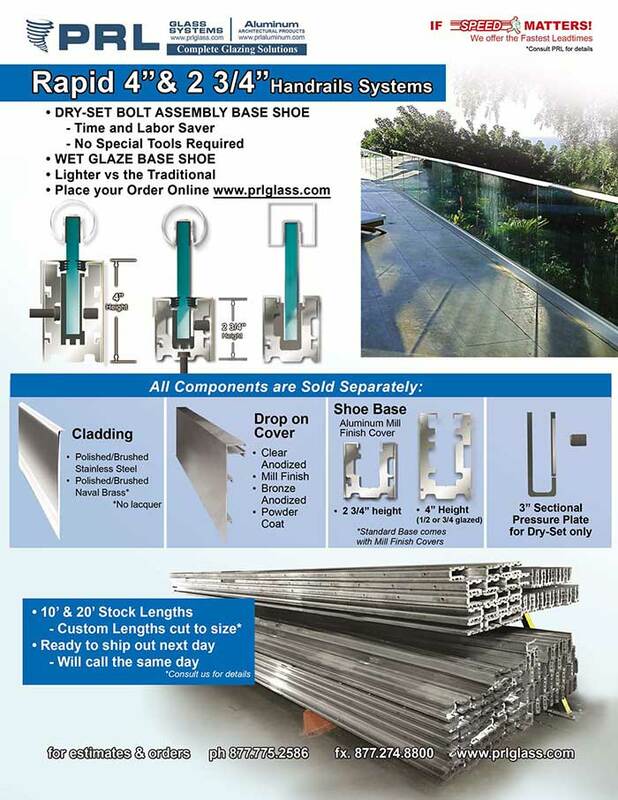 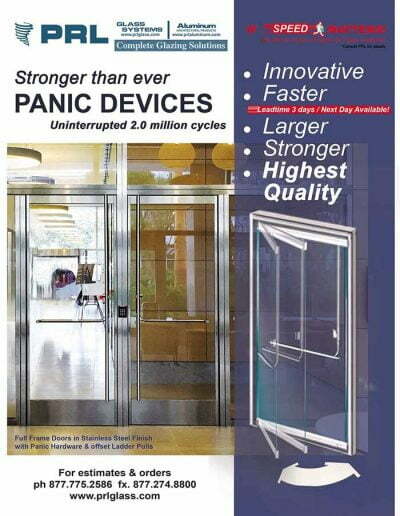 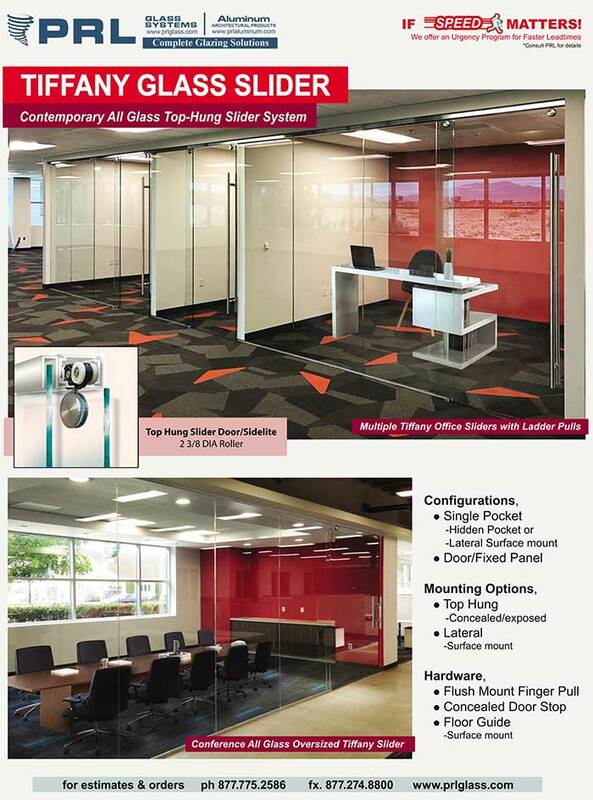 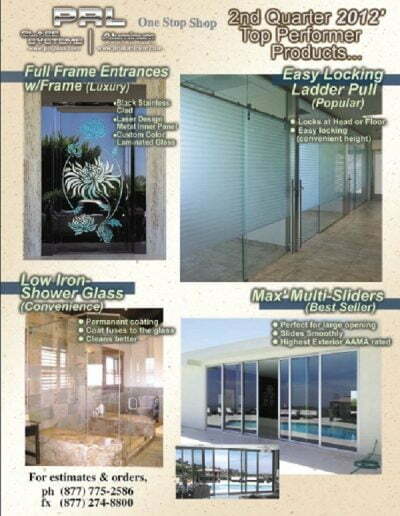 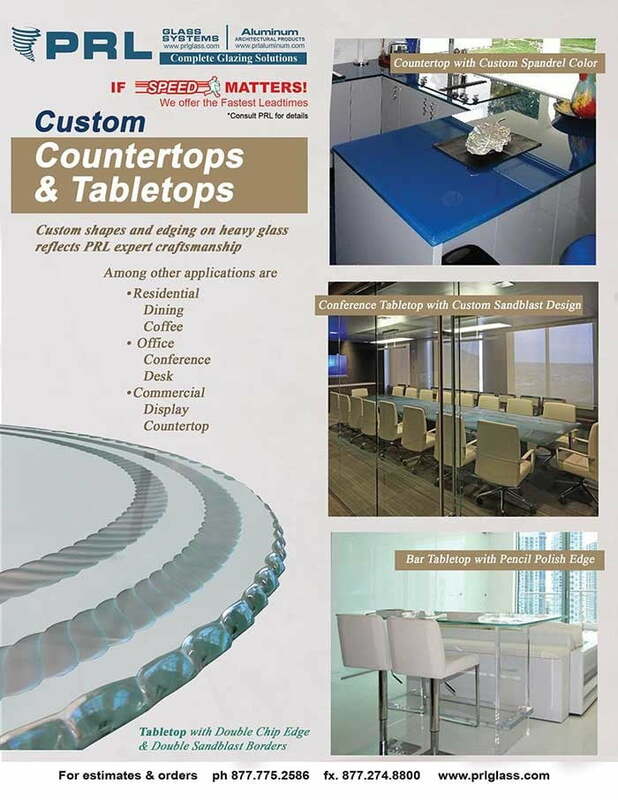 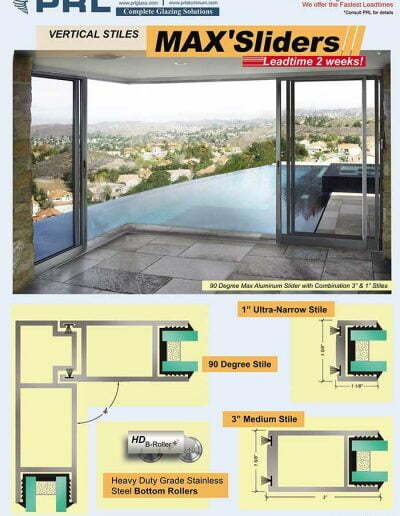 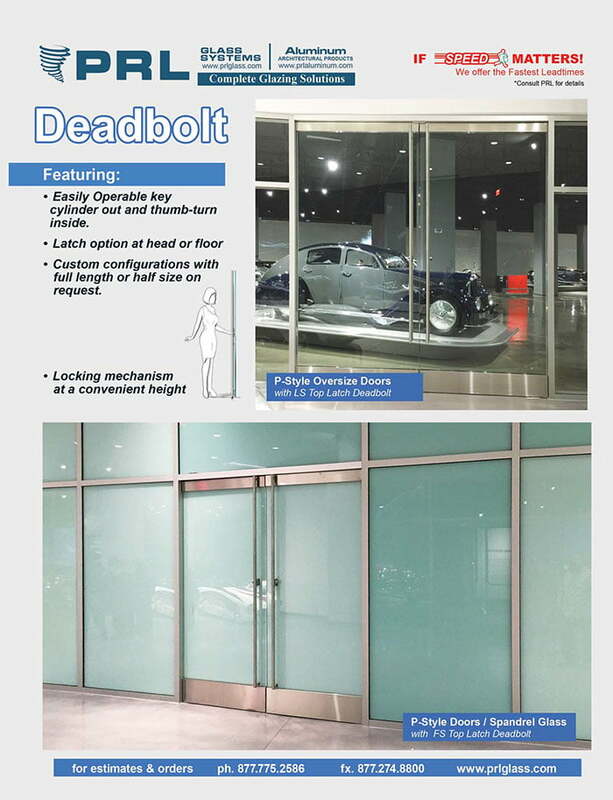 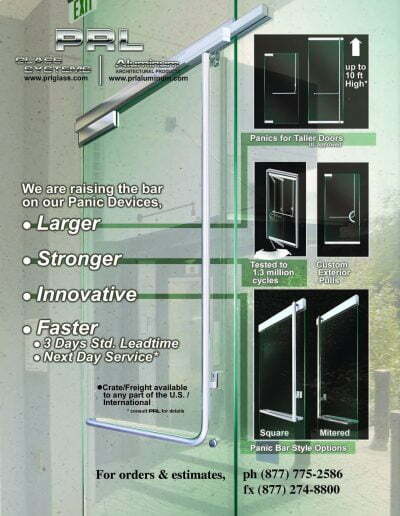 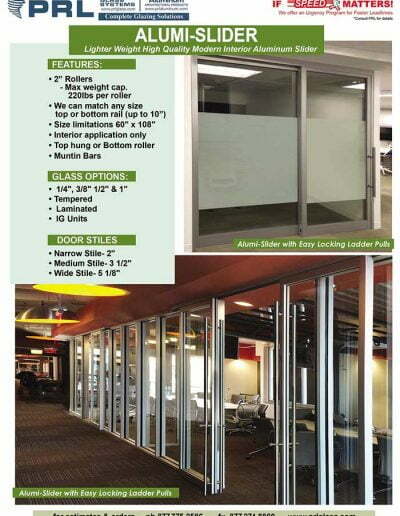 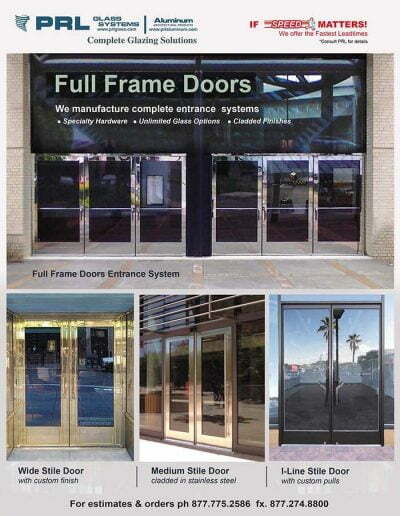 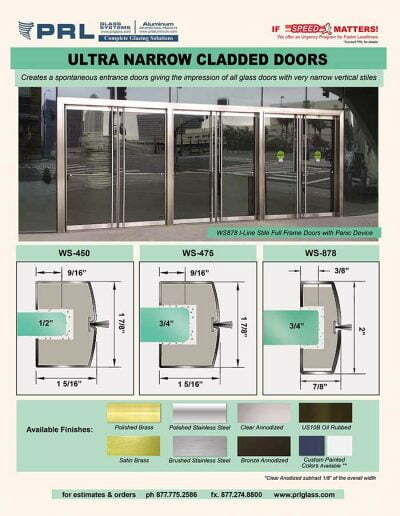 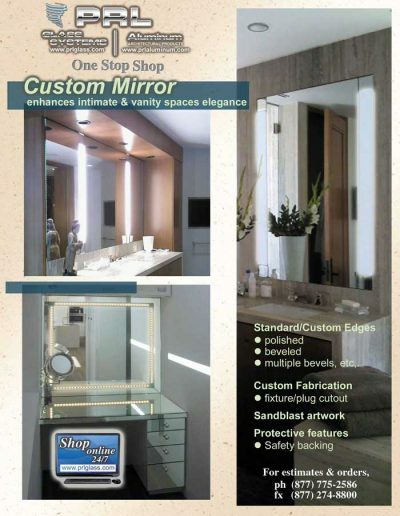 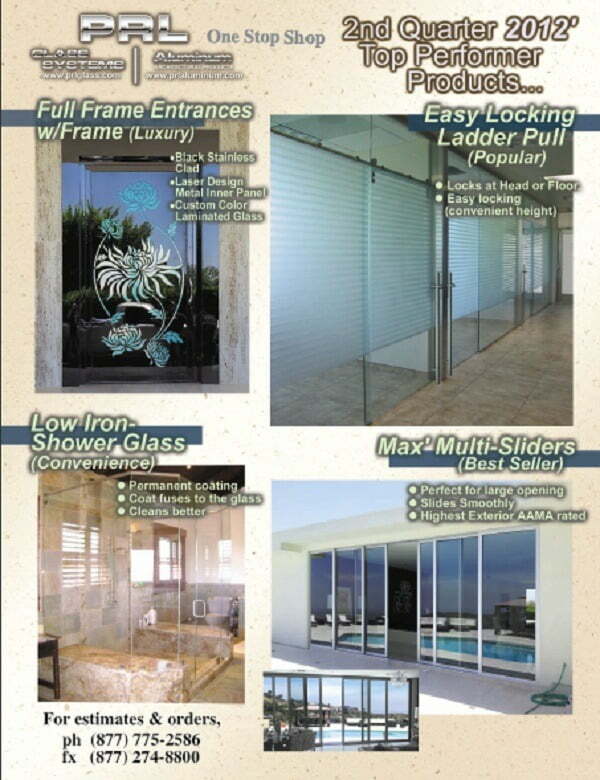 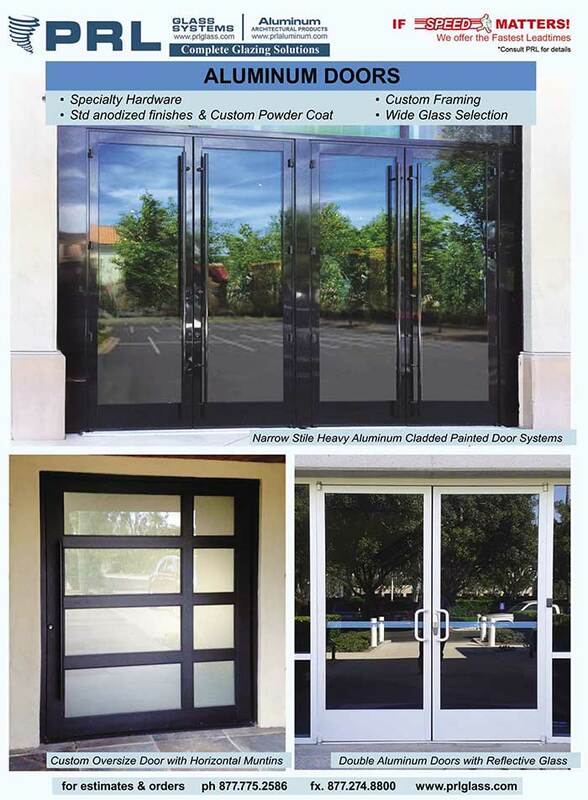 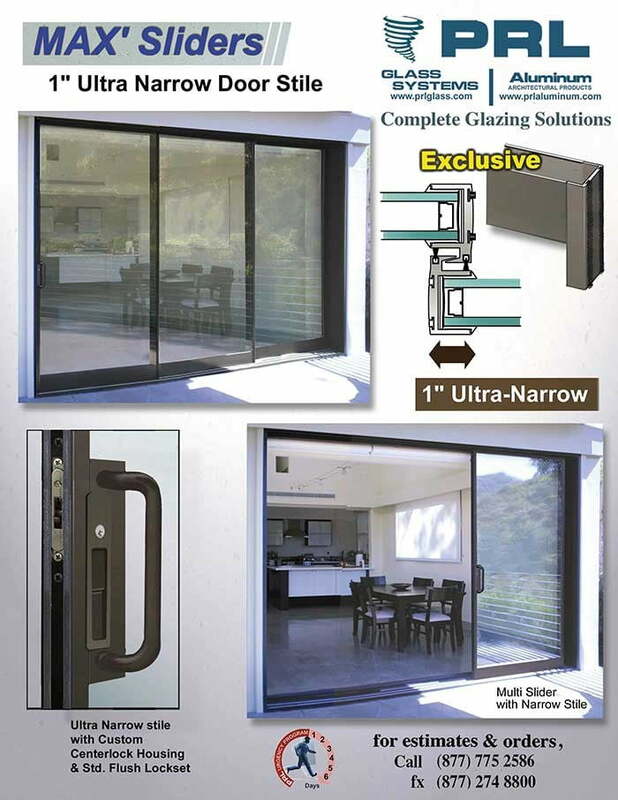 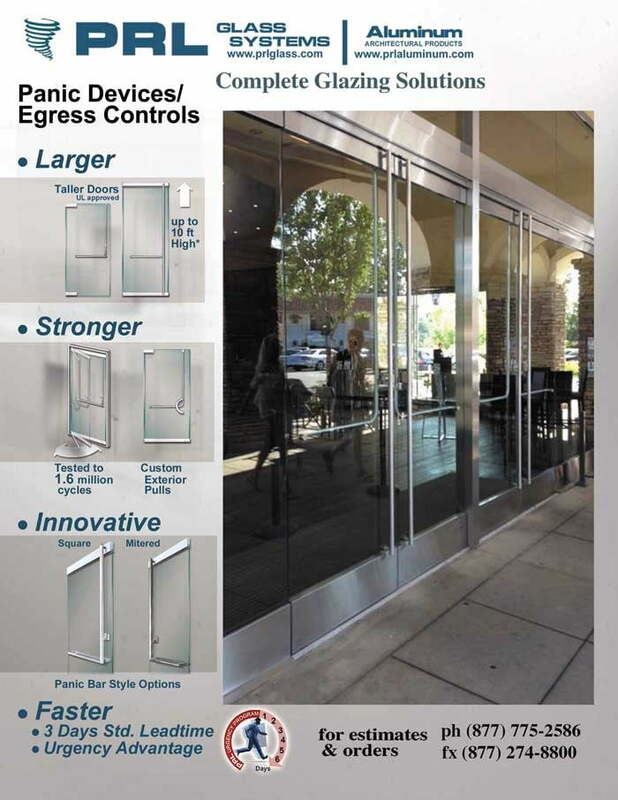 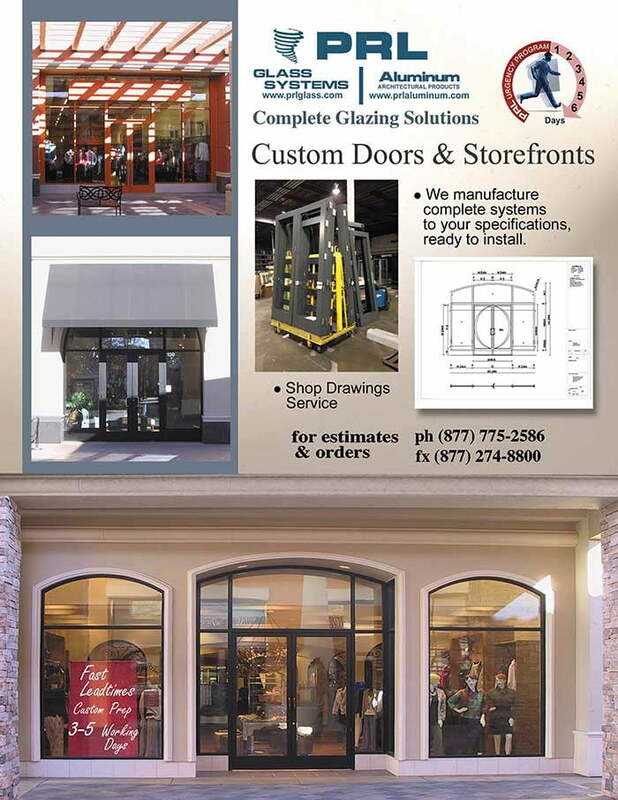 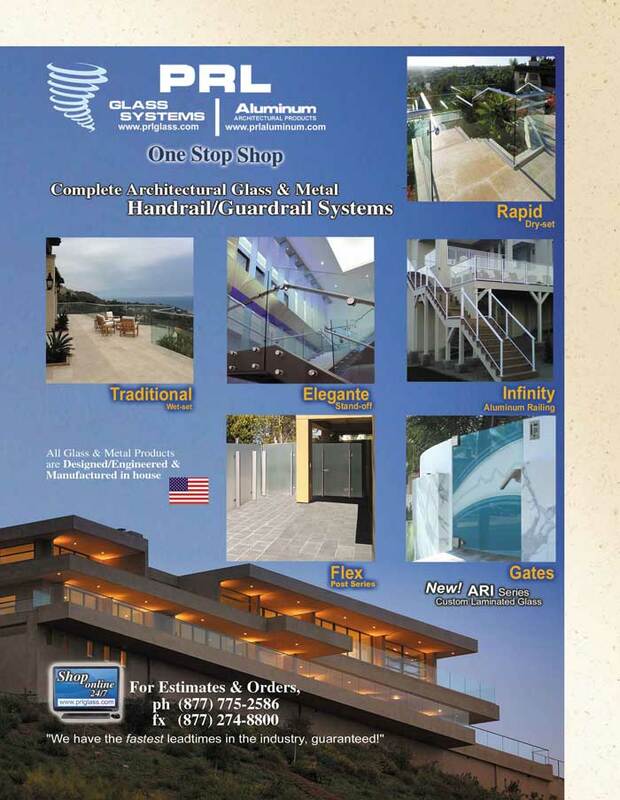 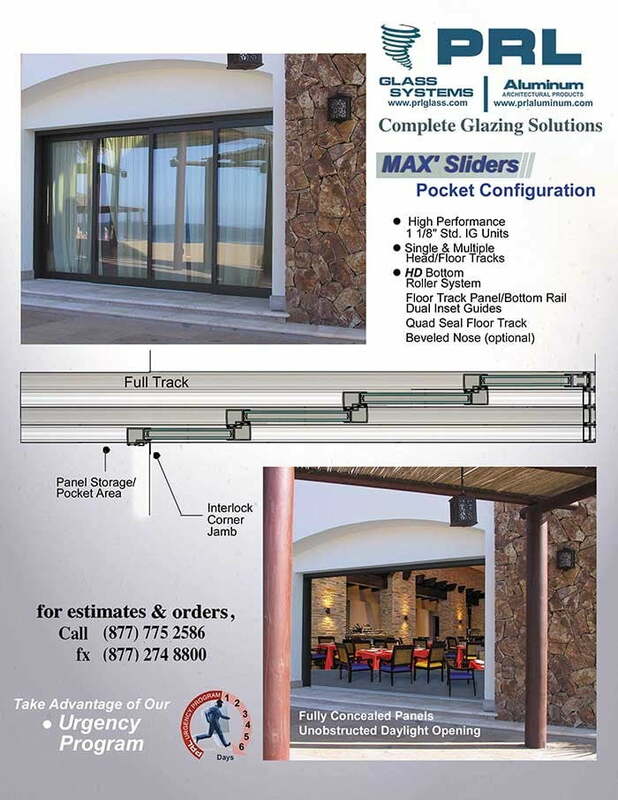 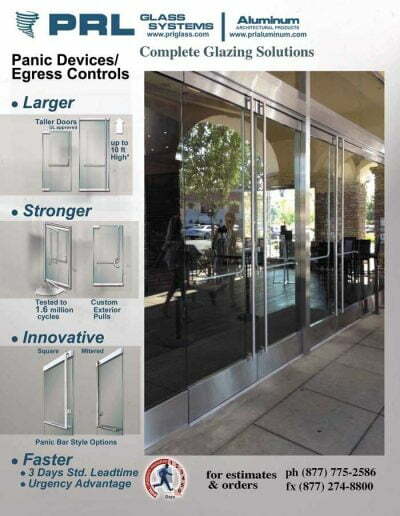 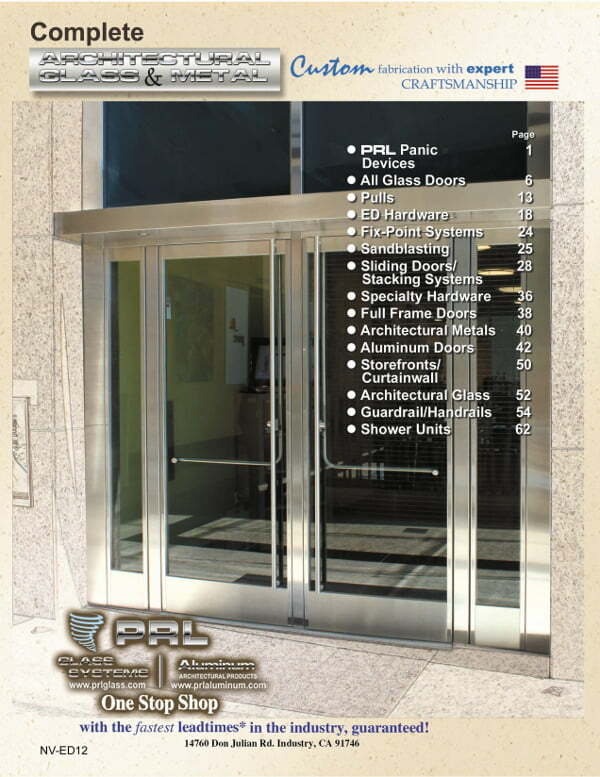 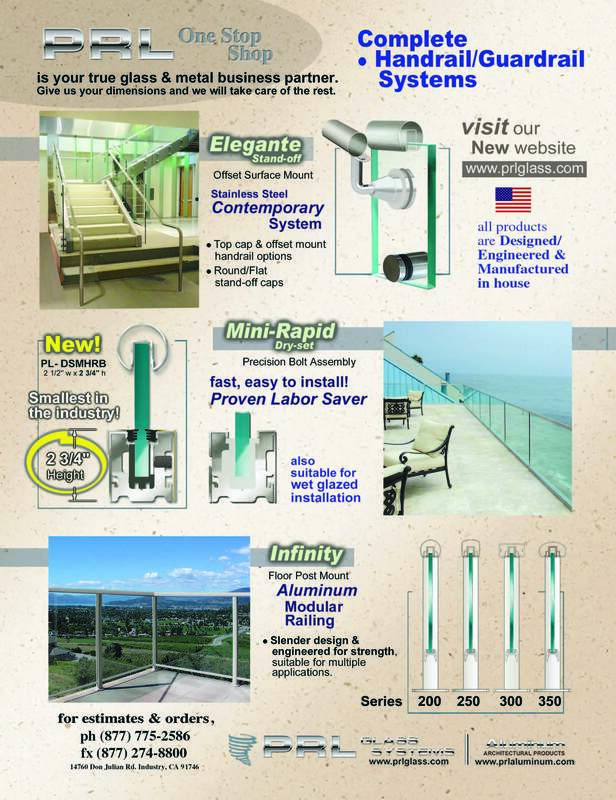 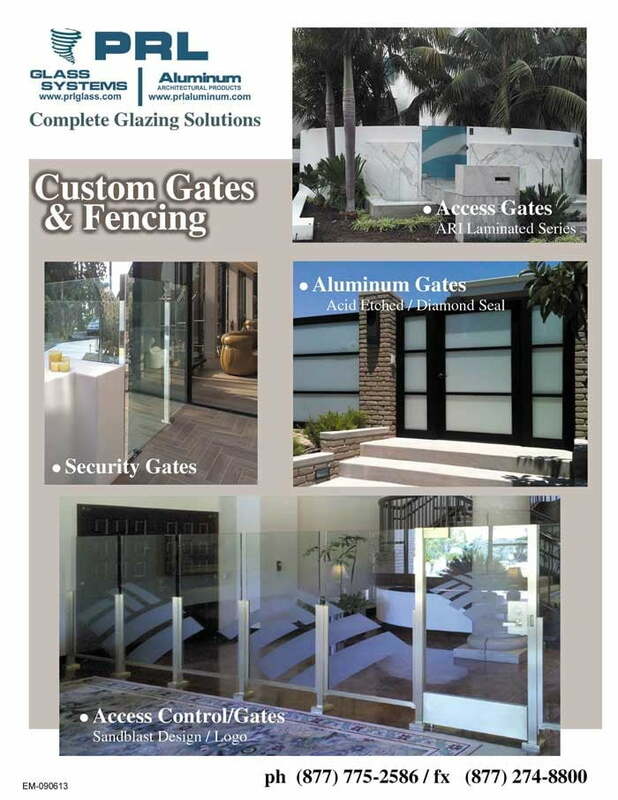 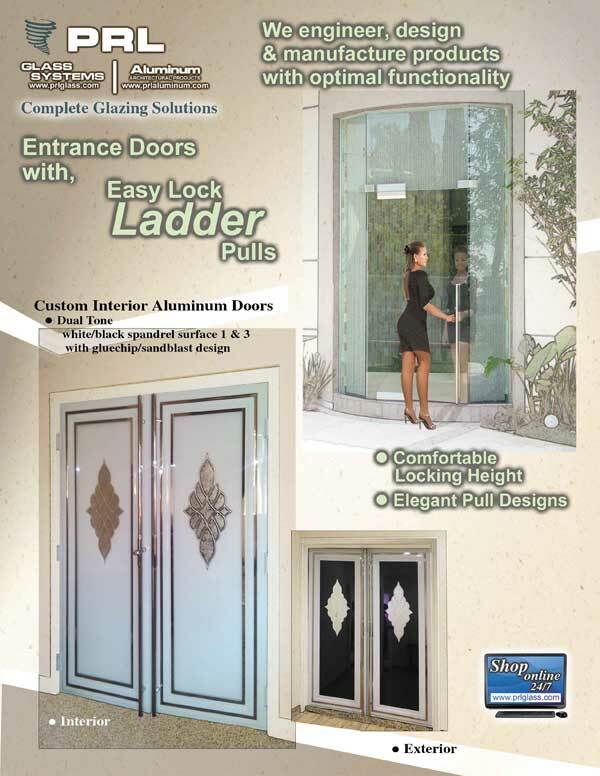 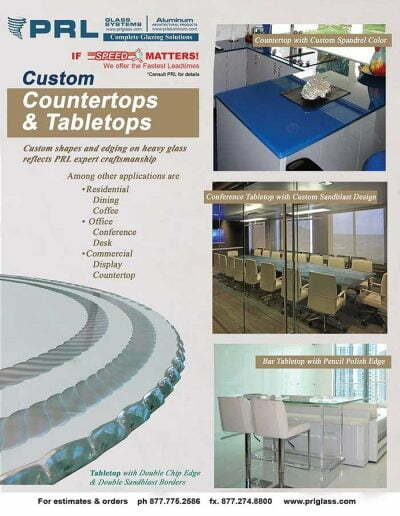 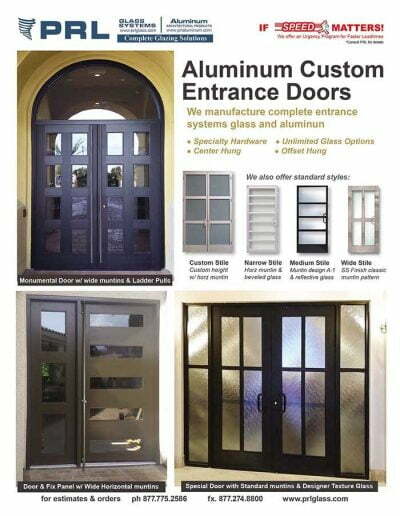 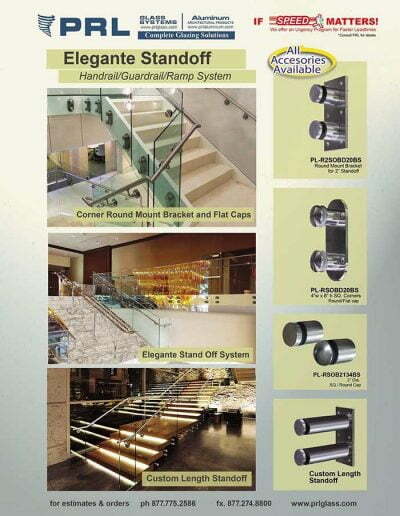 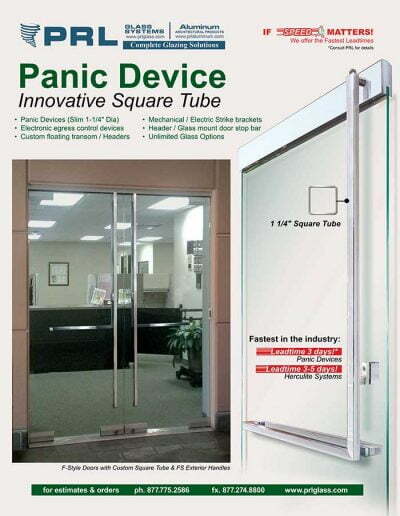 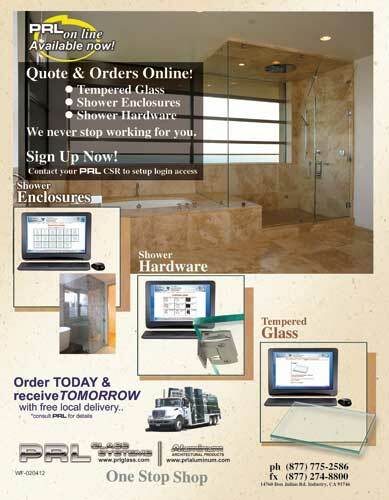 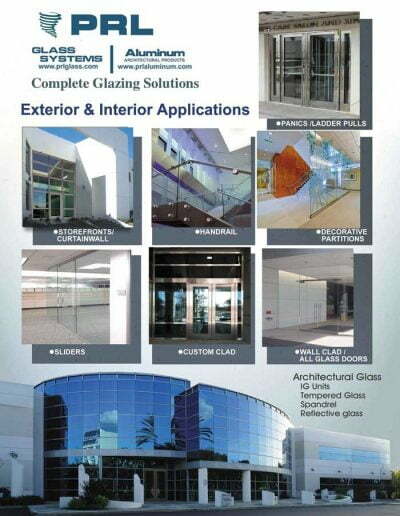 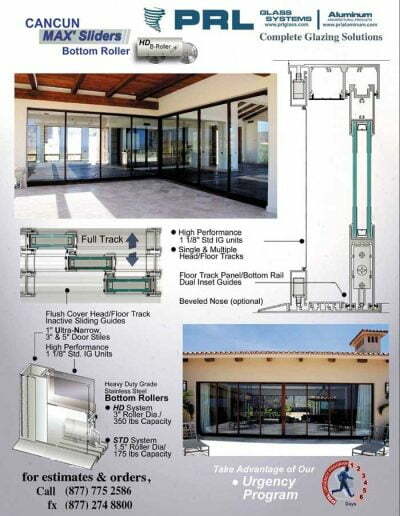 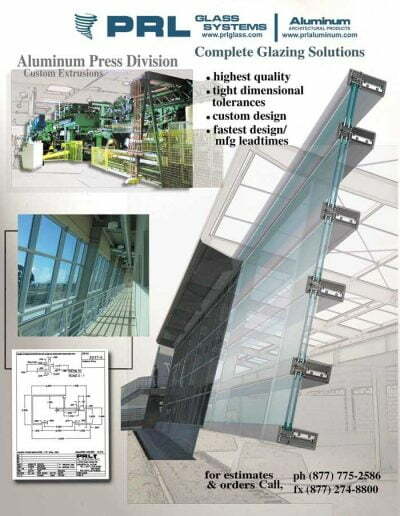 One stop shop is our motto; as we also provide aluminum doors, storefront and complete curtain wall systems.